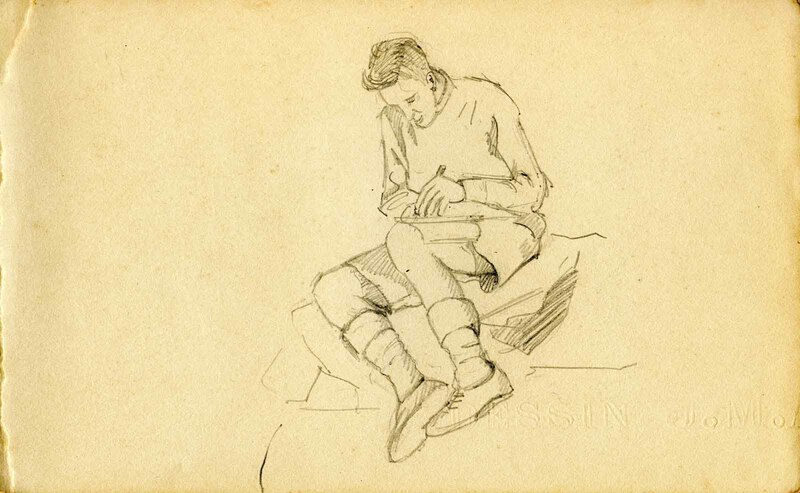 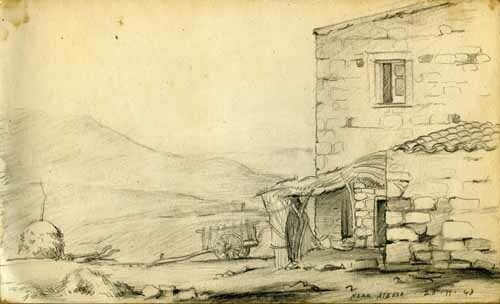 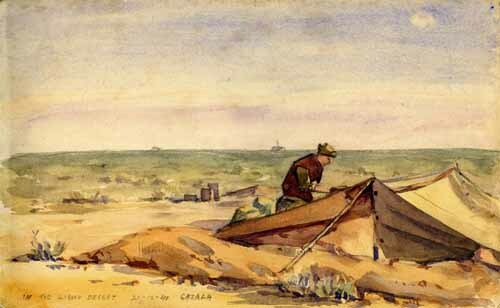 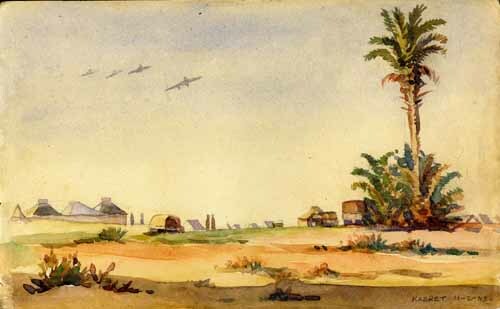 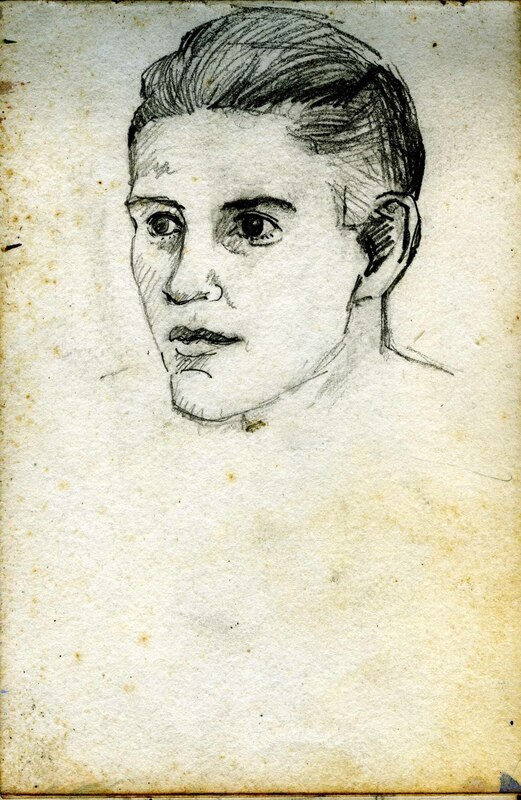 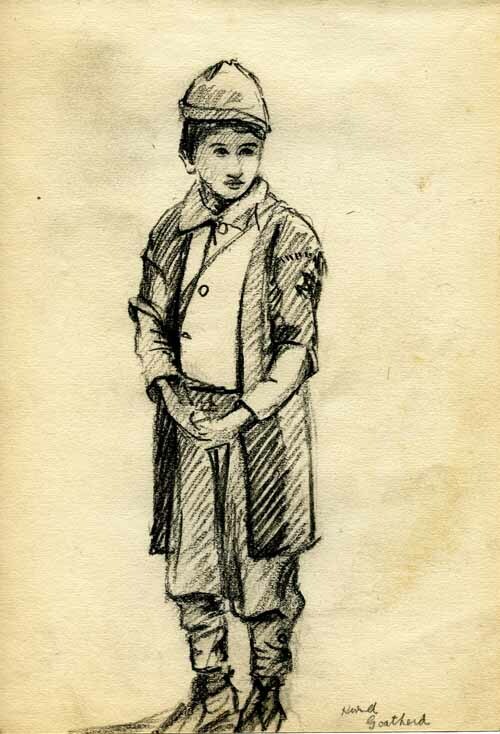 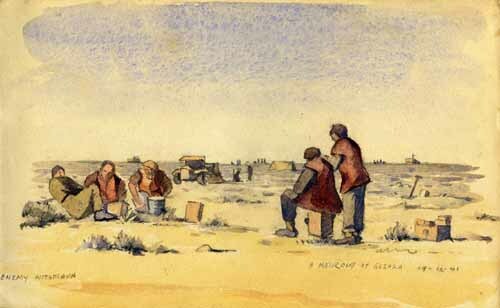 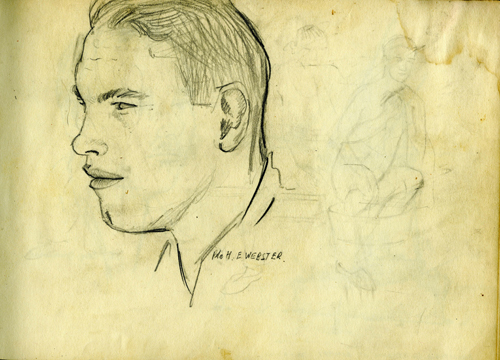 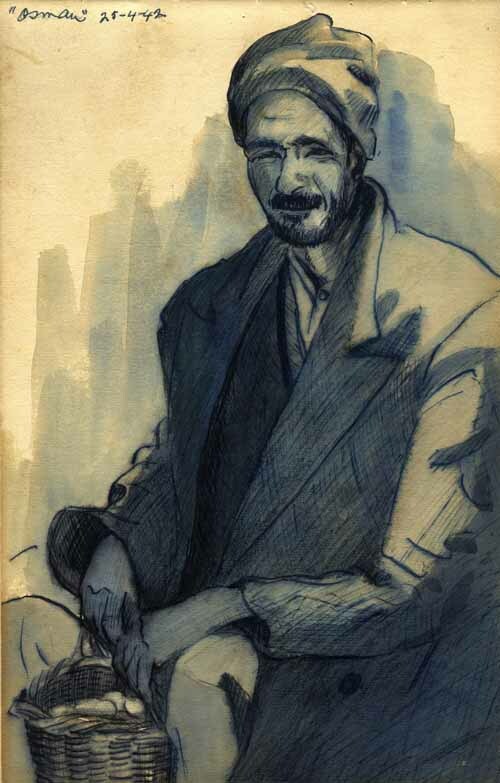 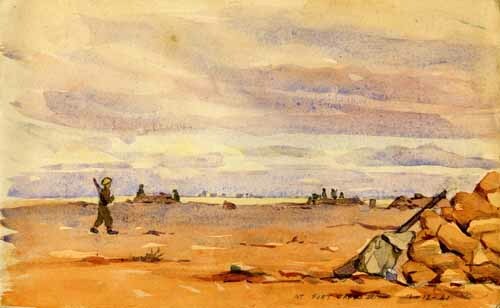 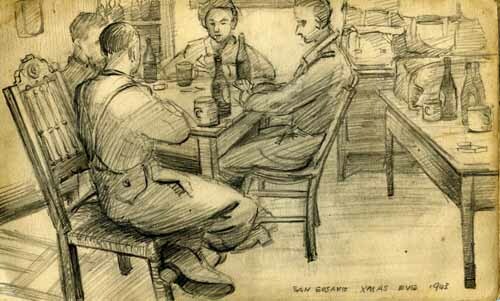 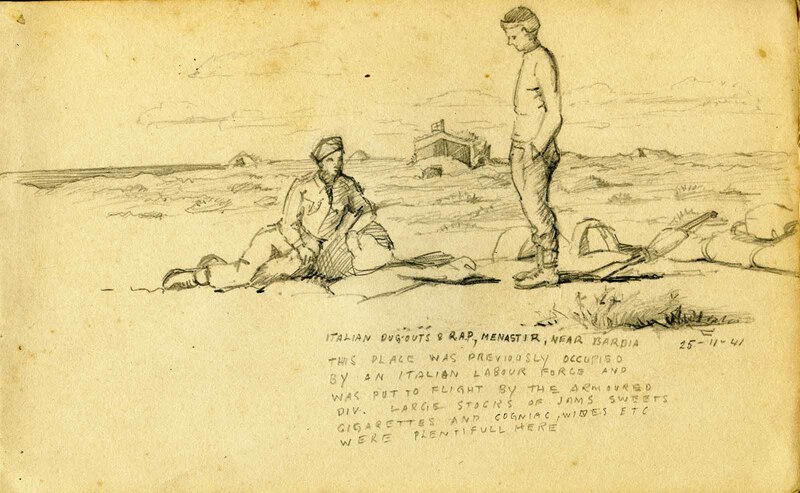 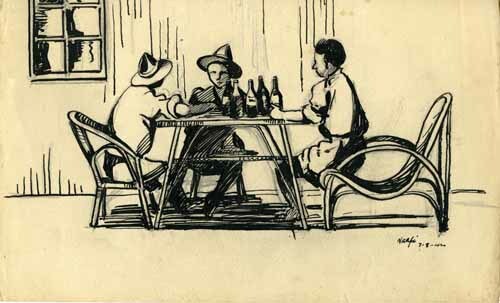 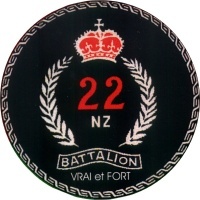 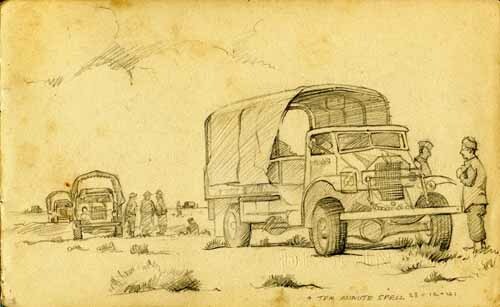 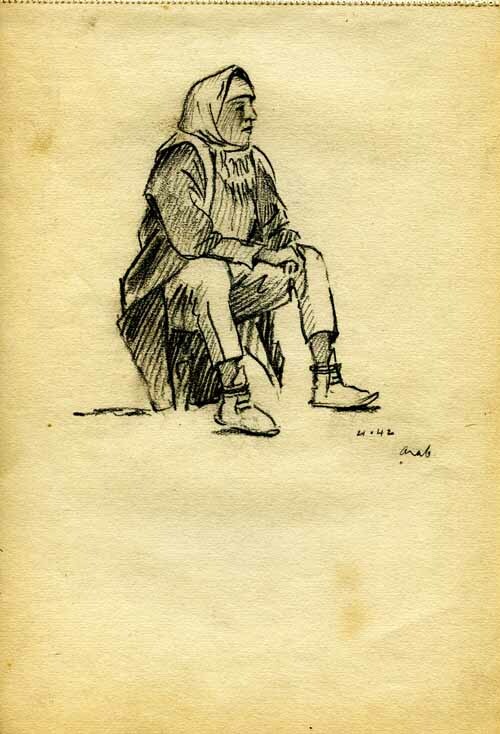 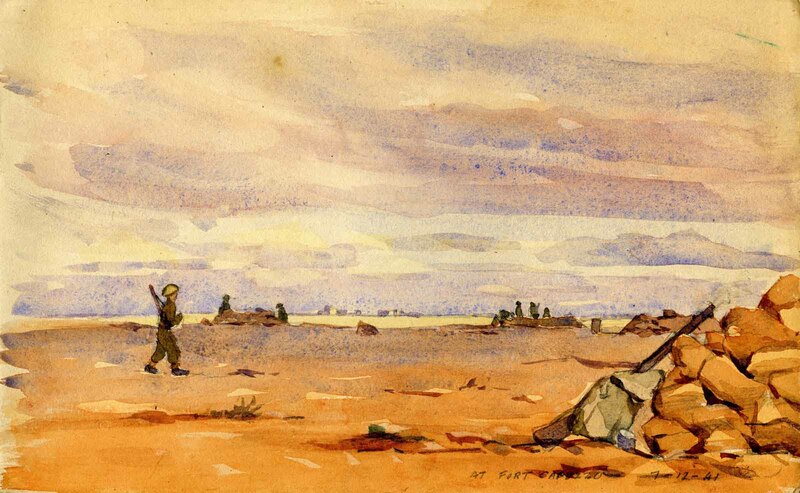 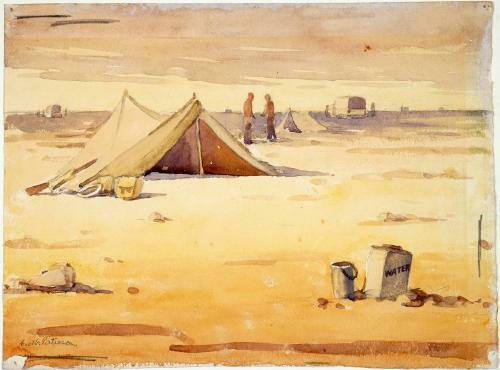 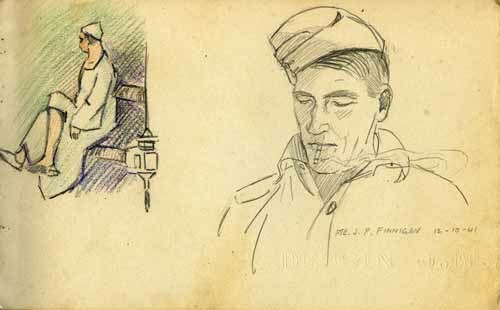 Although Peter McIntyre is the best known war artist (he should be well known, he was the official artist), there were many other men in the 2NZEF who were accomplished artists as well. 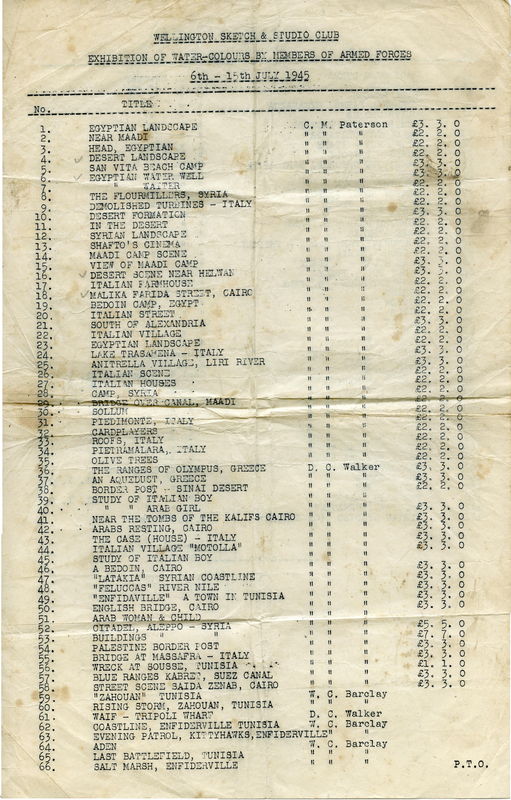 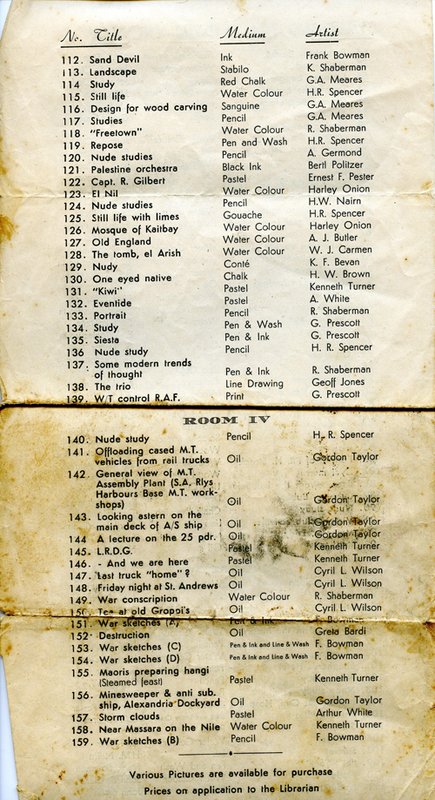 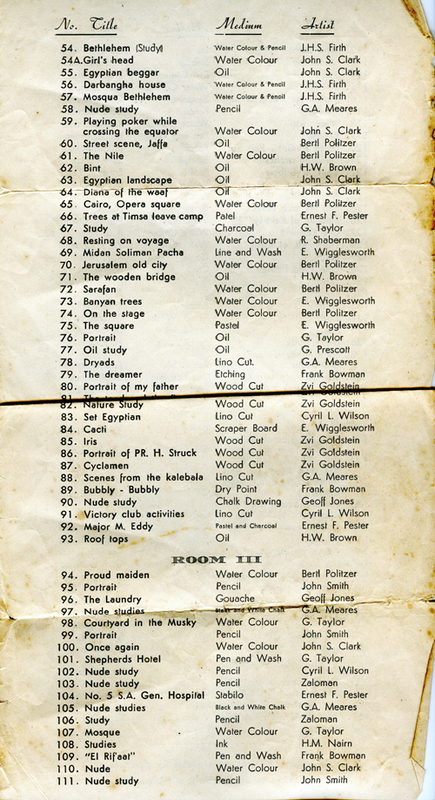 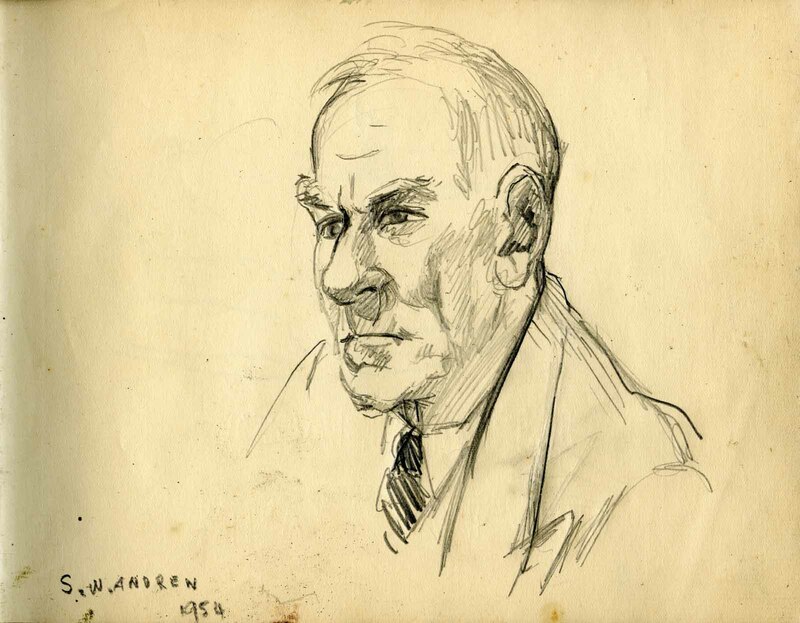 Some of these men and their art are recognised in the national collection held by the National Archives in Wellington (see the collection here). One of the men recorded is C.M. 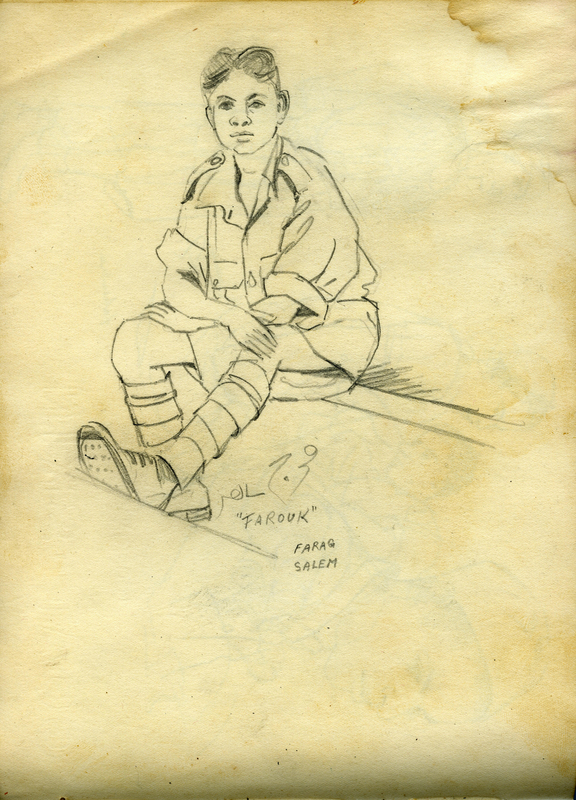 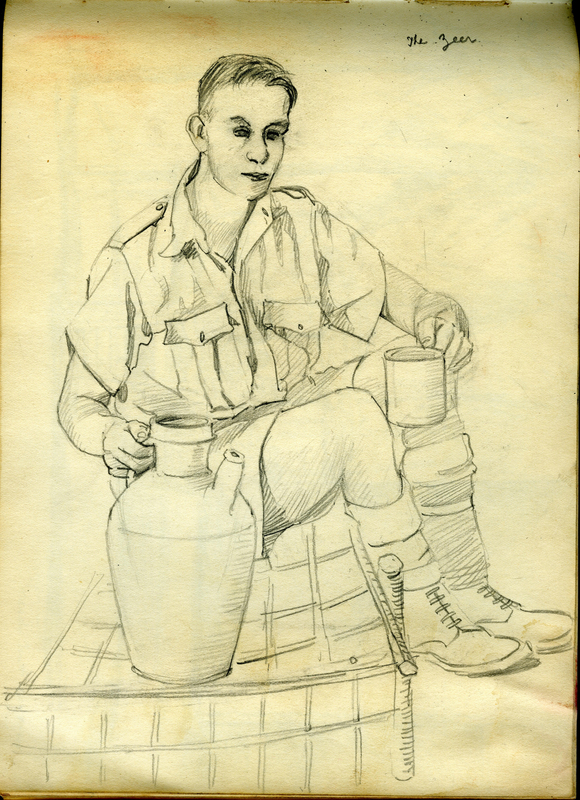 Paterson who arrived in Maadi Camp, Cairo on 24 March 1941 and joined the remnants of the 22 Battalion on GarawiCamp on 16 June 1941. 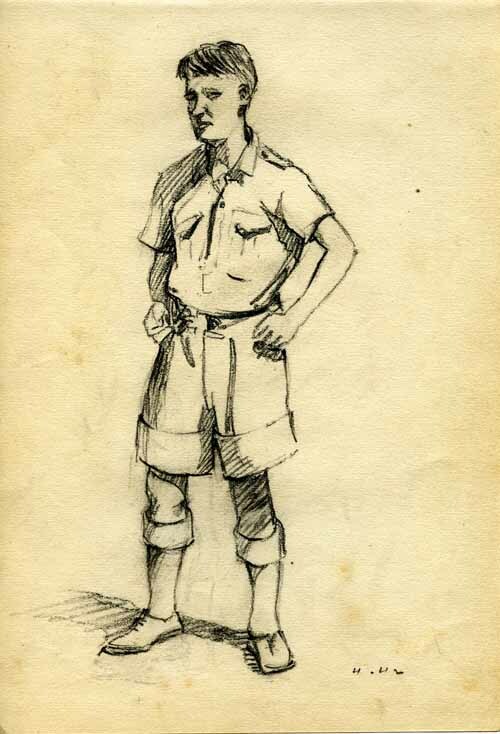 Paterson was among the 365 men who formed the first reinforcements of the battalion to replace the losses suffered in the Greece and Crete campaigns. 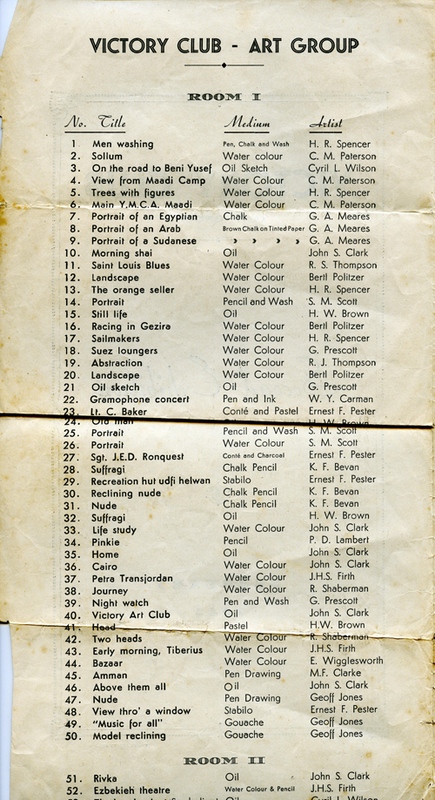 Charles Paterson took his art seriously. 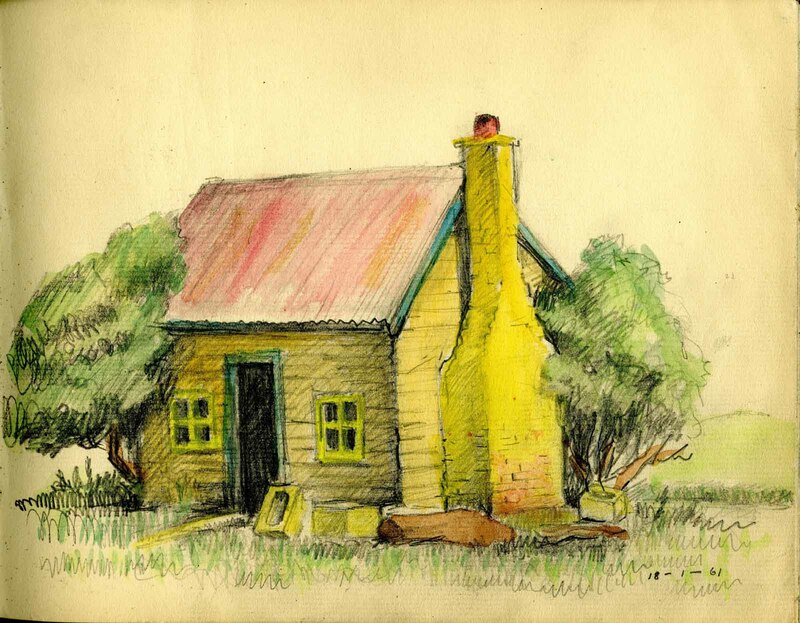 He had joined the Wellington Art Club in the 1930s and had become its Treasurer in 1940, before he joined the Army and was posted overseas. After his return he continued with the Art Club and became Vice-President in 1949. 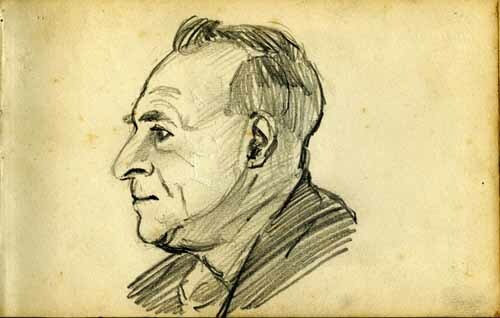 He was a member of the Club until his death on 22 December 1967. 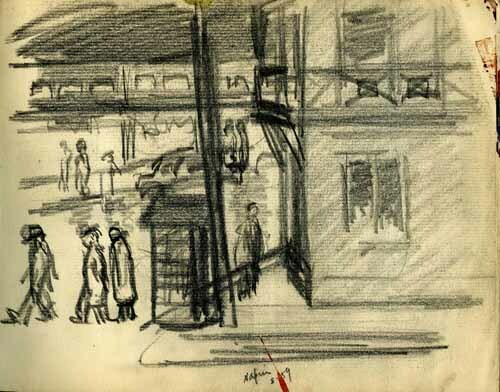 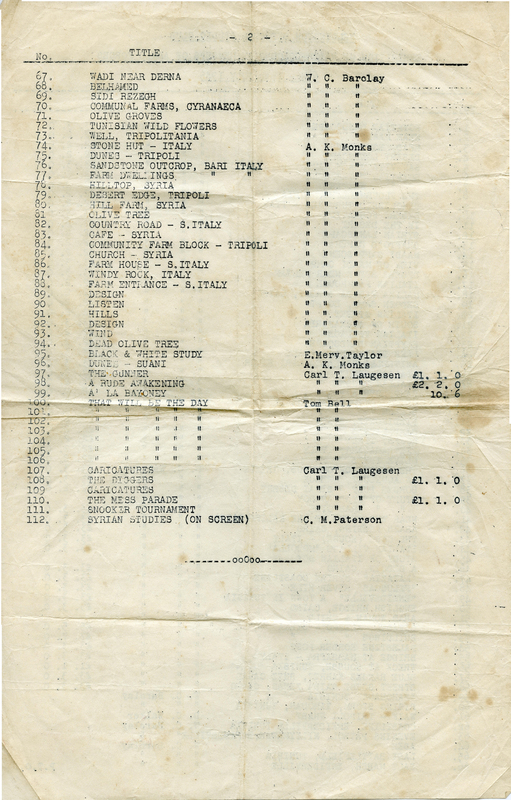 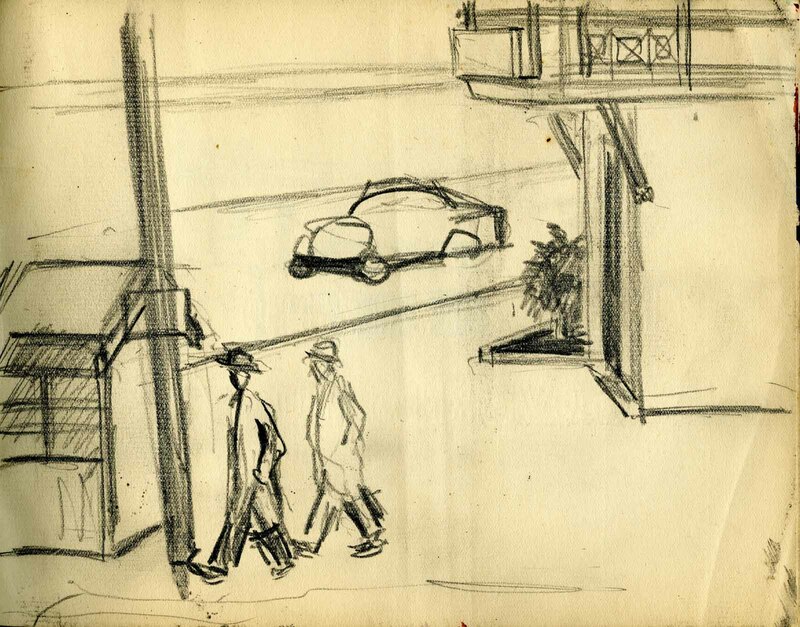 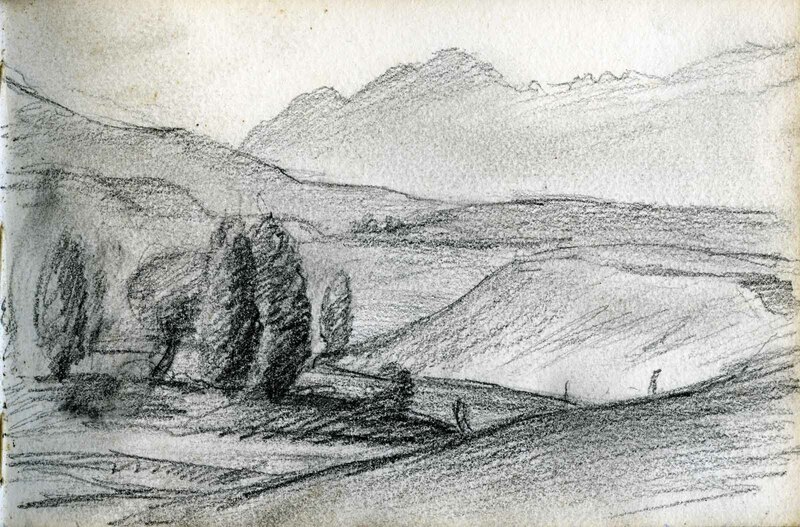 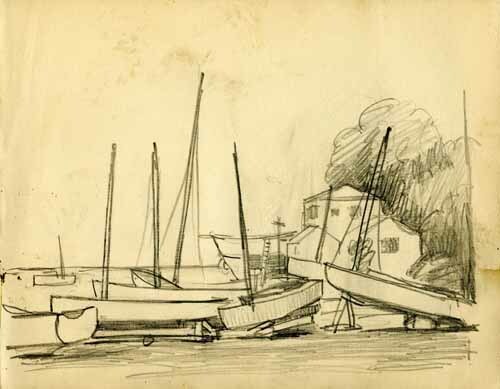 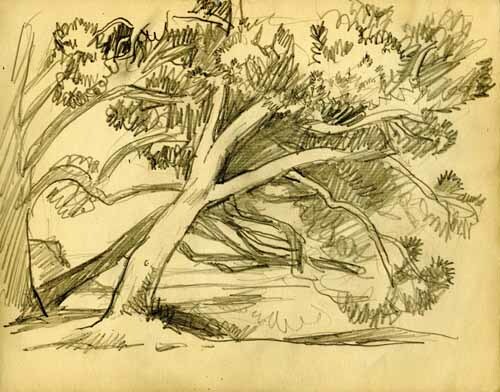 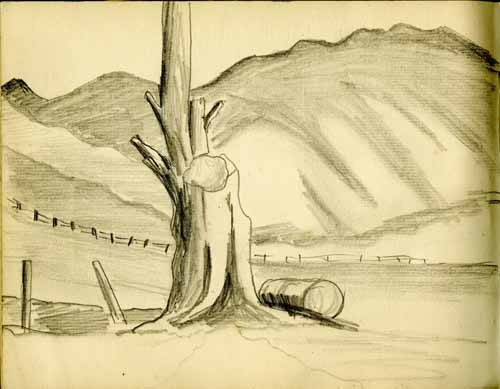 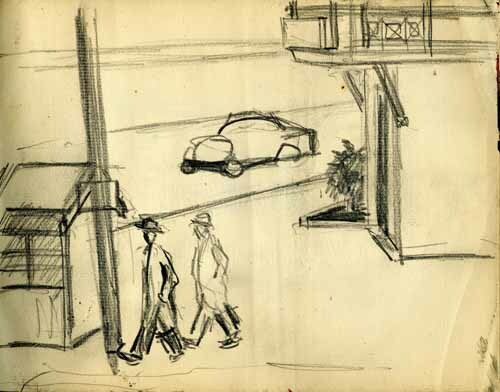 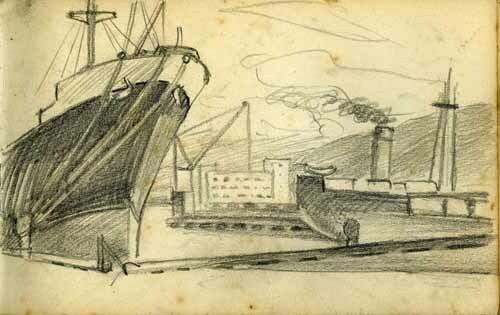 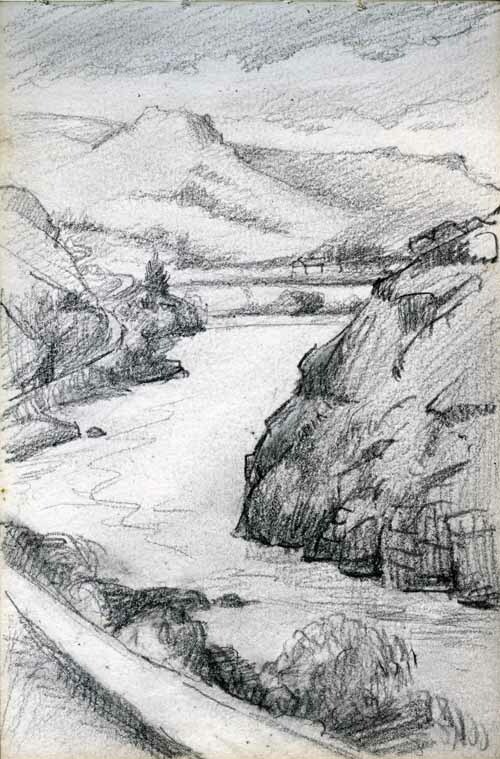 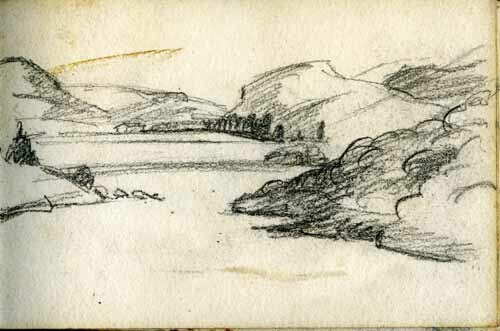 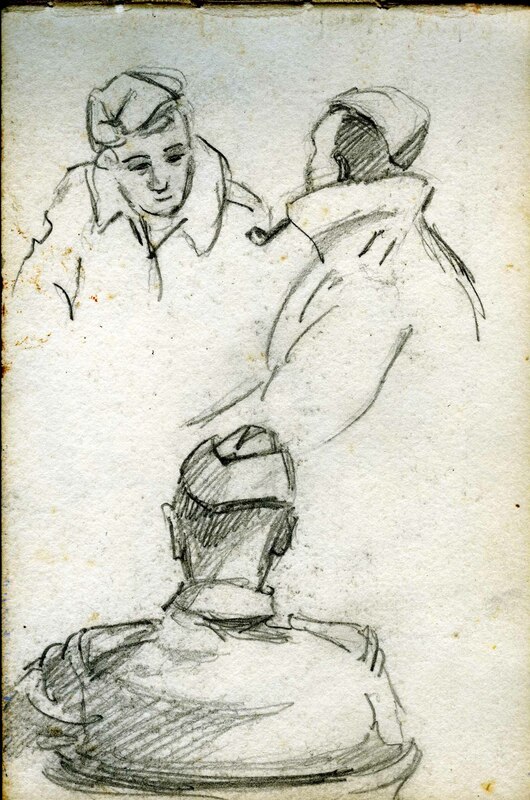 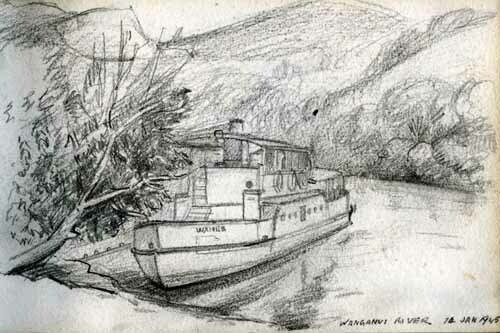 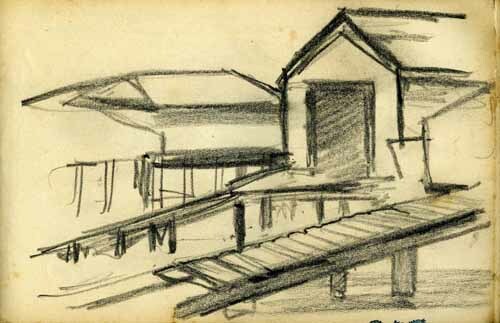 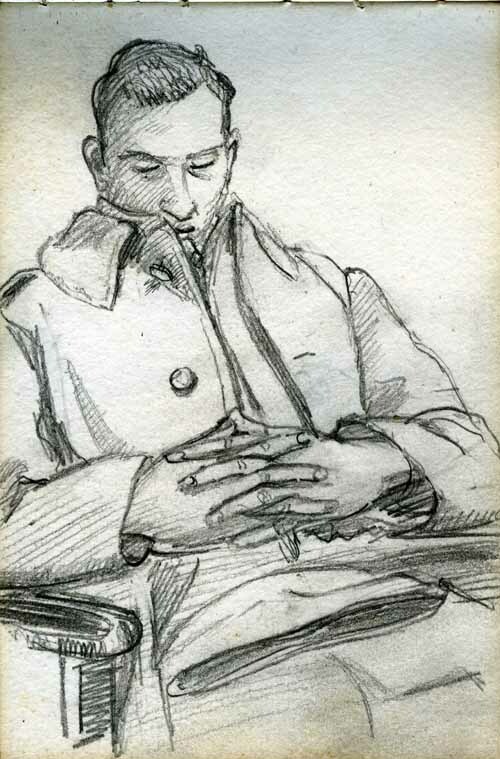 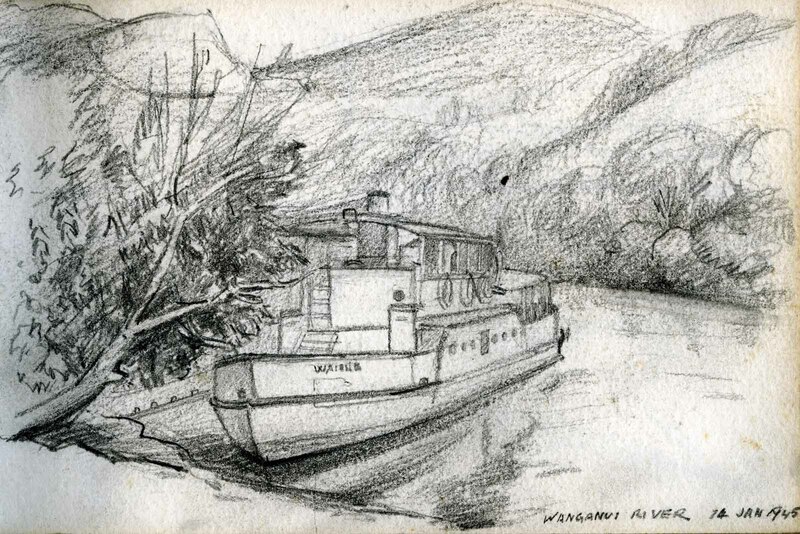 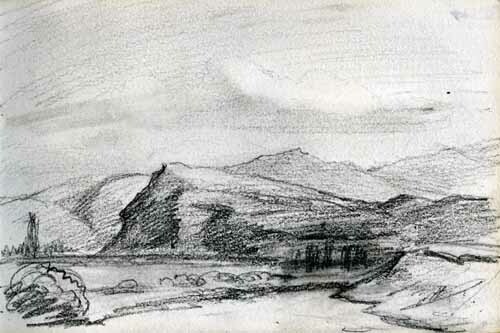 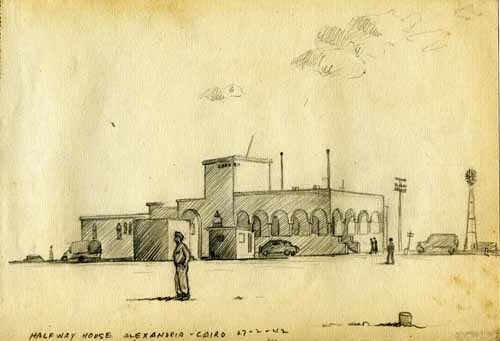 During his overseas war service, Charles carried sketch books with him from the day he departed Wellington on 1 February 1941 aboard the "Neiw Amsterdam" until he departed Italy in 1944. 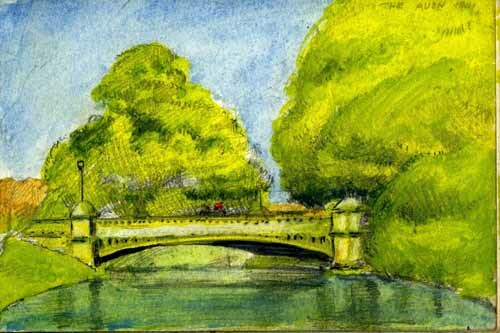 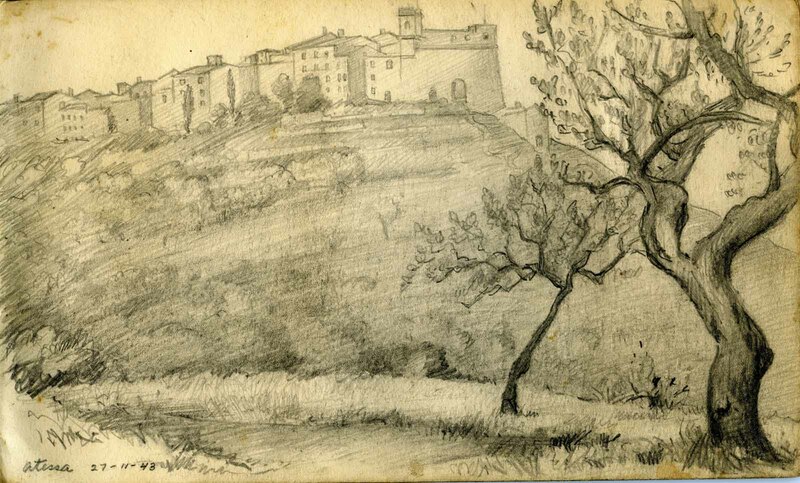 Many of his sketch books have been preserved by the family and the sketches and watercolours are reproduced here. 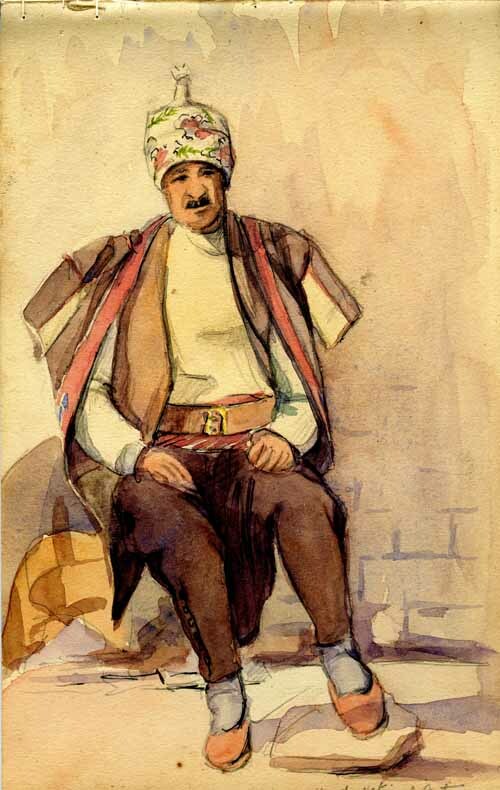 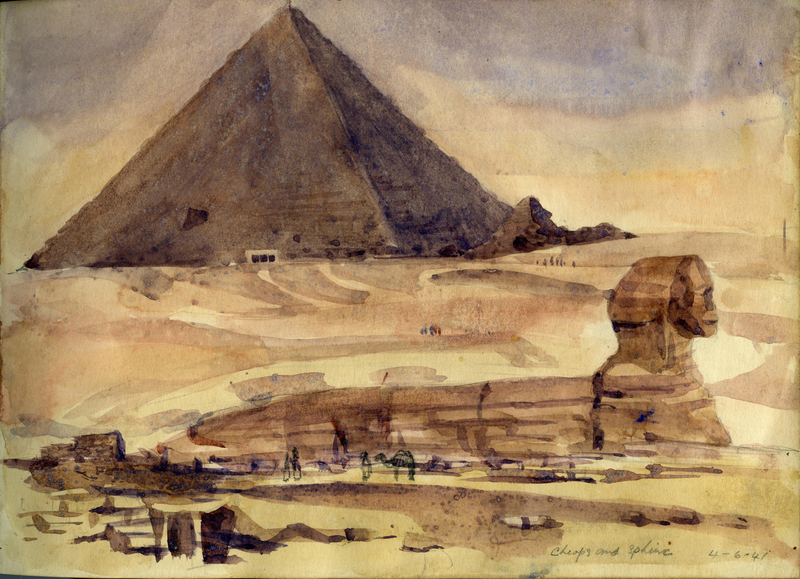 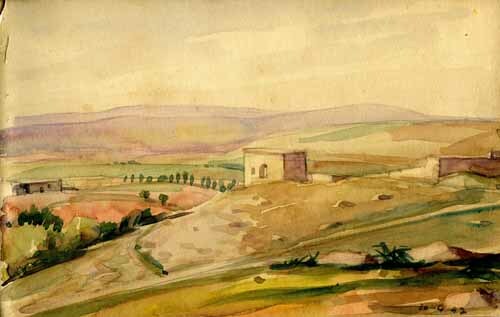 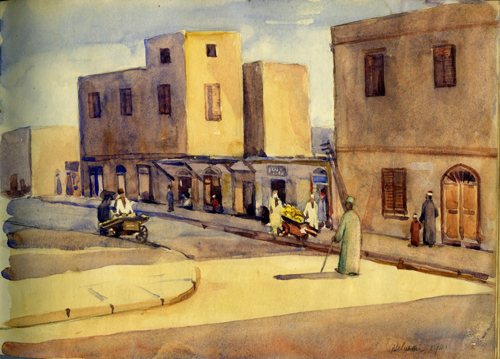 He also produced many illustrations, mostly watercolours, which he exhibited in Cairo and later in Welington. 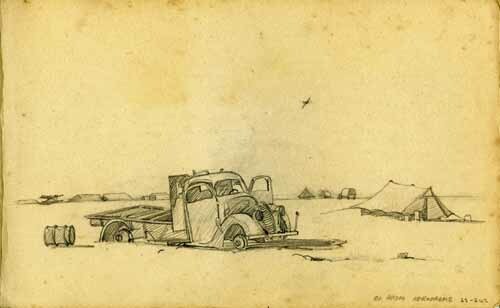 They appear to have sold well, as several of his works can be found from a search of online art dealers. Only one illustration appears to be in a public gallery, the example held by National Archives. 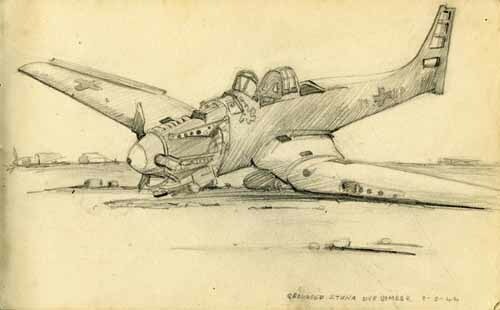 Not all of his war-time sketch books are available. 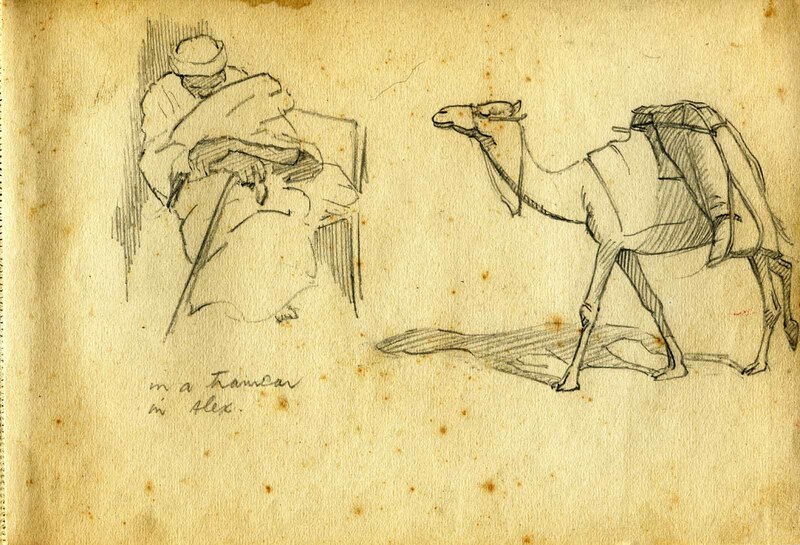 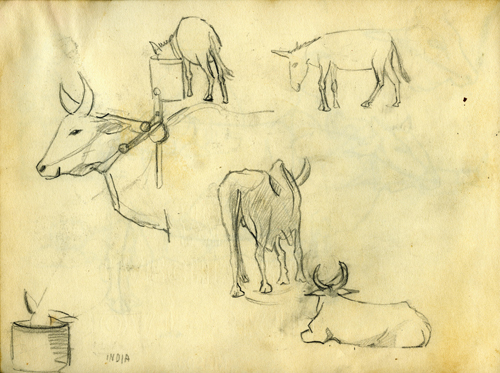 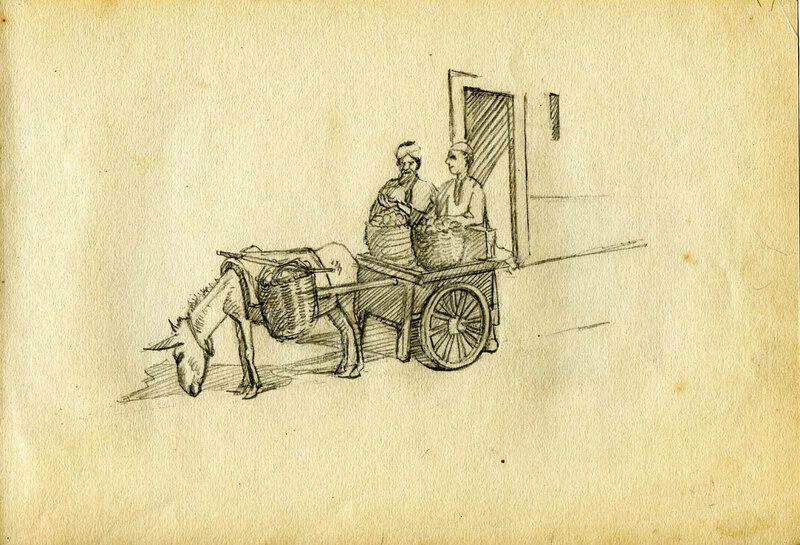 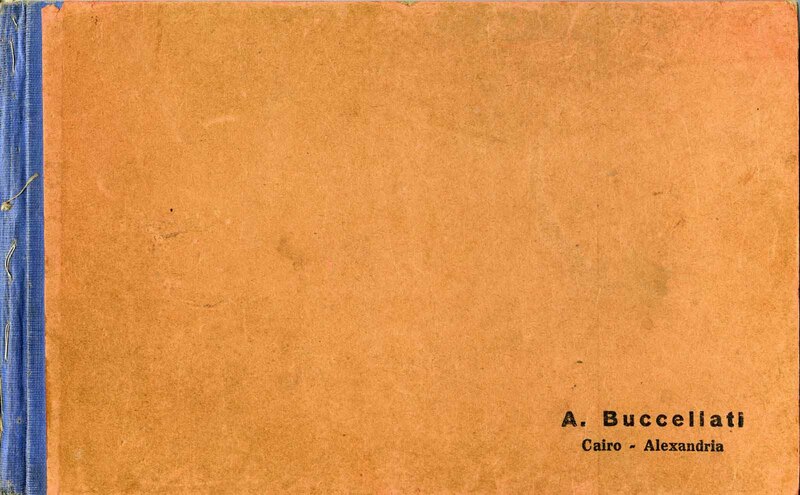 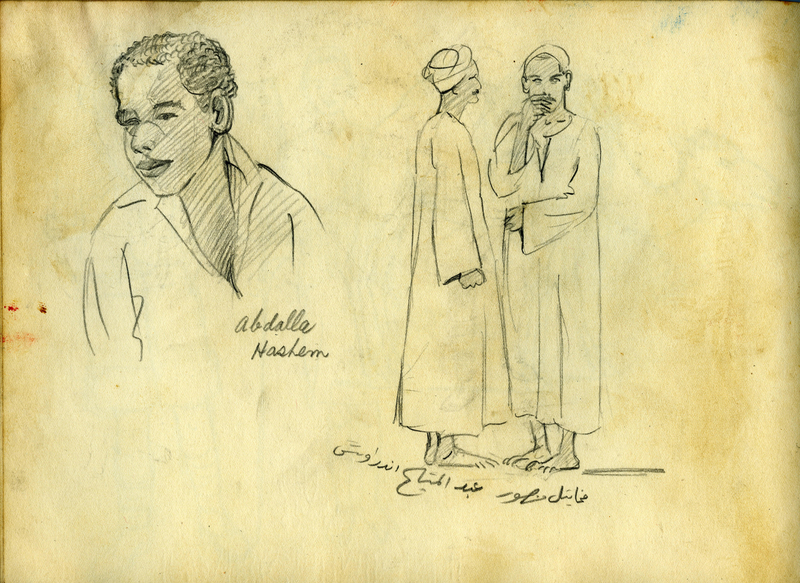 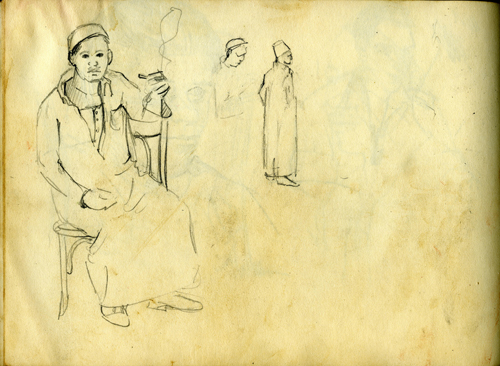 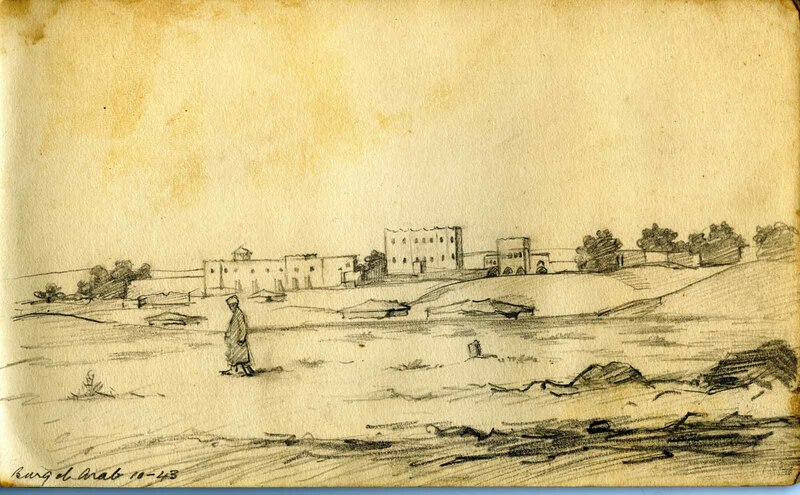 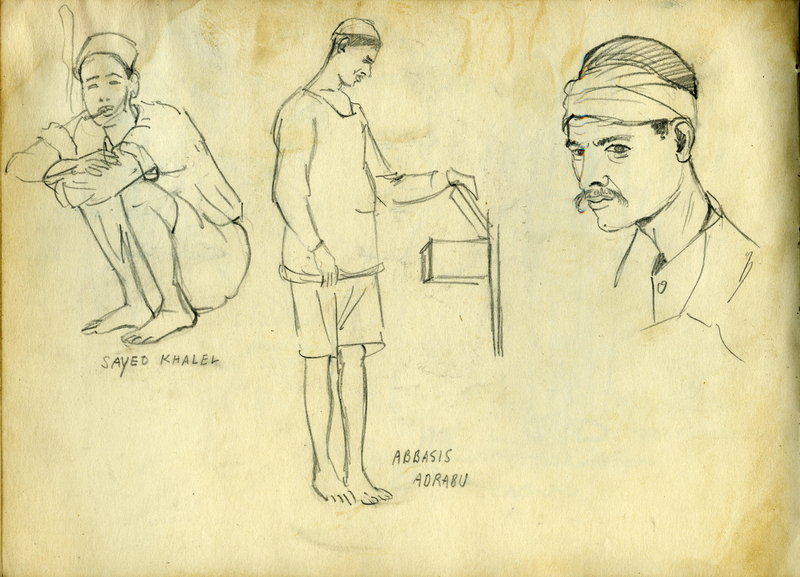 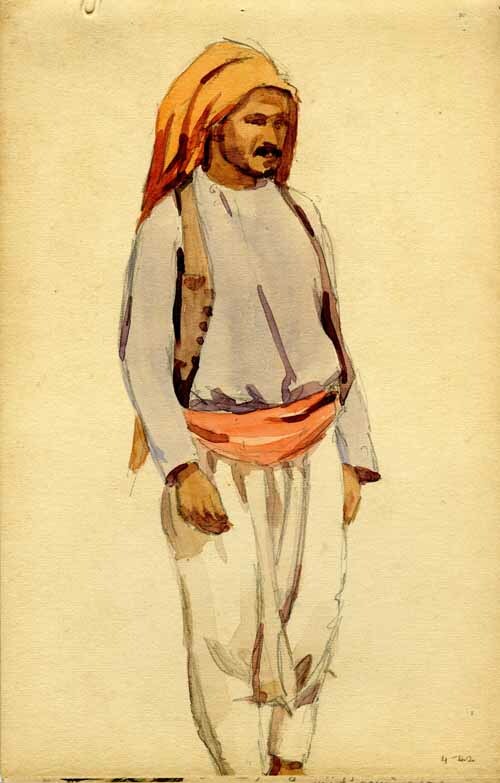 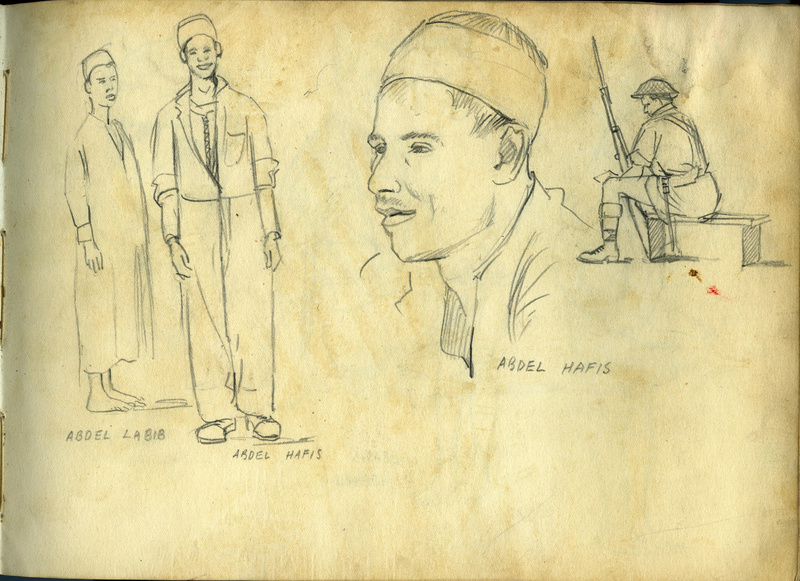 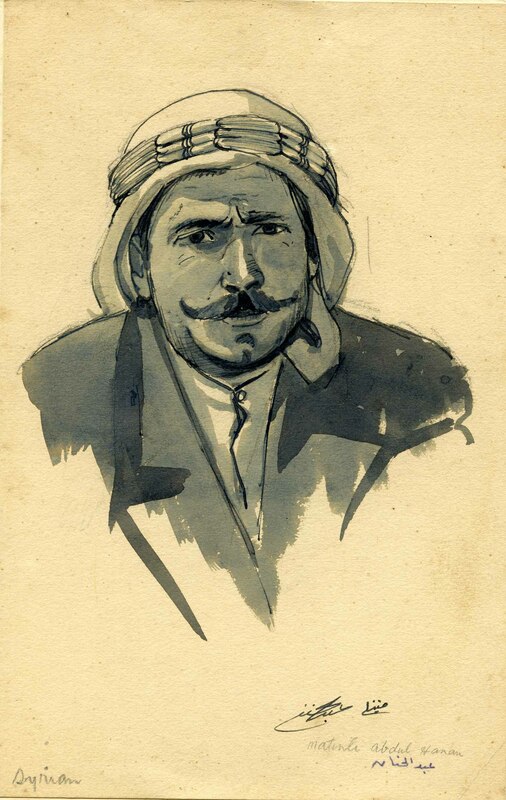 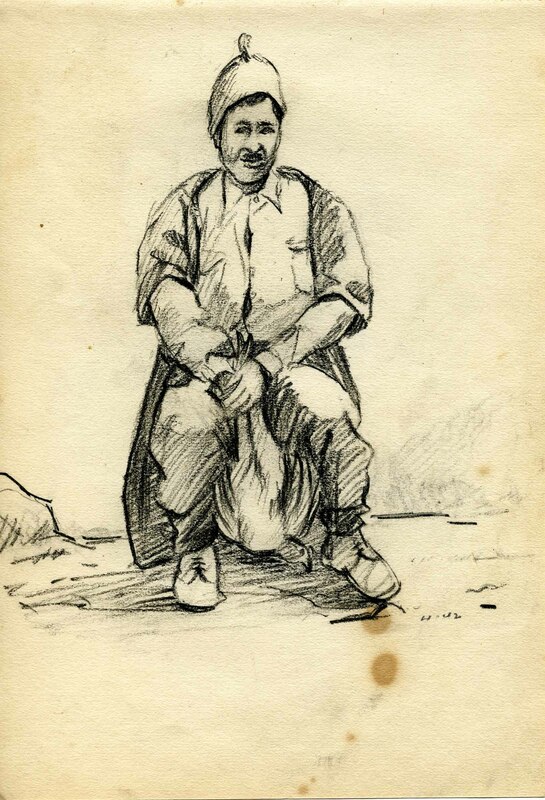 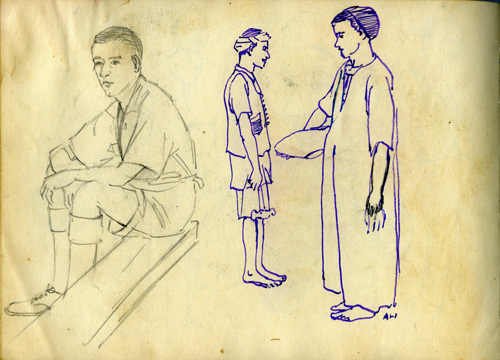 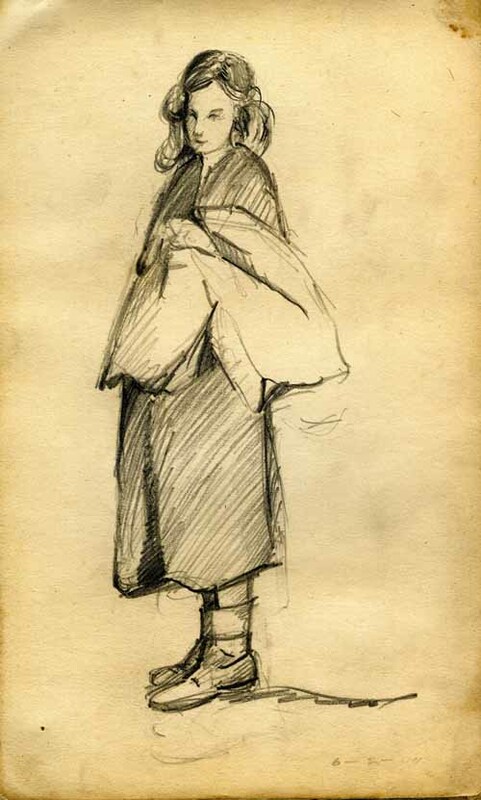 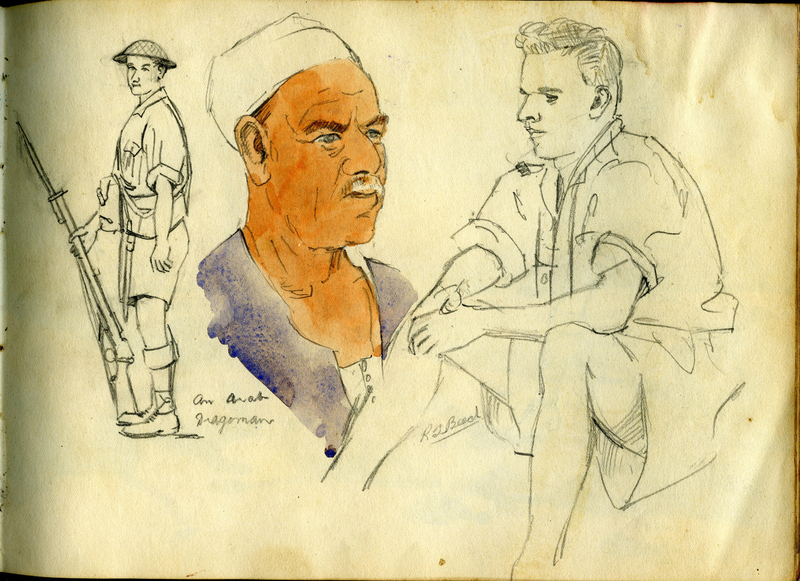 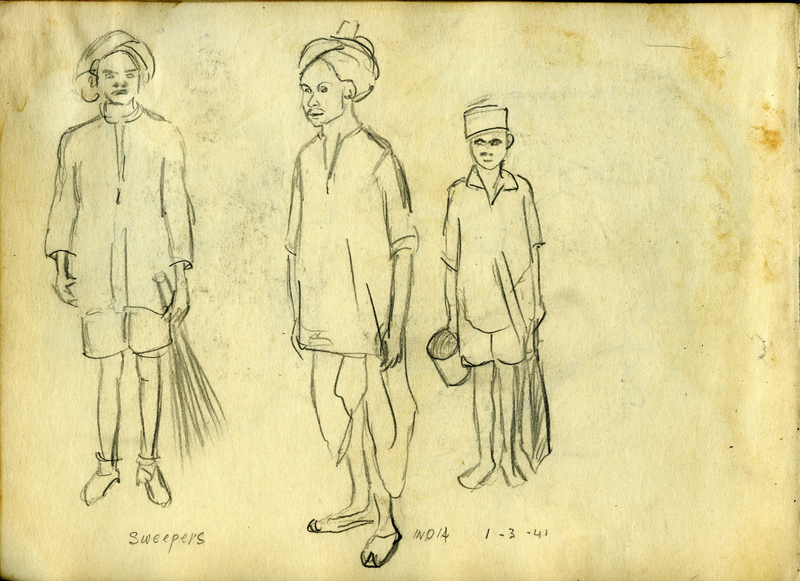 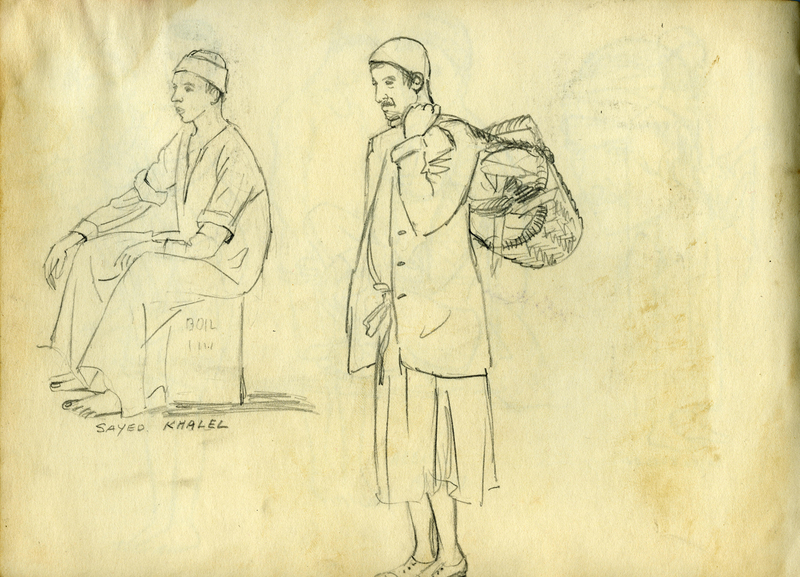 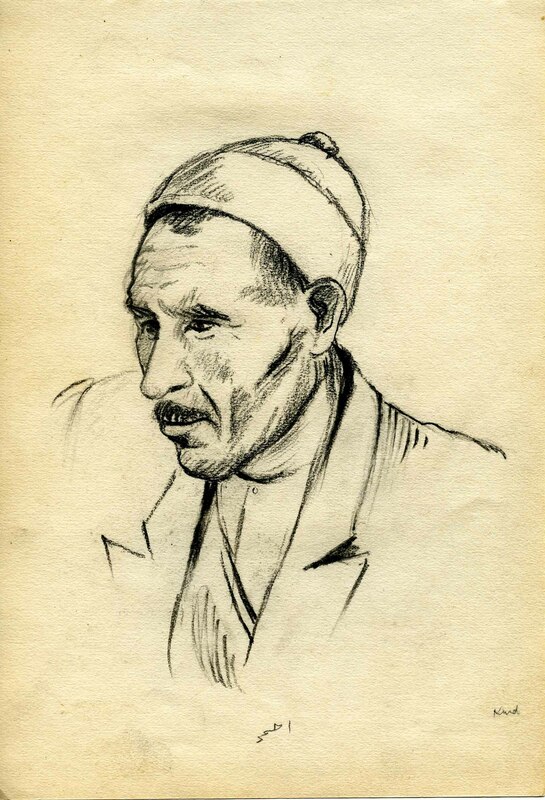 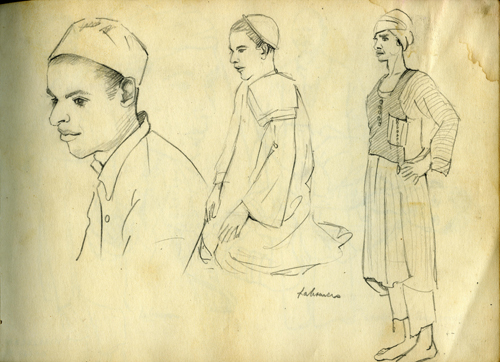 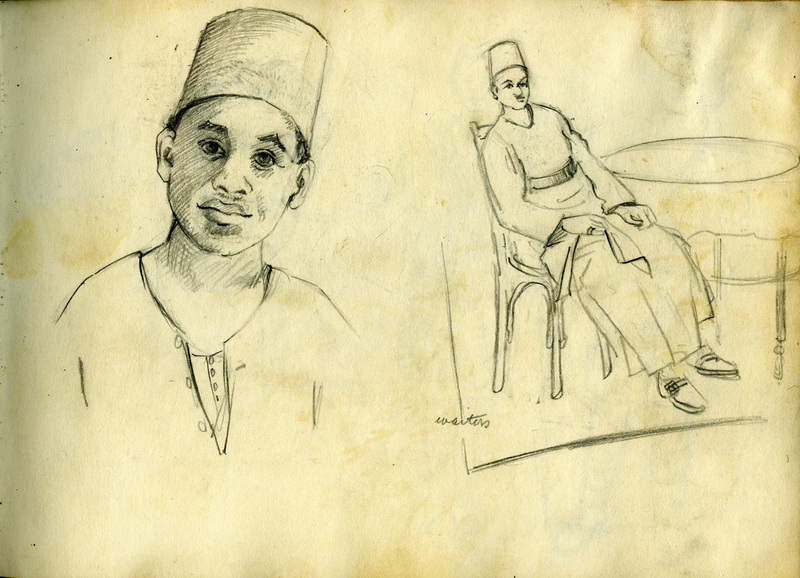 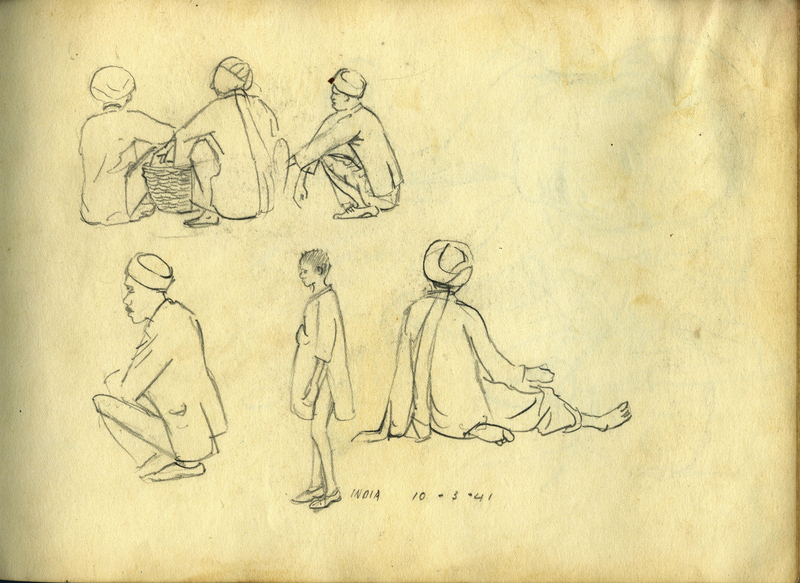 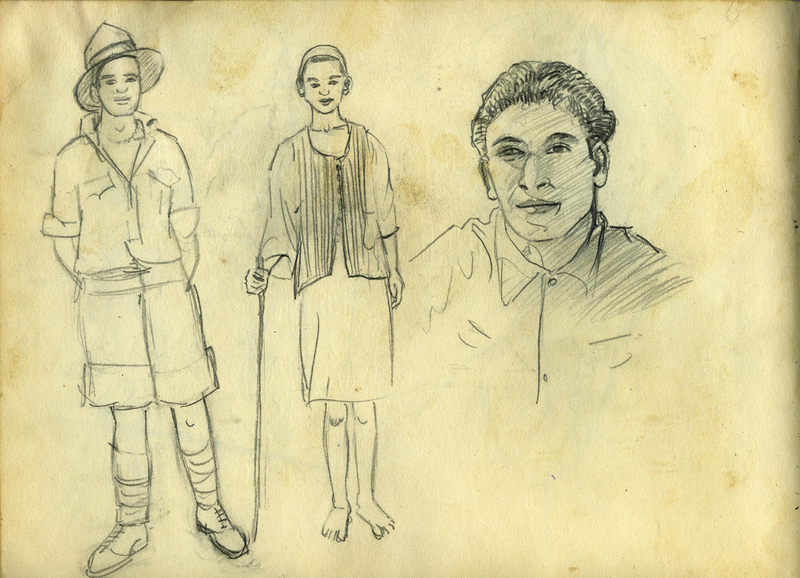 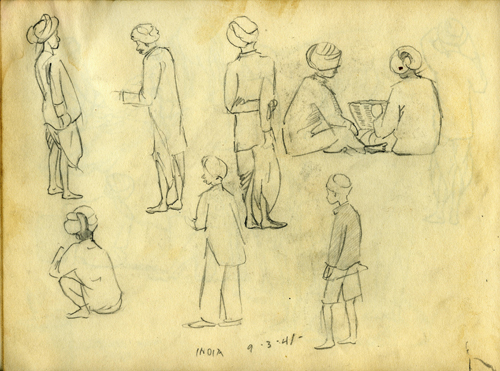 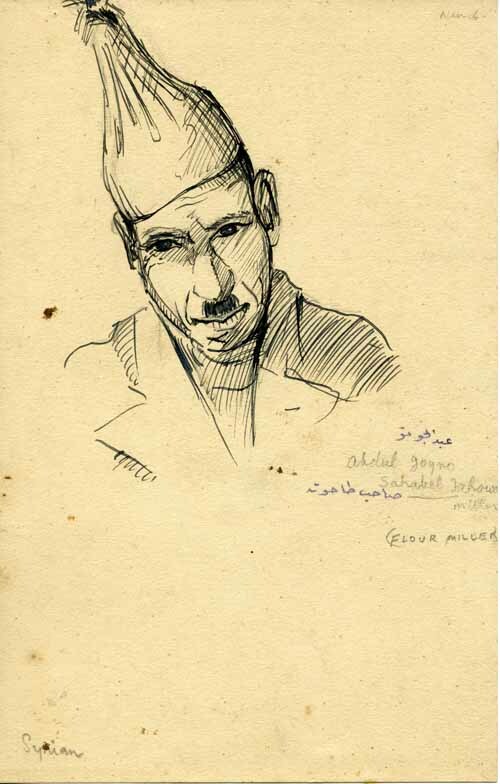 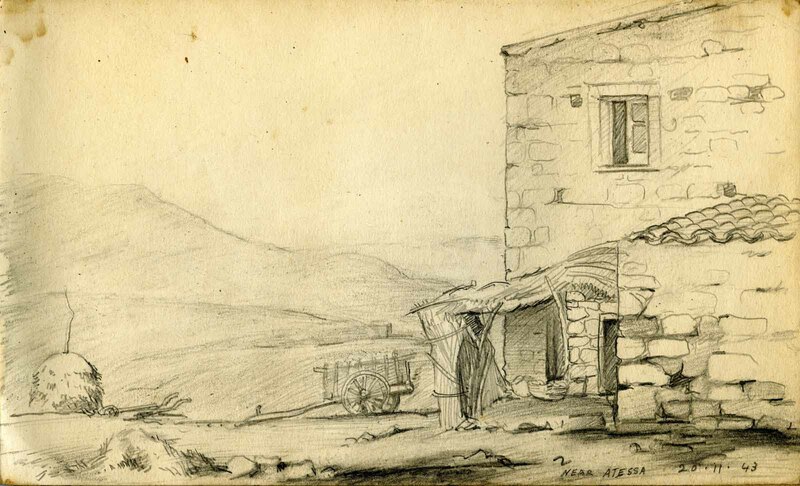 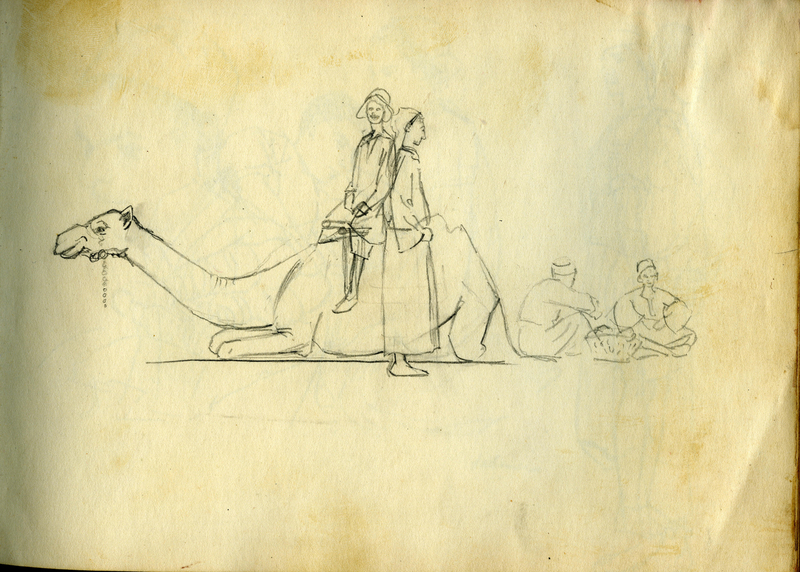 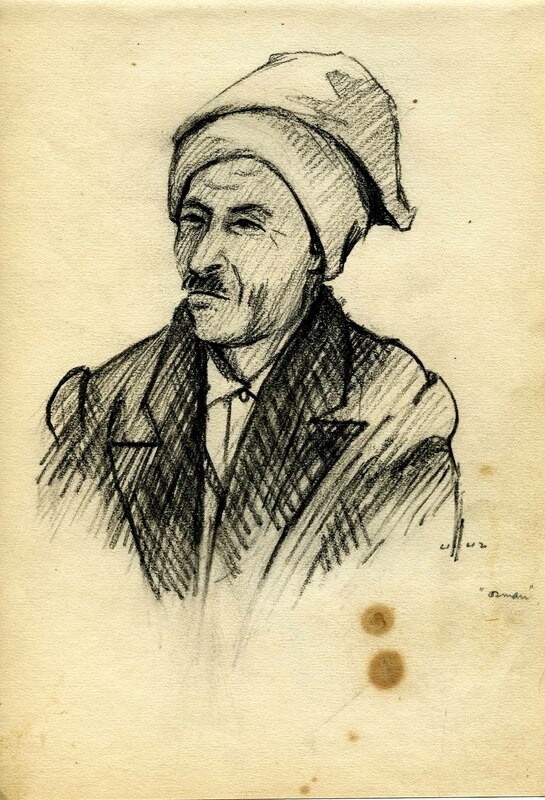 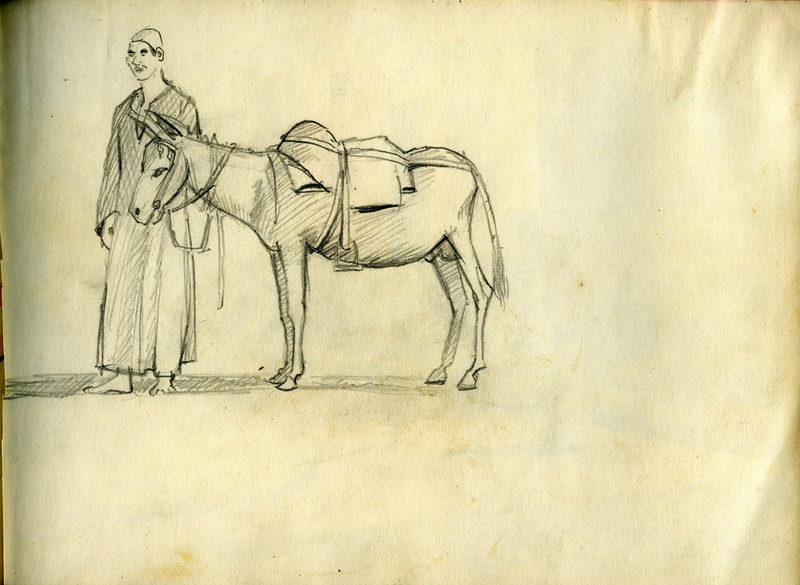 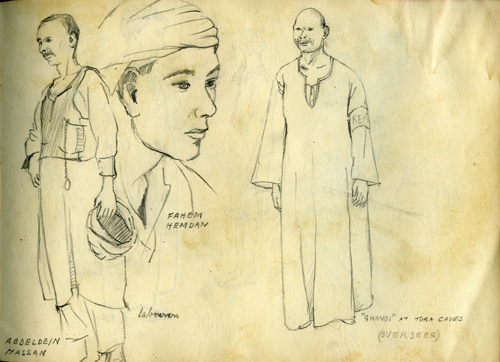 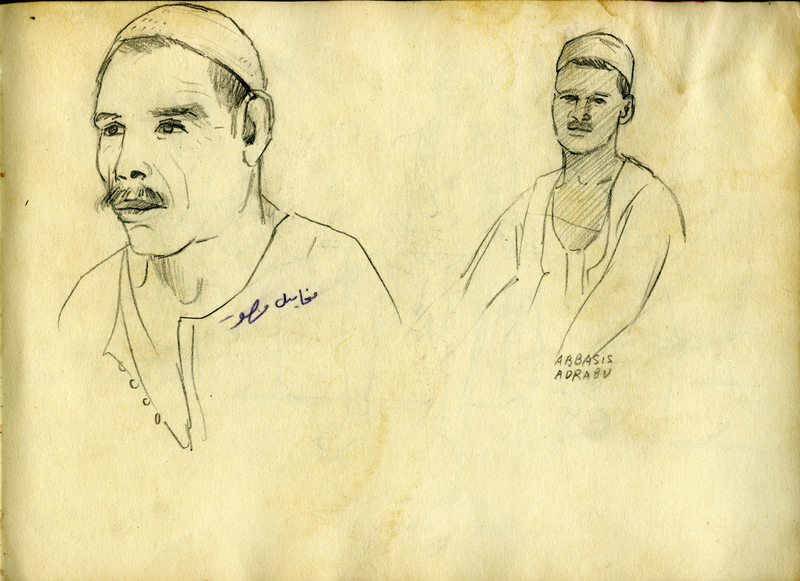 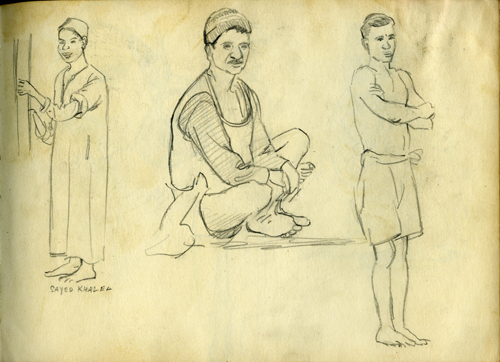 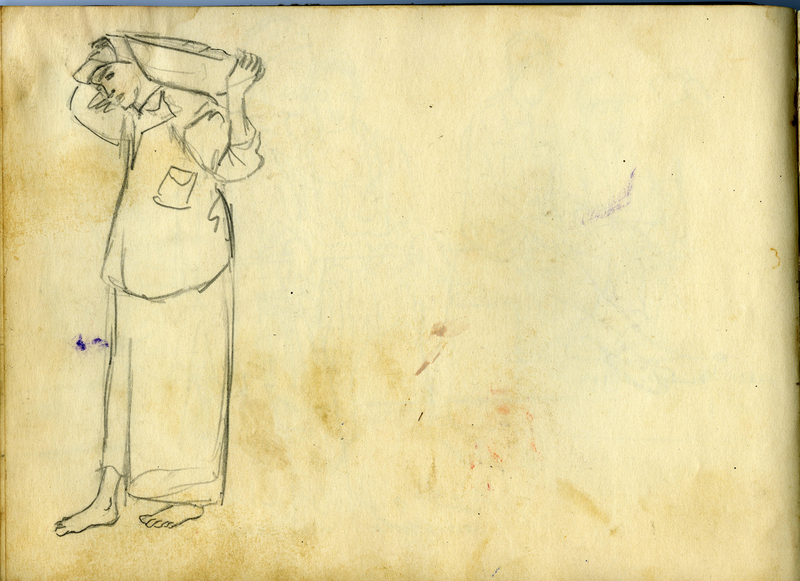 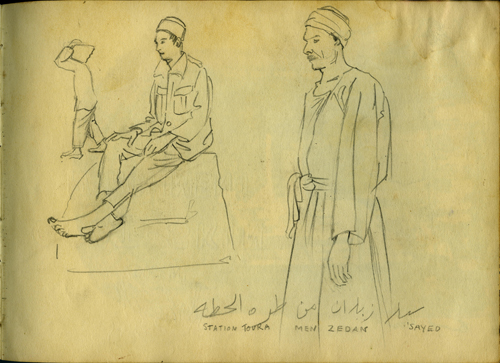 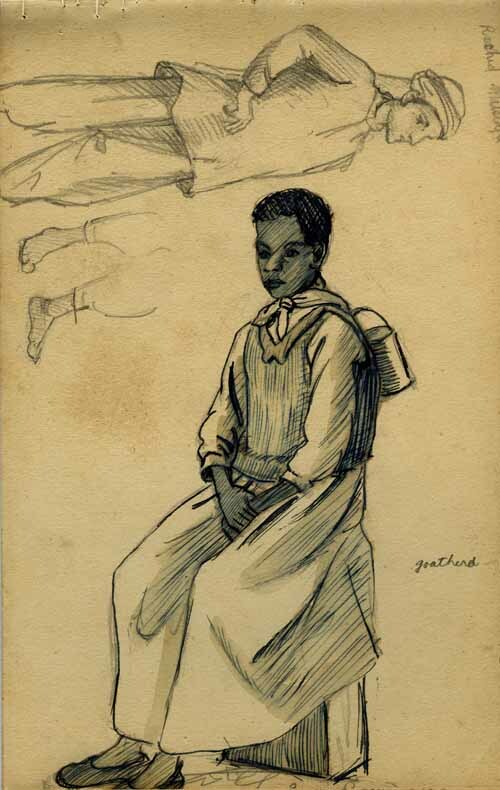 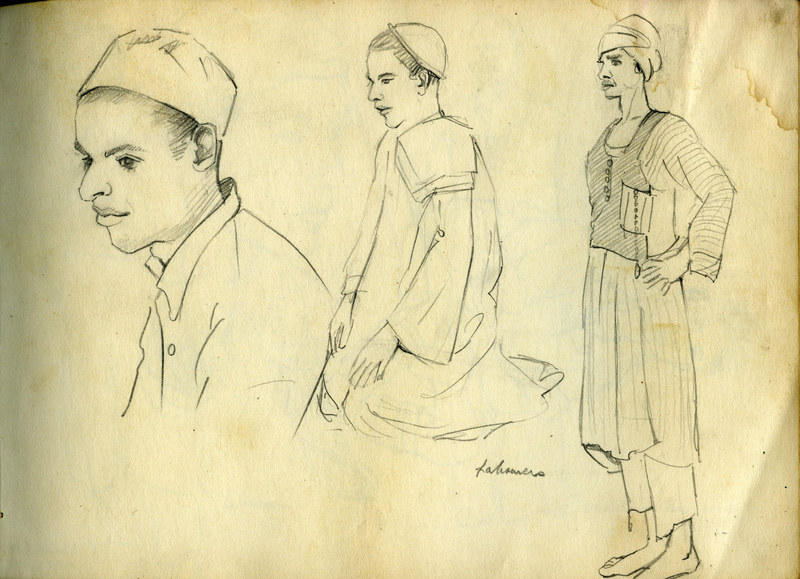 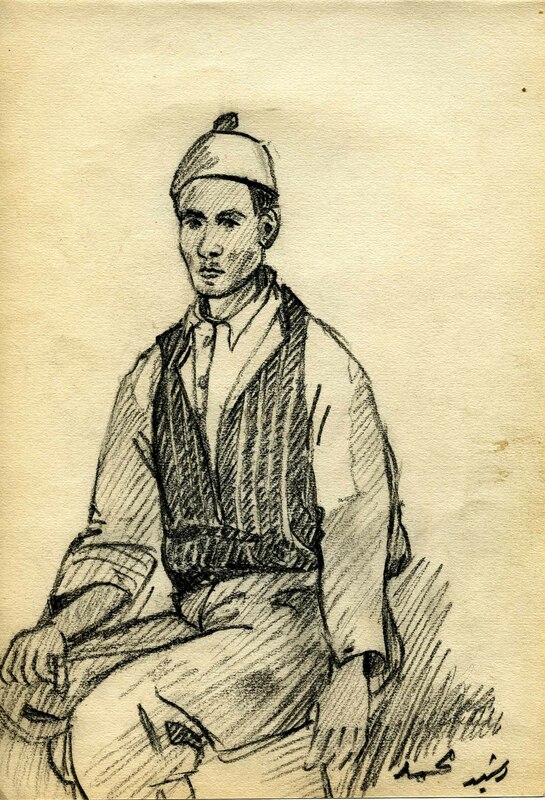 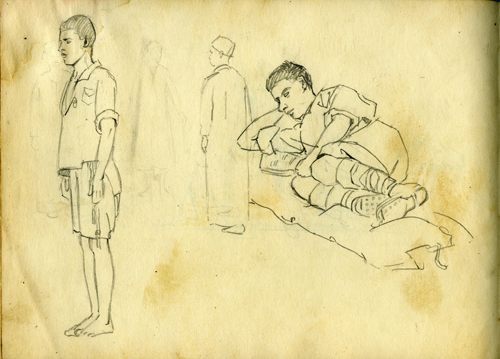 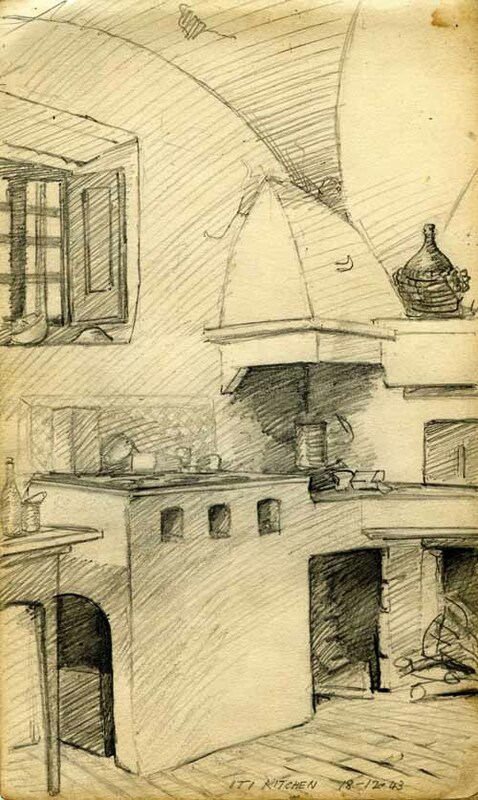 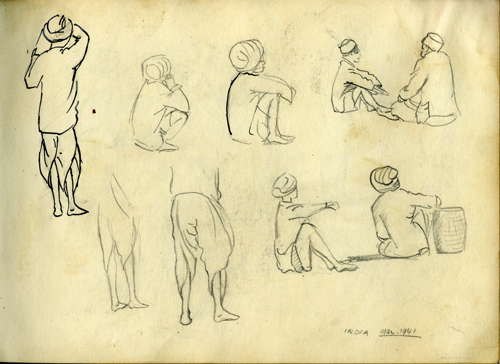 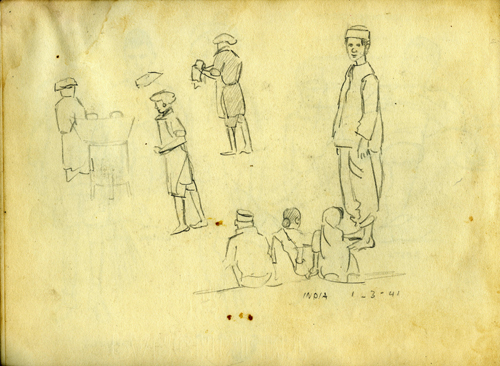 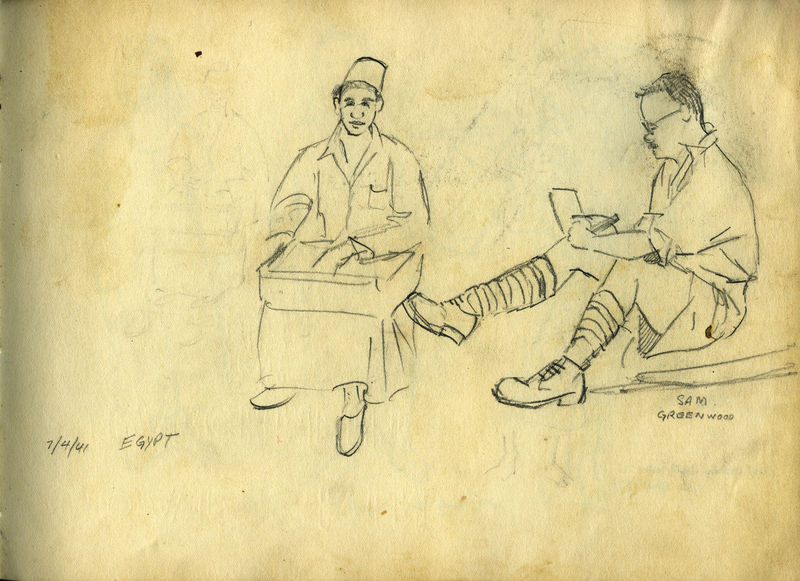 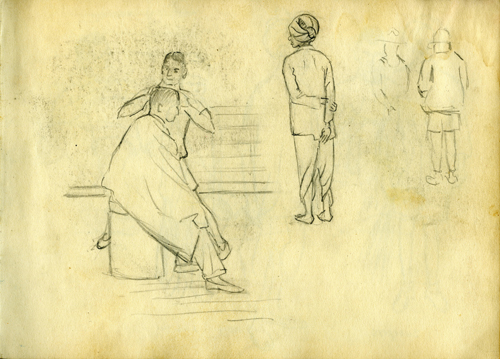 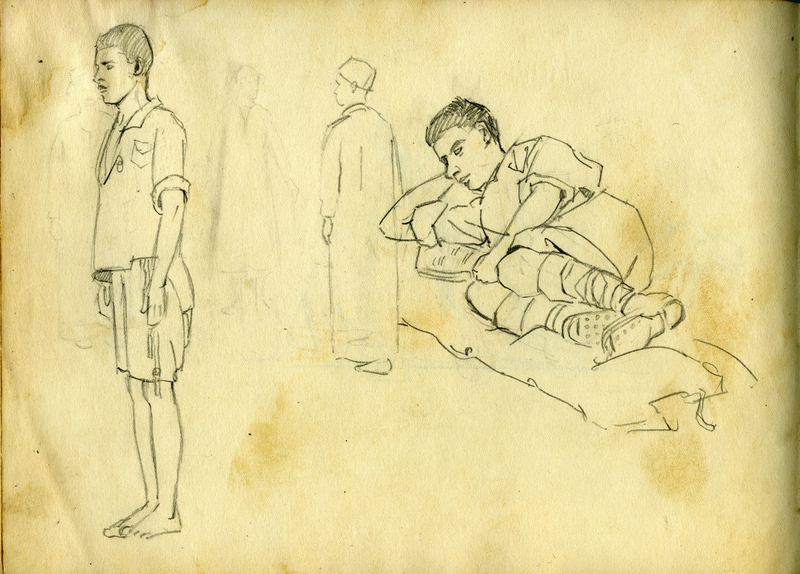 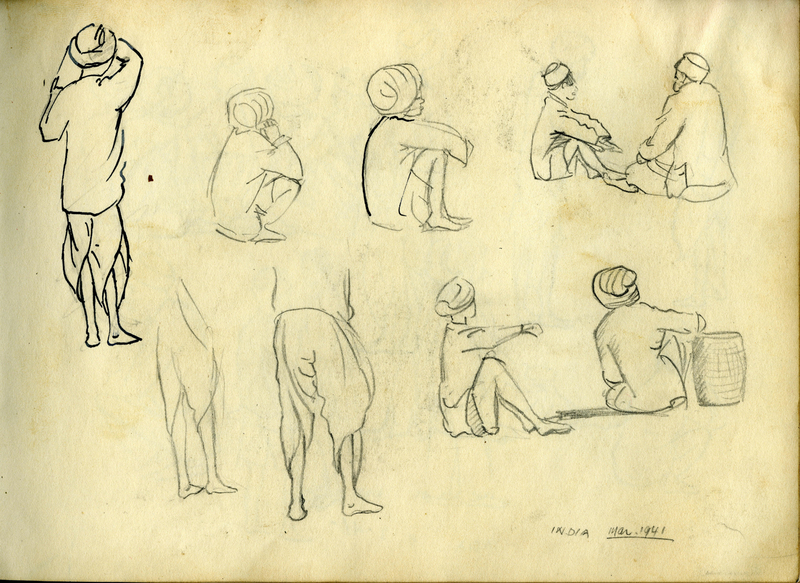 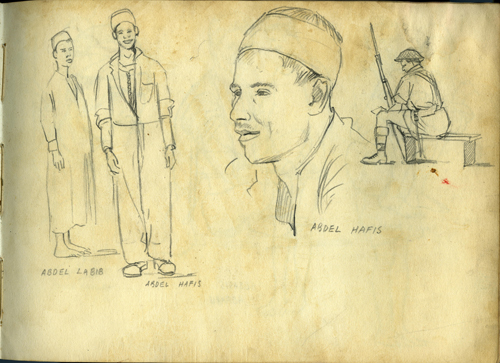 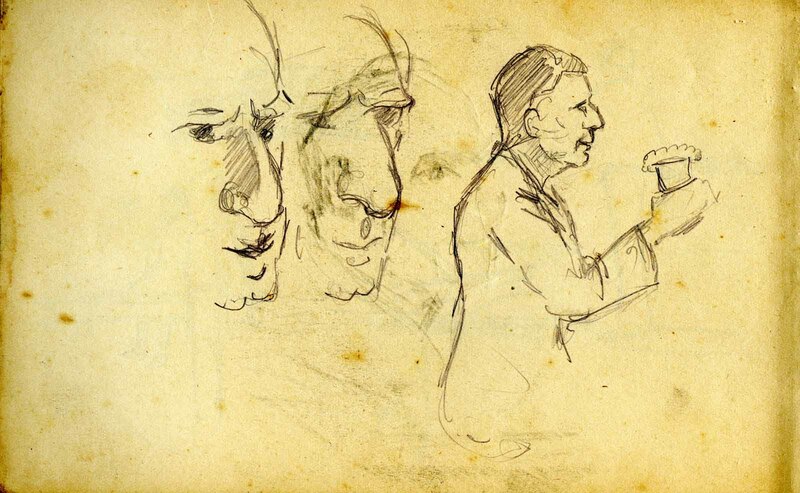 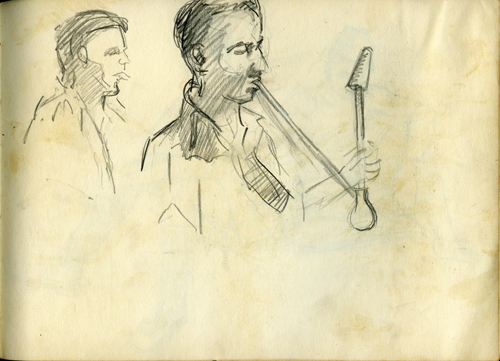 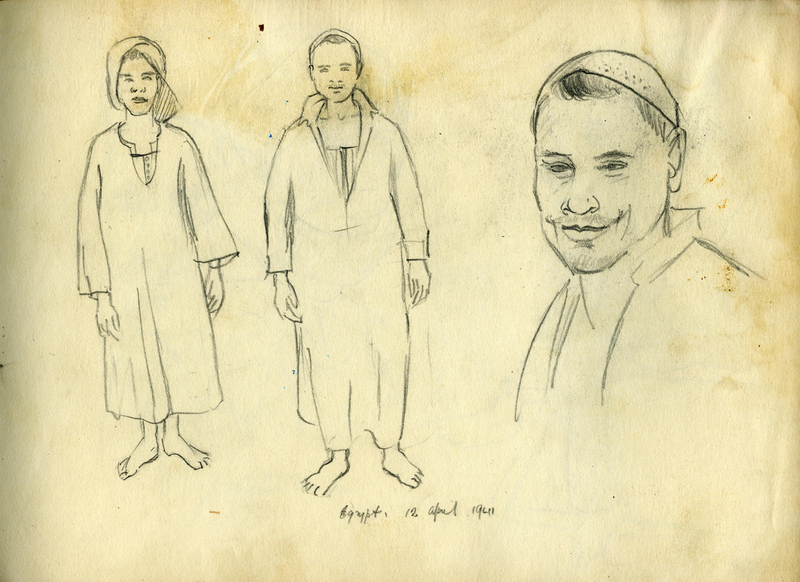 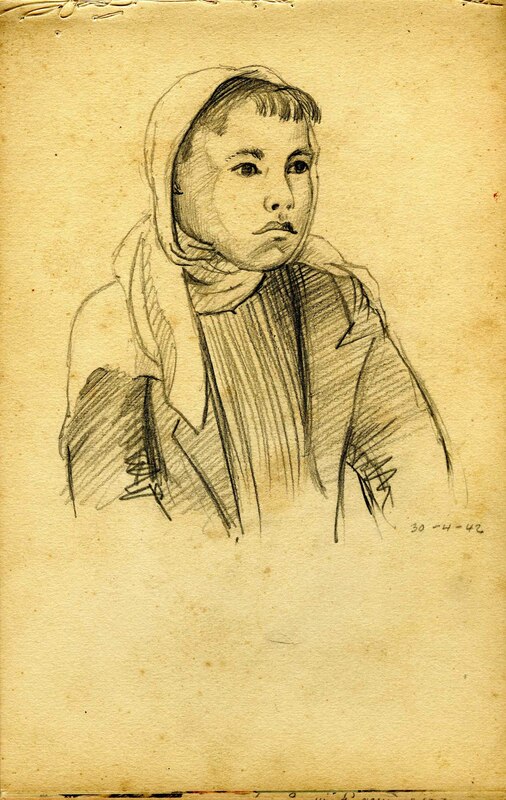 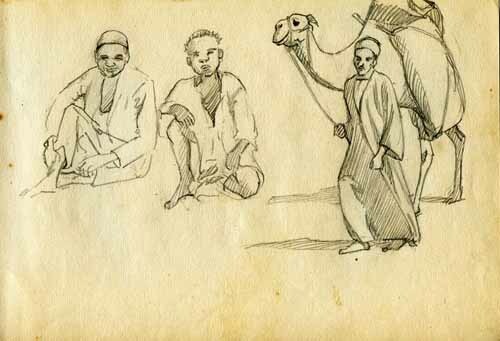 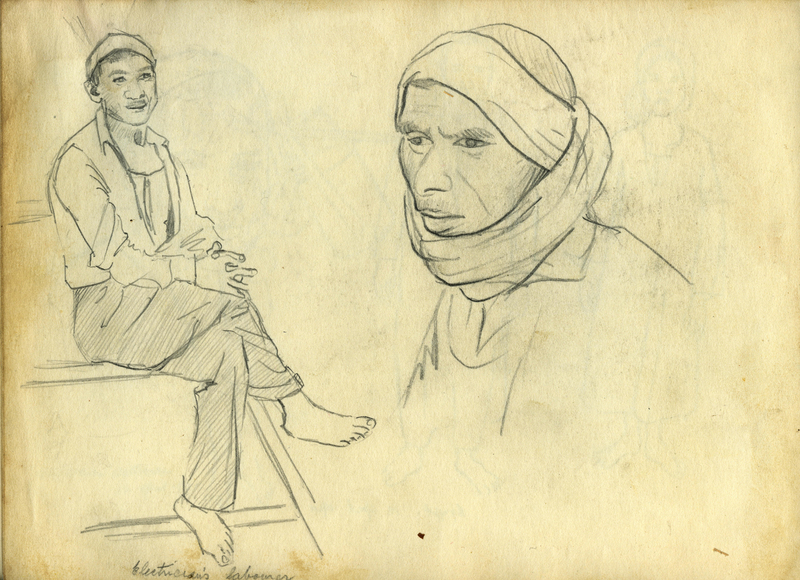 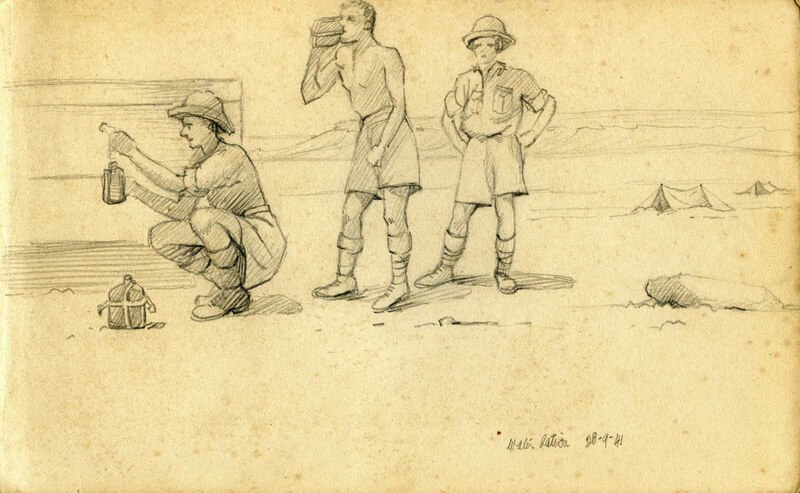 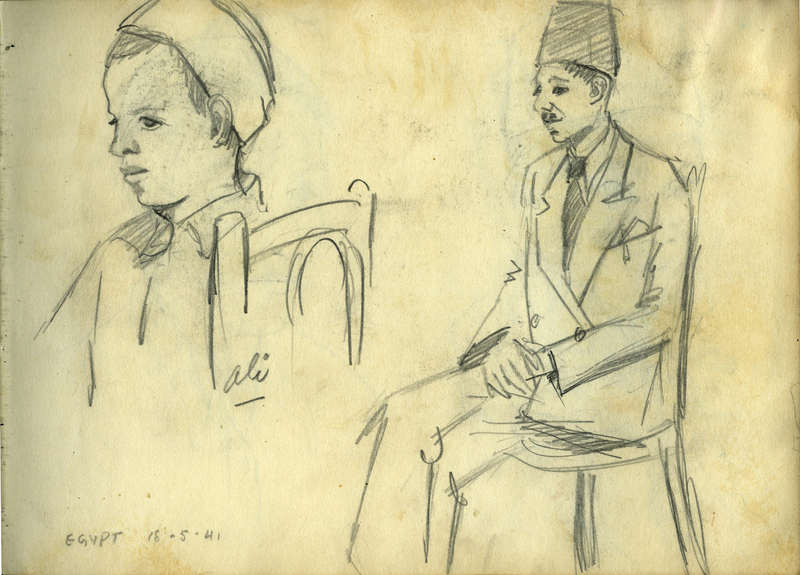 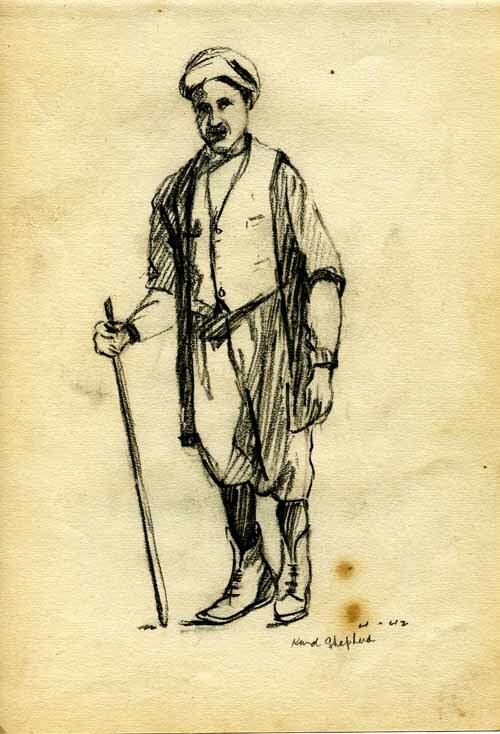 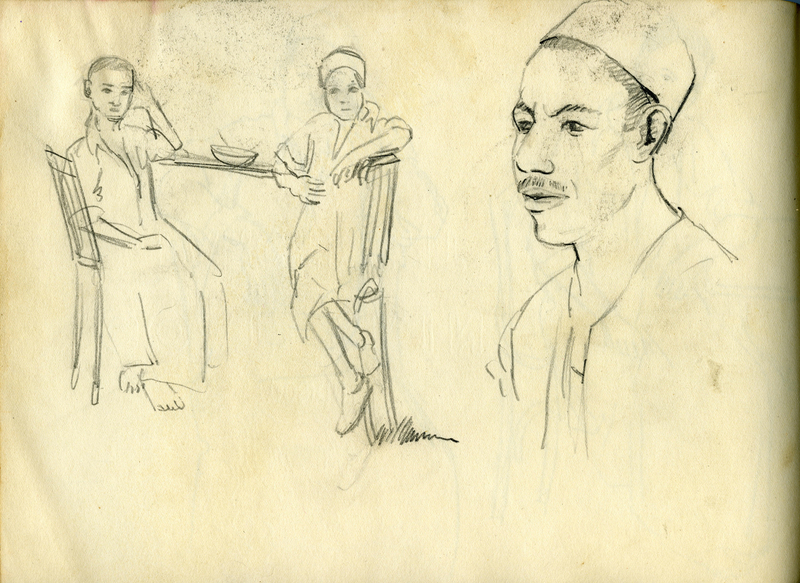 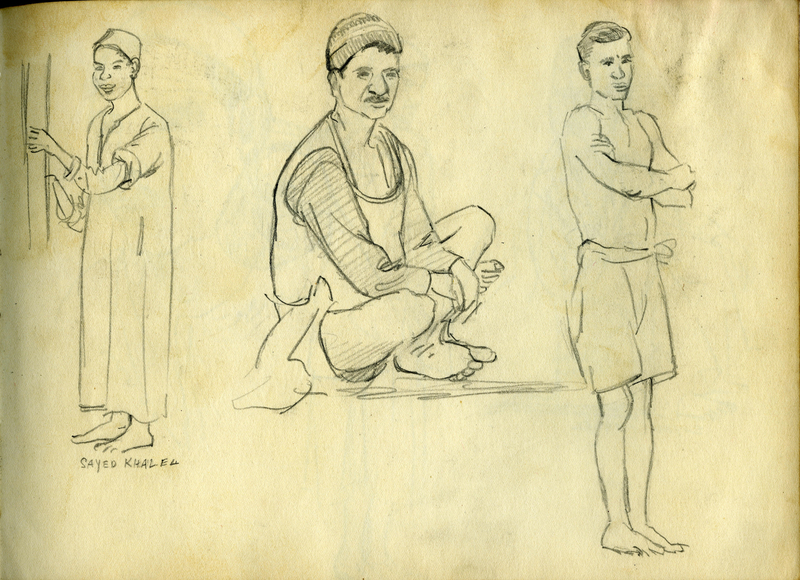 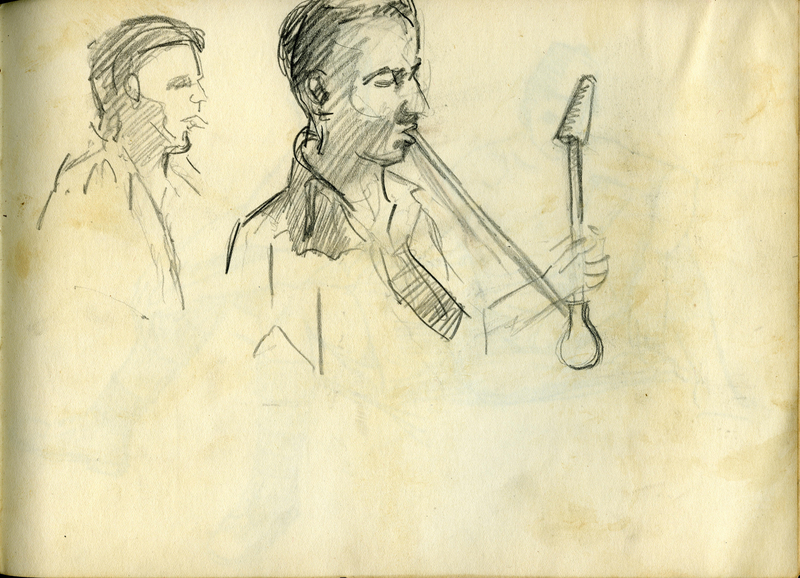 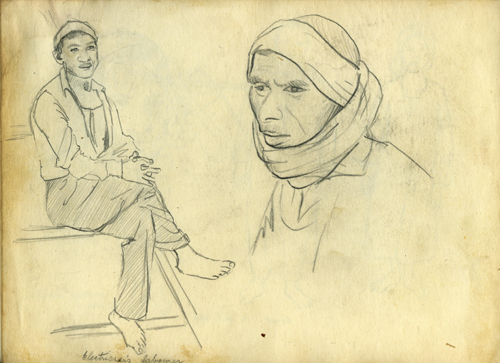 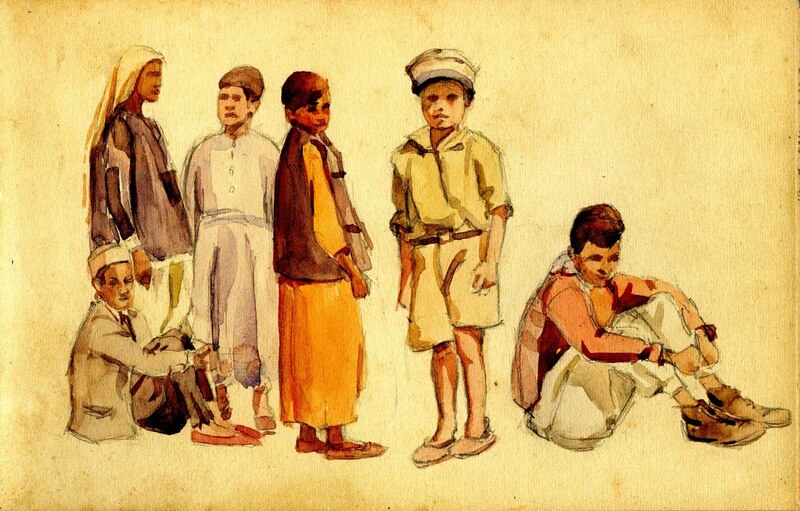 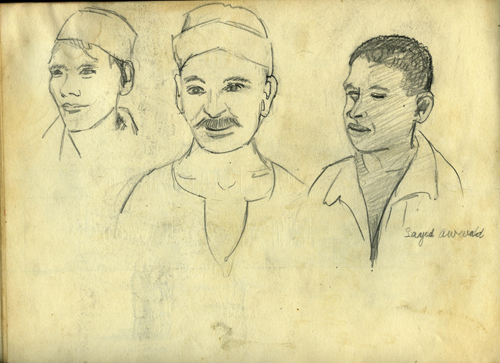 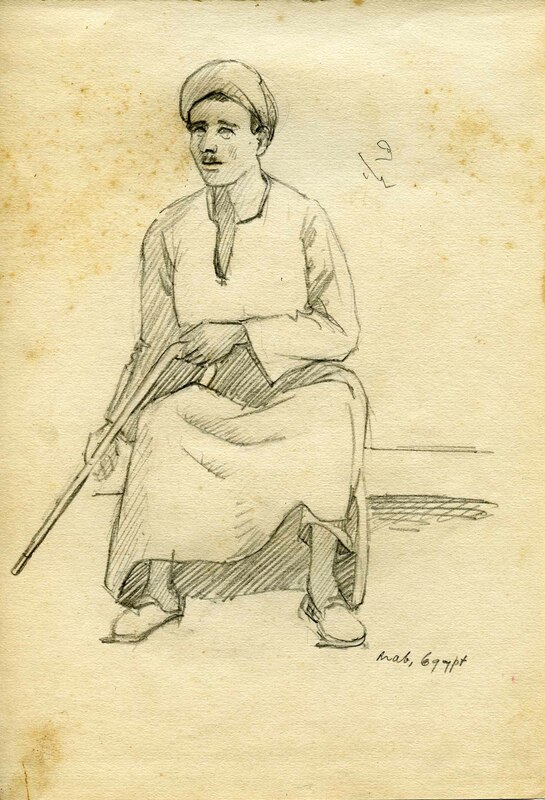 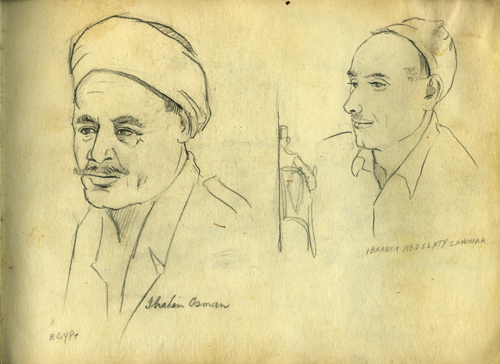 There are many sketches from his time in India, en-route to Egypt and in Egypt and Syria. Unfortunately, very few sketches have survived from his time in Italy. 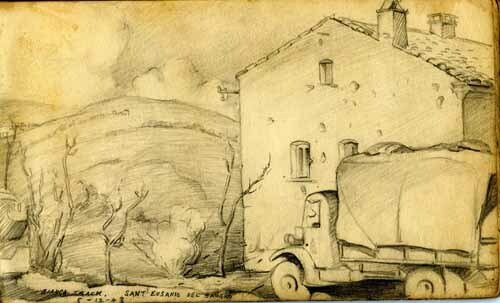 Given the nature of the war in Italy, he may not have had the time or enthusiasm to record those scenes. 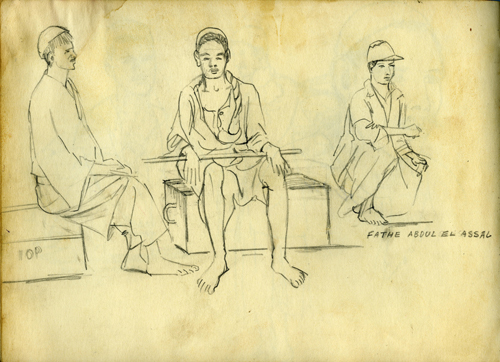 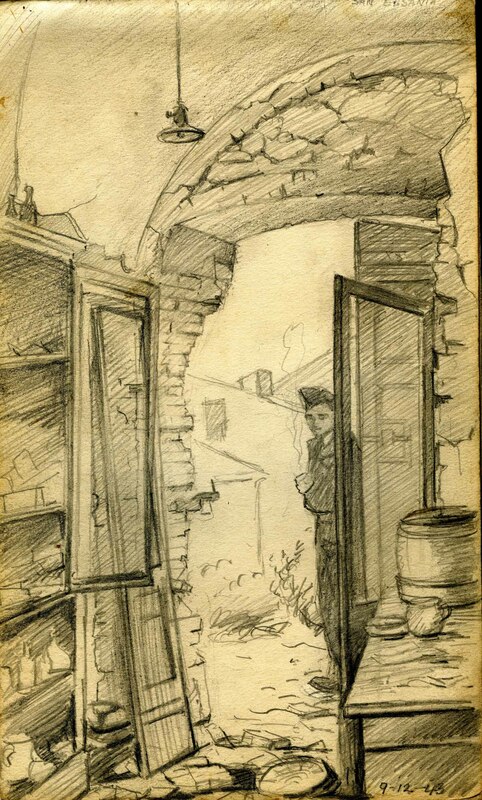 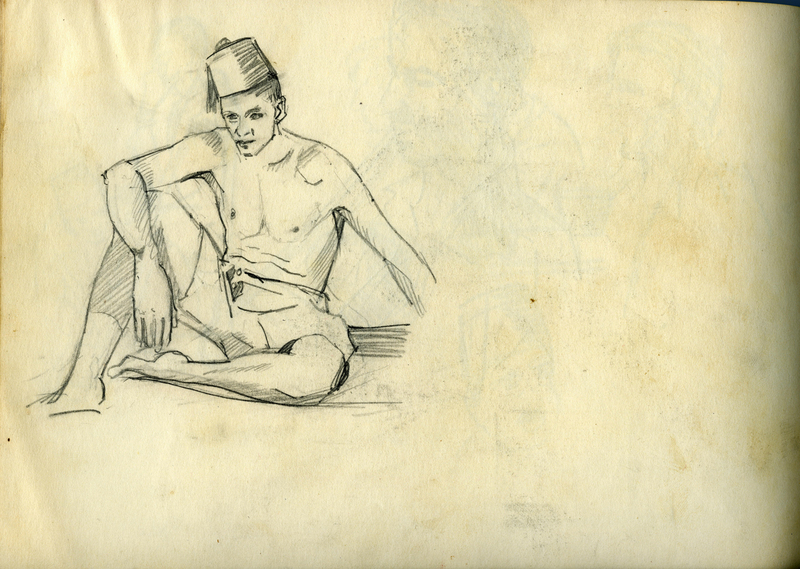 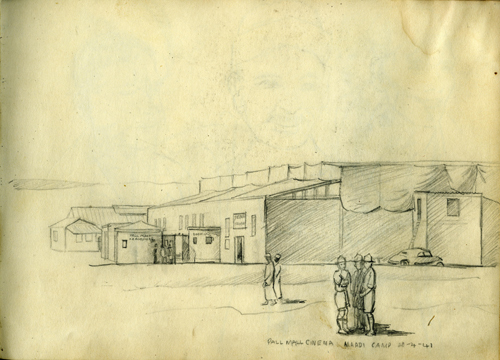 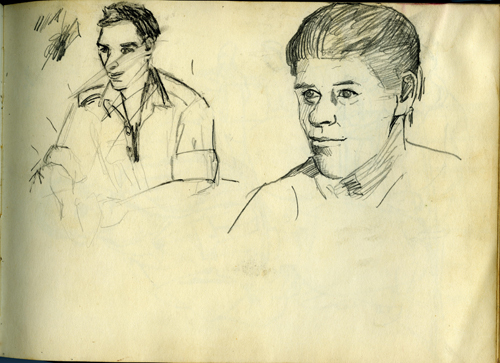 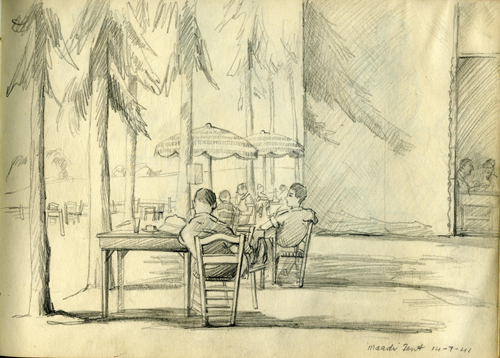 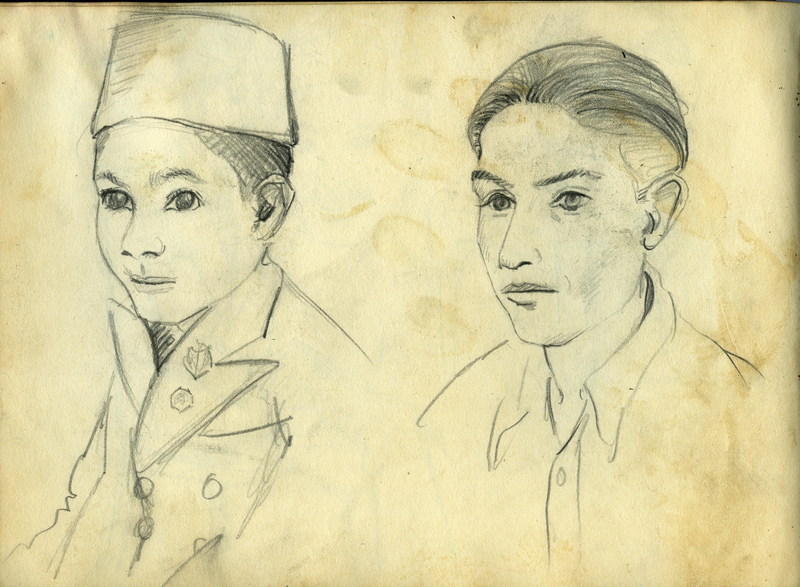 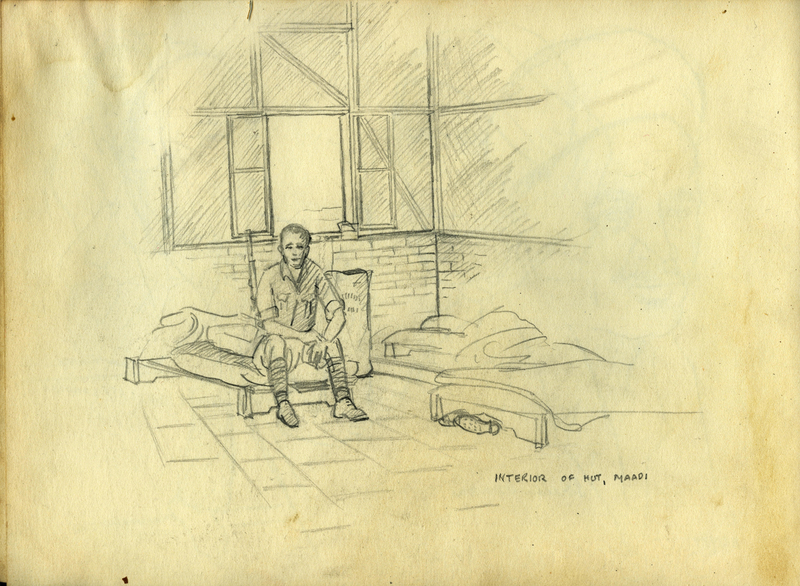 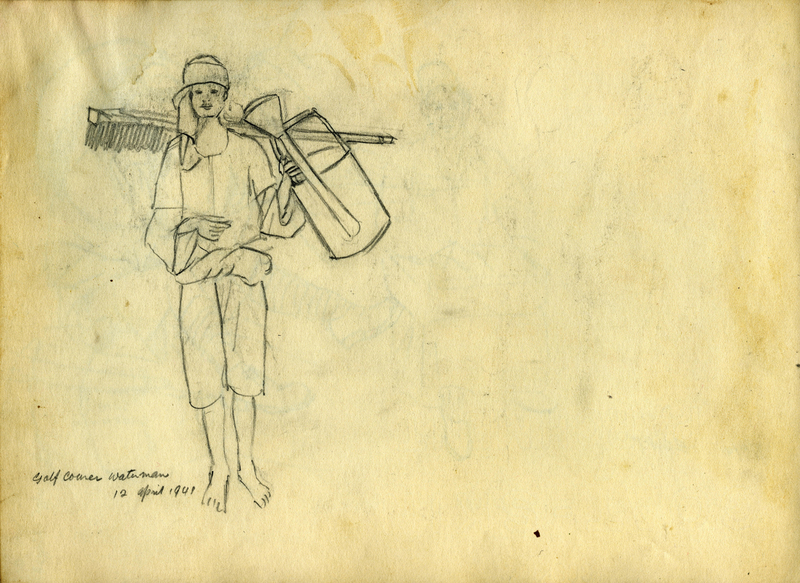 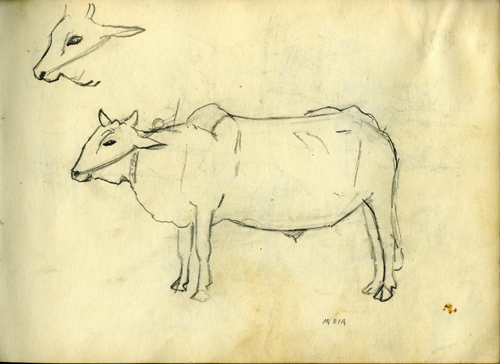 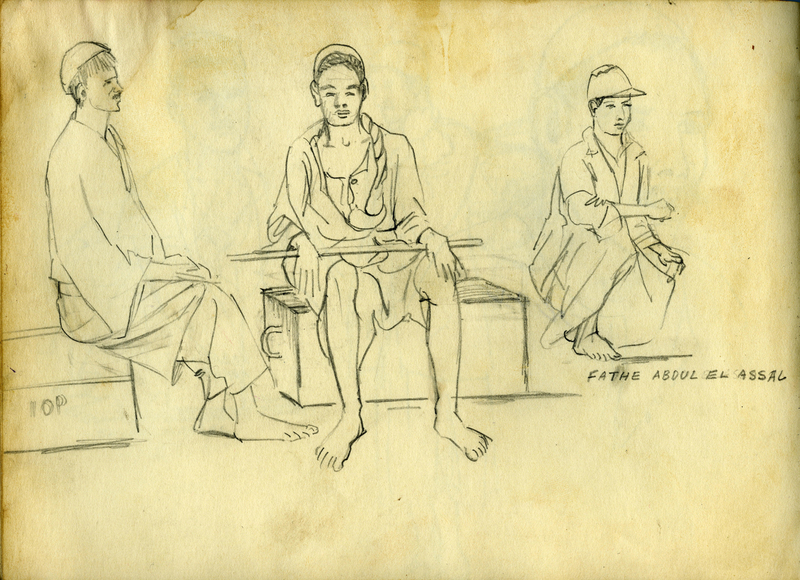 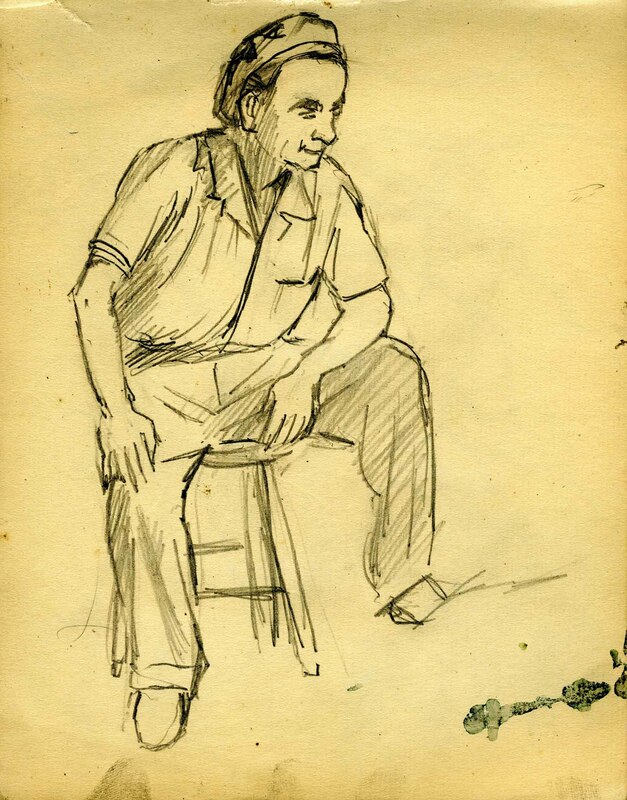 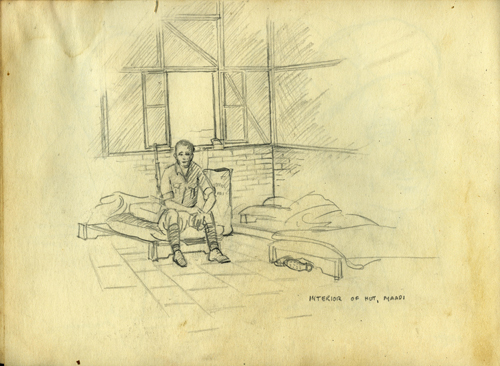 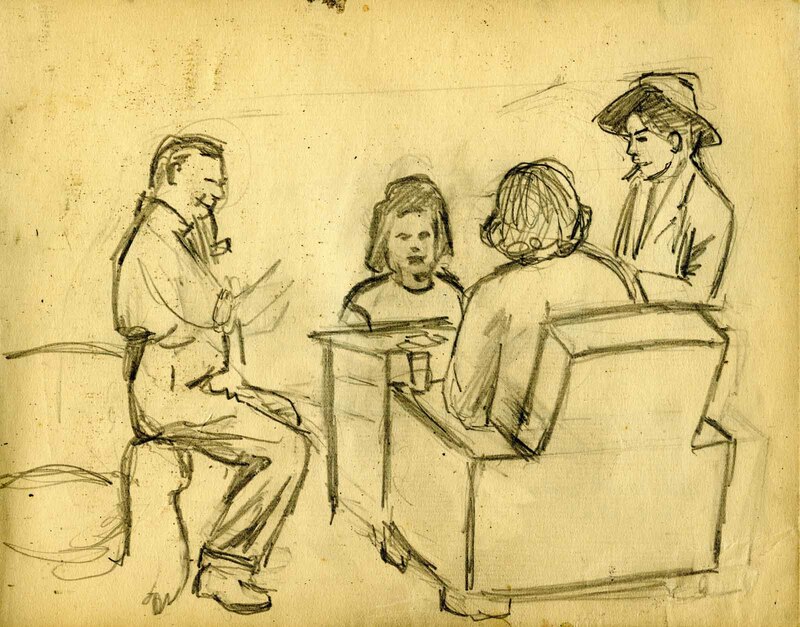 After the war, his surviving sketch books are fragmented. They do not form a chronology of his works and interests. 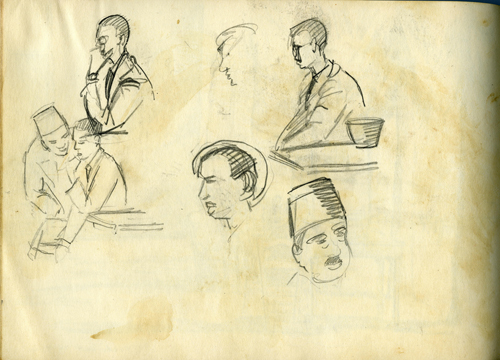 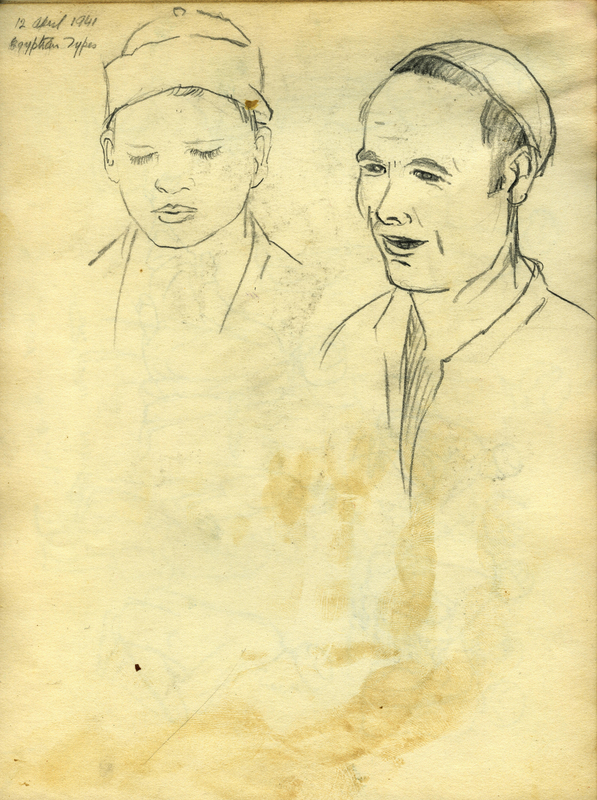 Many are undated and there are sketches at least ten years apart on adjecent pages. 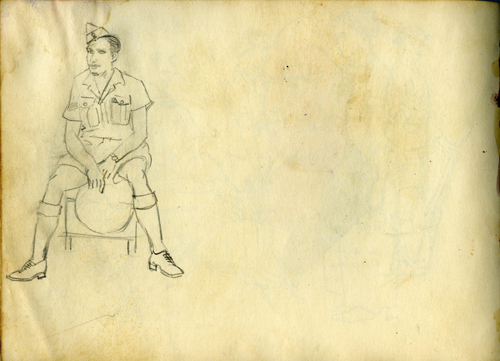 To lay out the sketches, I have grouped all the war-time ones together in the best chonological order possible. 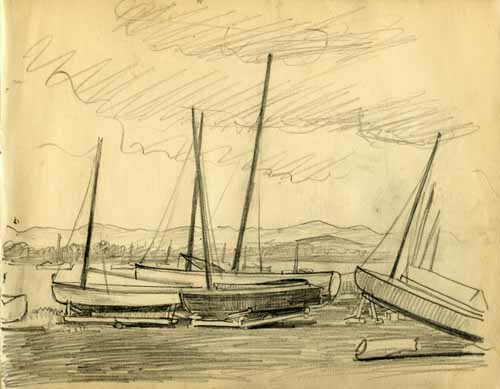 These are followed by his remaining works by theme - landscapes, people and nautical. 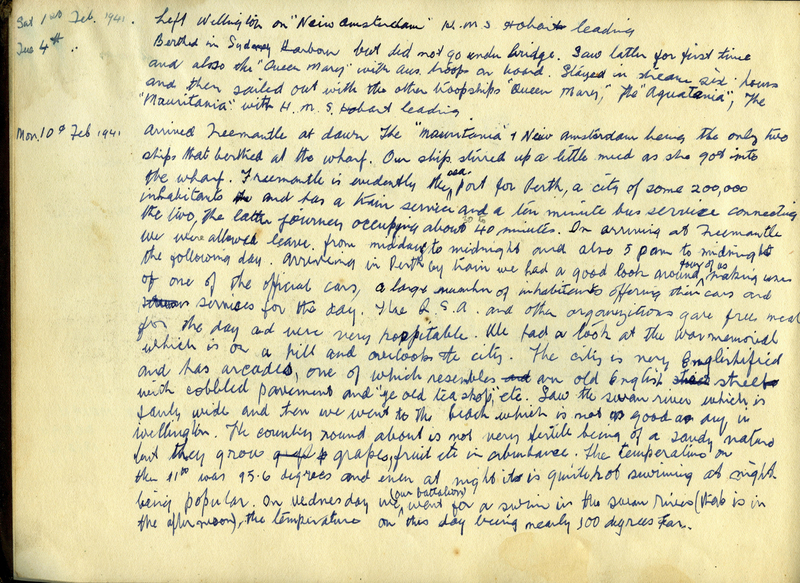 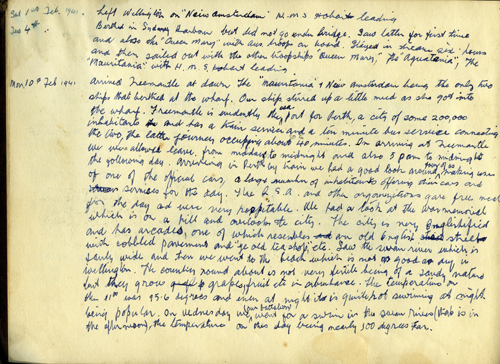 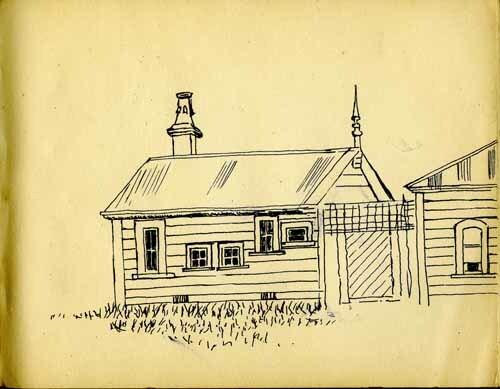 The New Zealand National Archives holds one example of Charles Paterson's work. 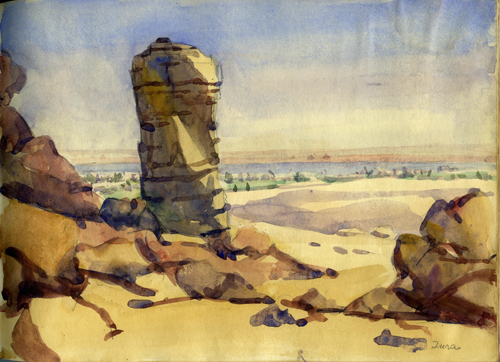 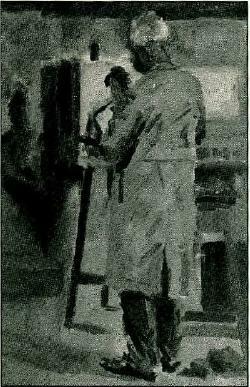 Charles exhibited several of his works at a series of exhibitions held in Cairo. 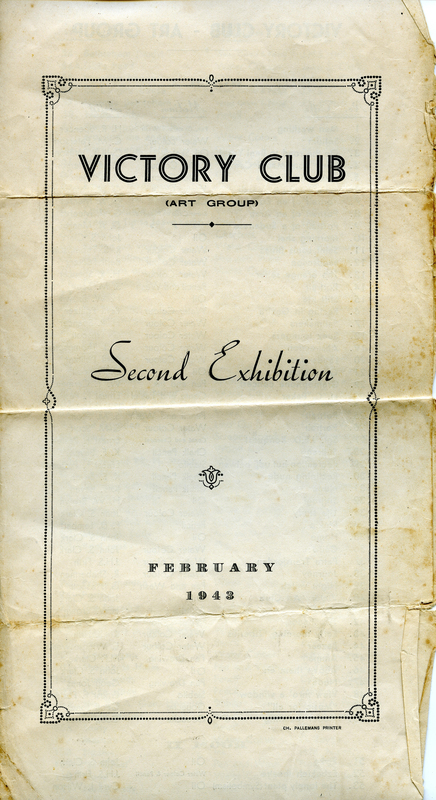 The Third Exhibition must have been a grand affair, being held first at the Continental Savoy Hotel (the top class hotel in Cairo, but alas now demolished) and then at the Victory Club. 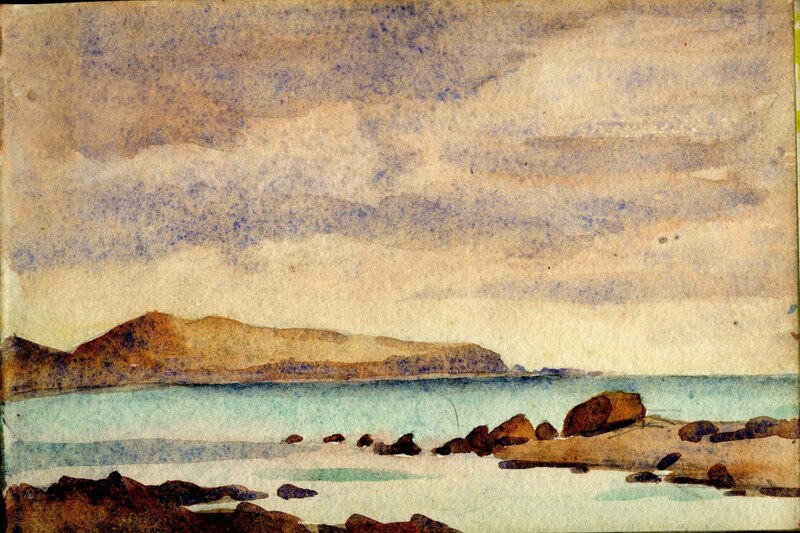 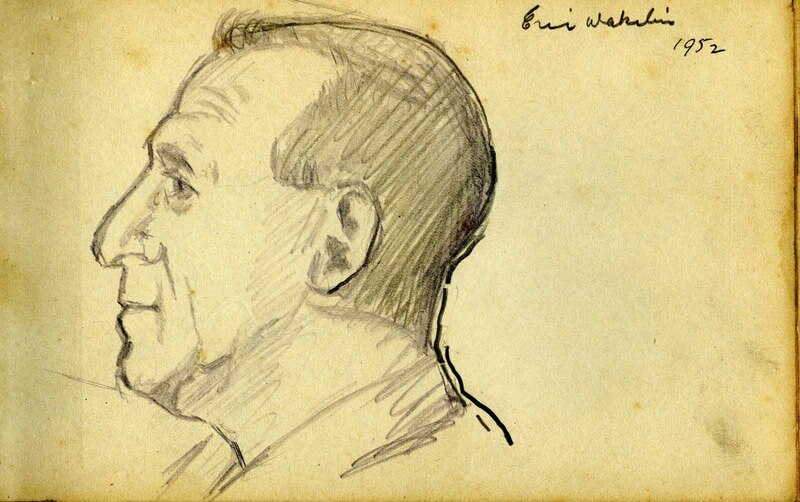 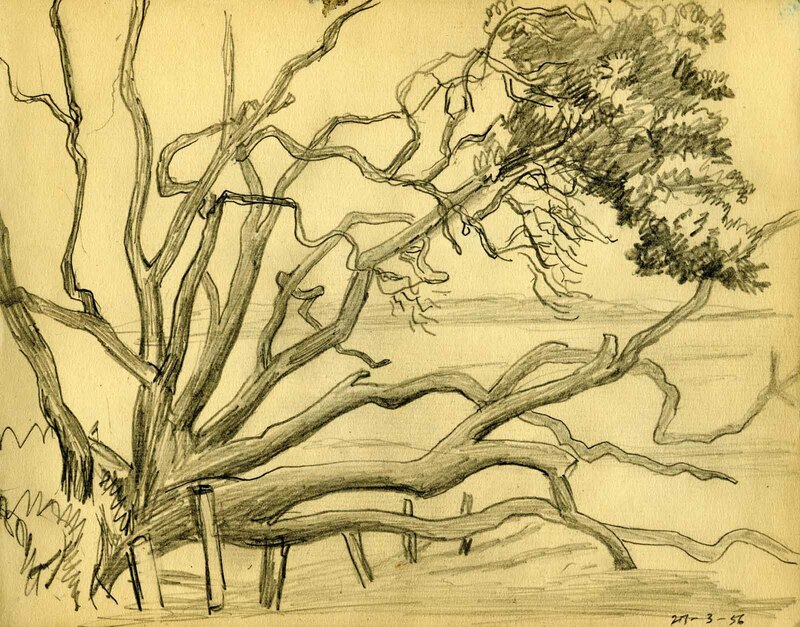 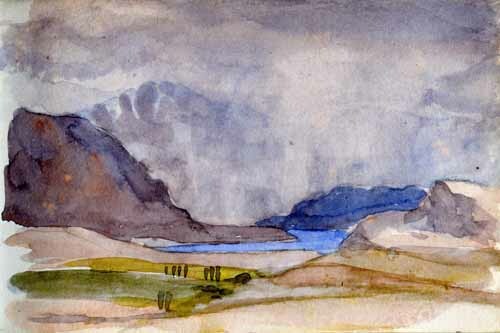 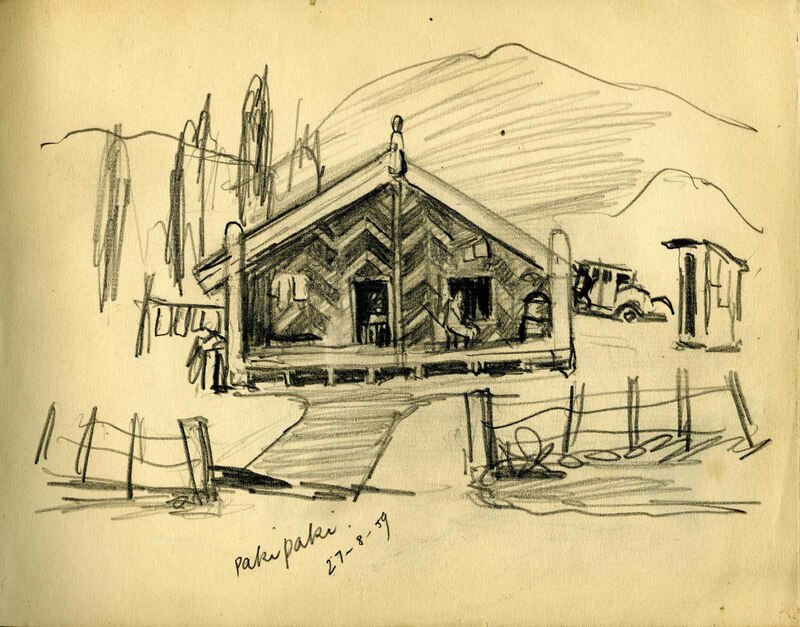 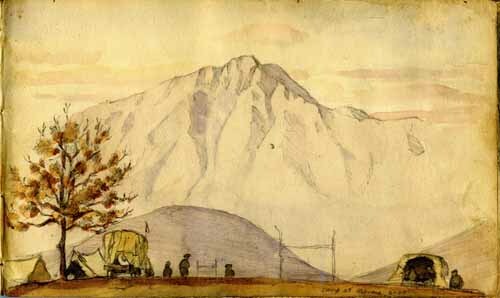 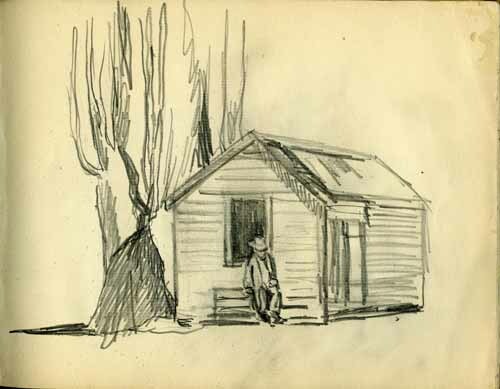 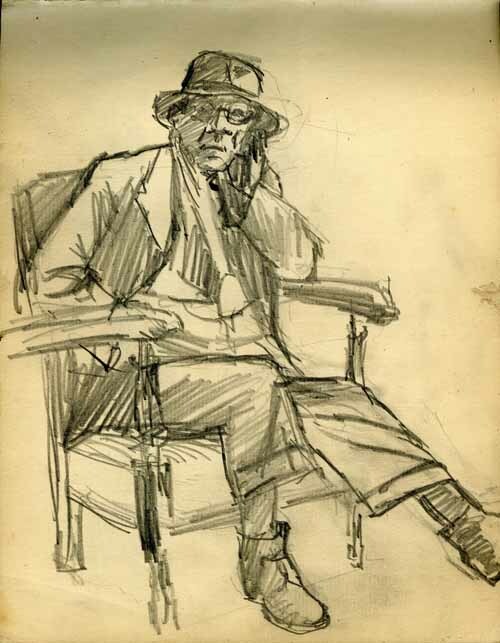 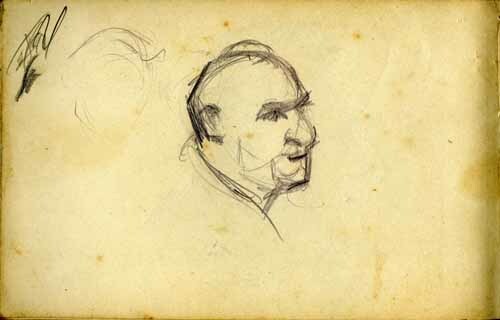 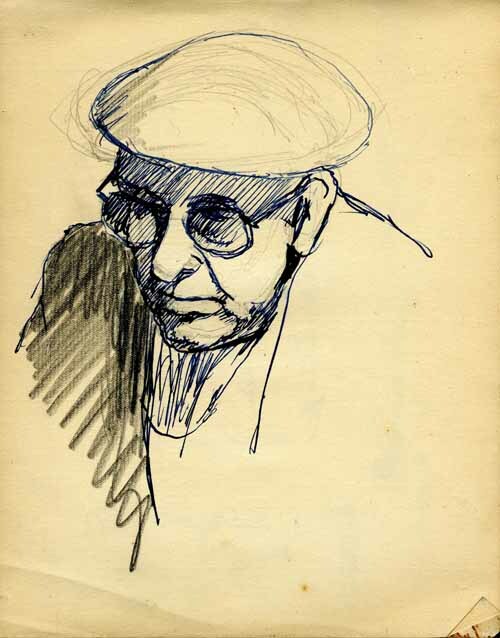 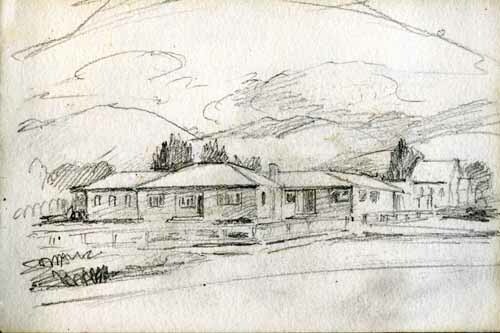 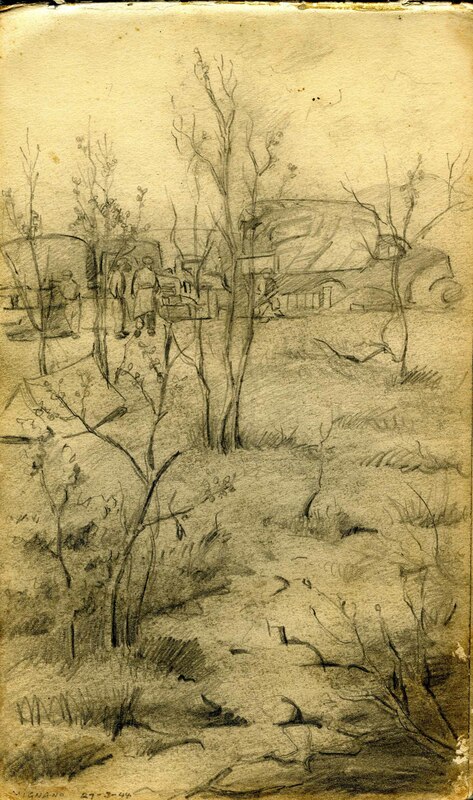 Soon after returning to New Zealand in 1945, Charles exhibited some of his work at the Wellington Sketch and Studio Club. 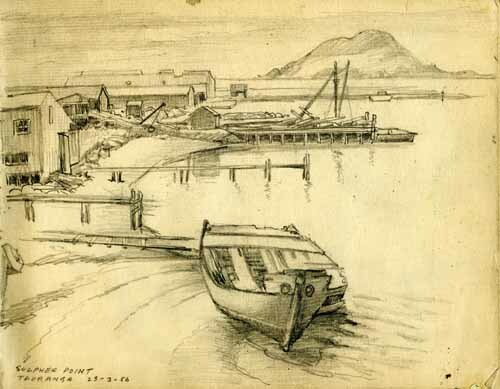 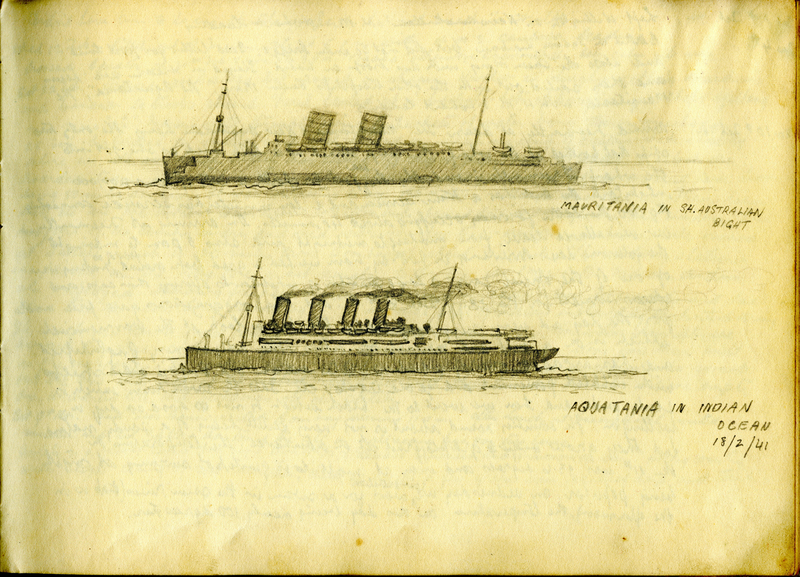 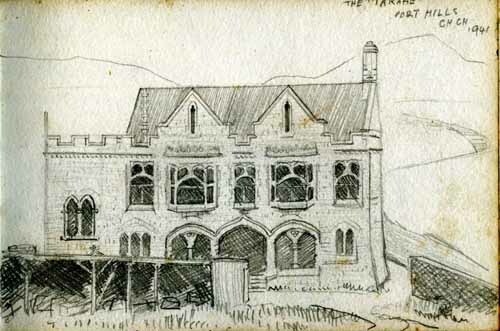 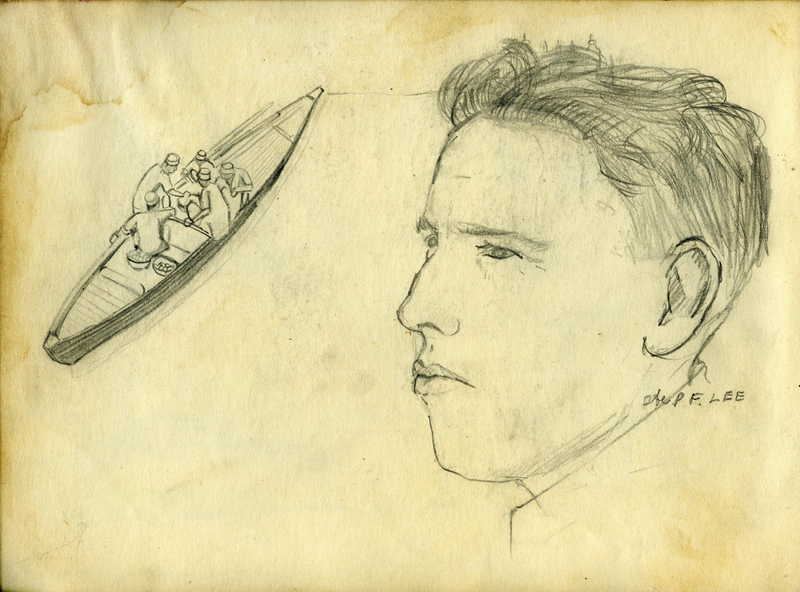 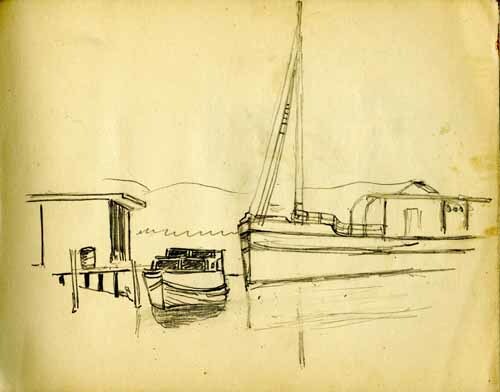 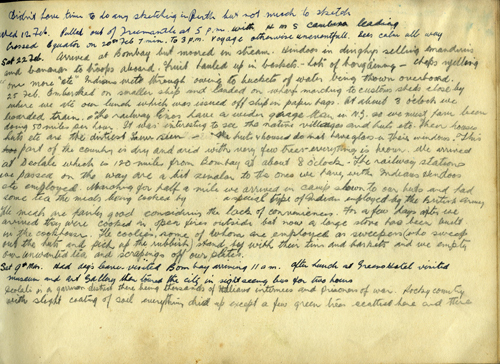 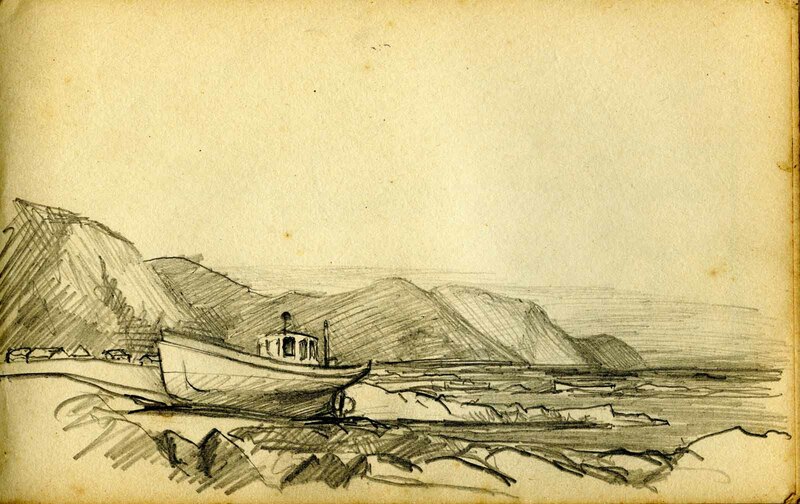 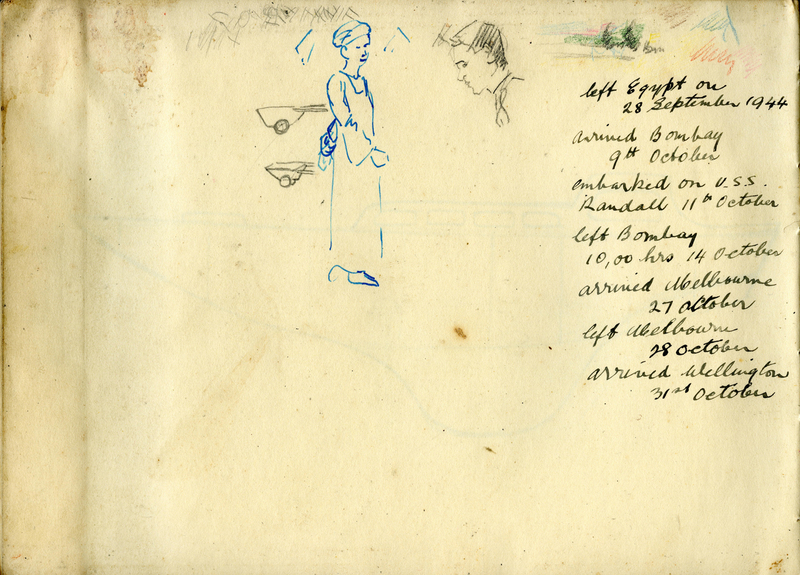 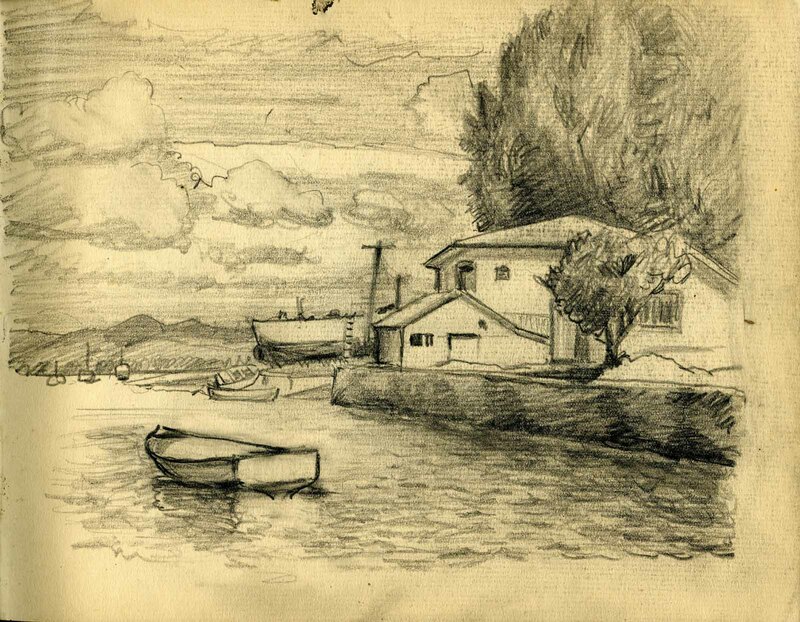 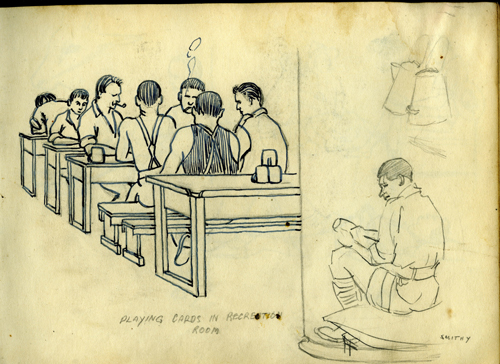 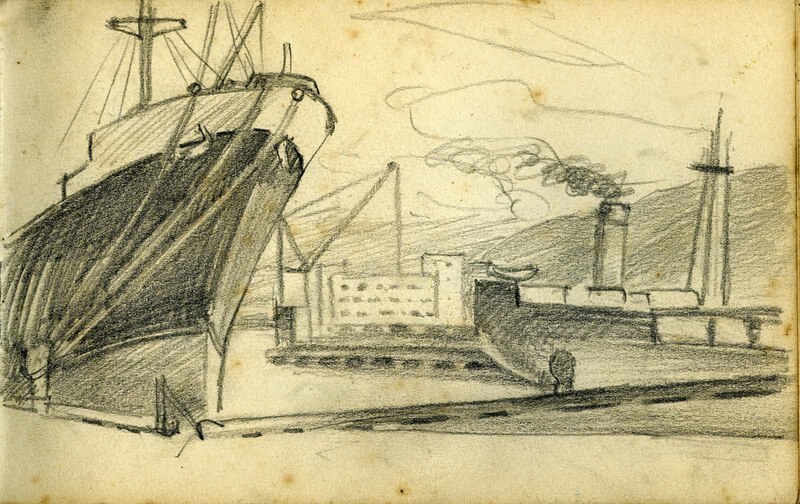 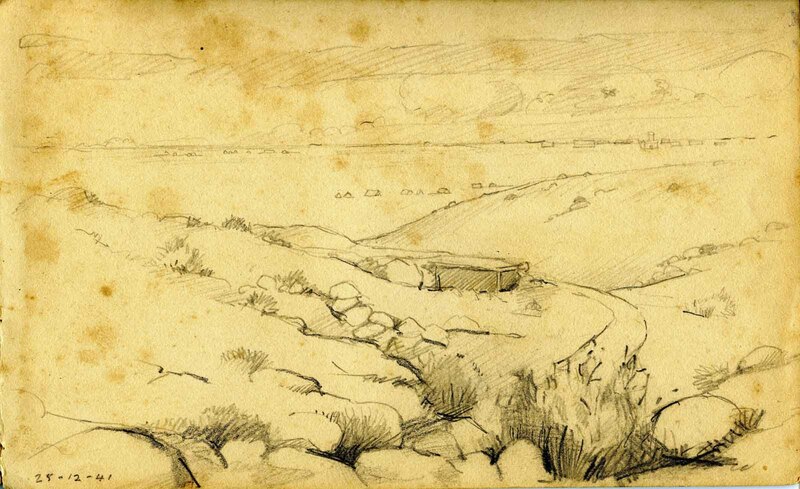 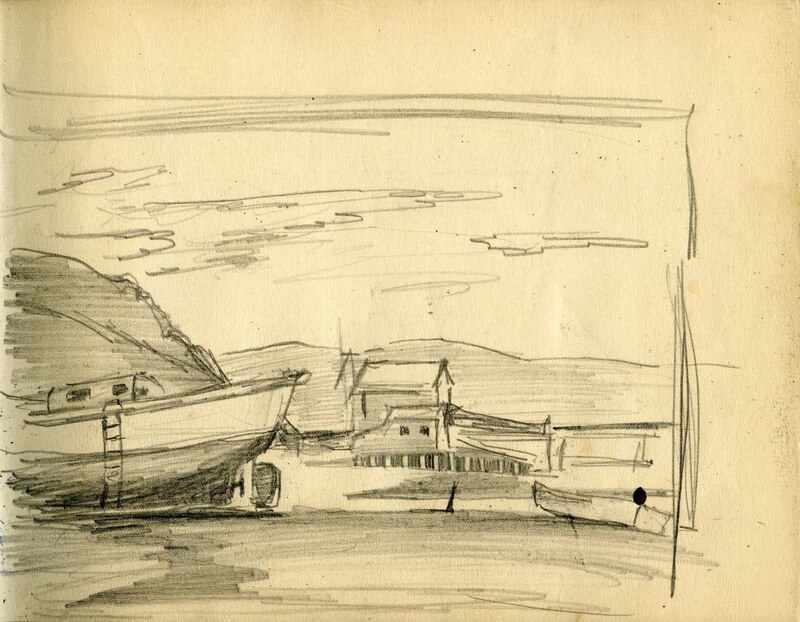 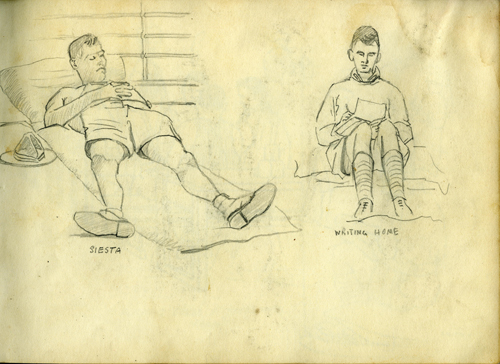 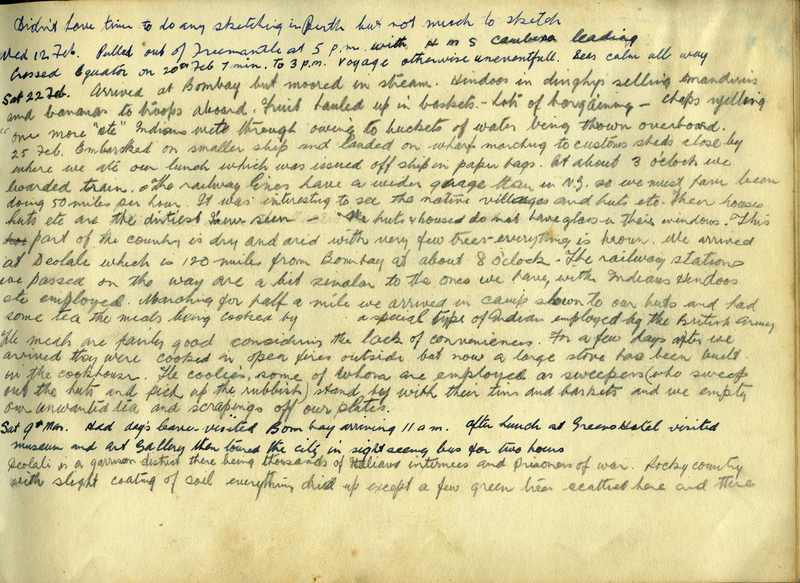 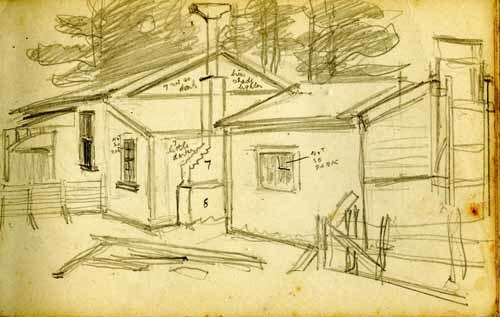 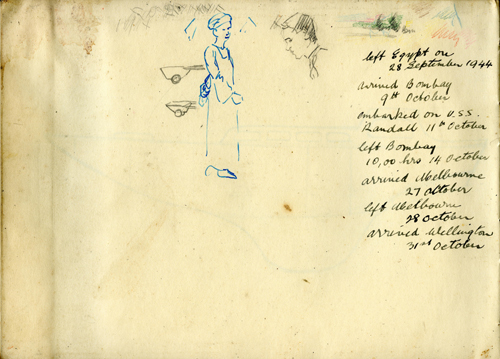 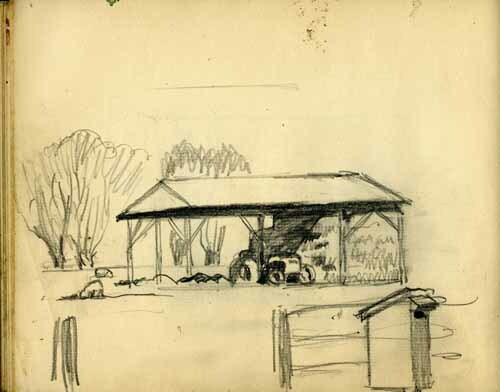 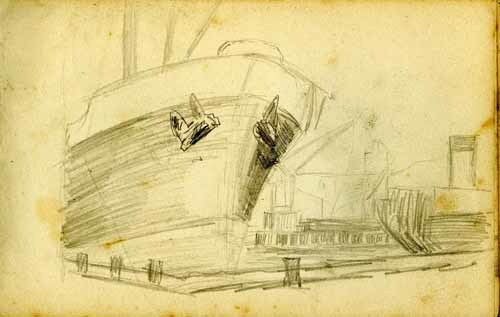 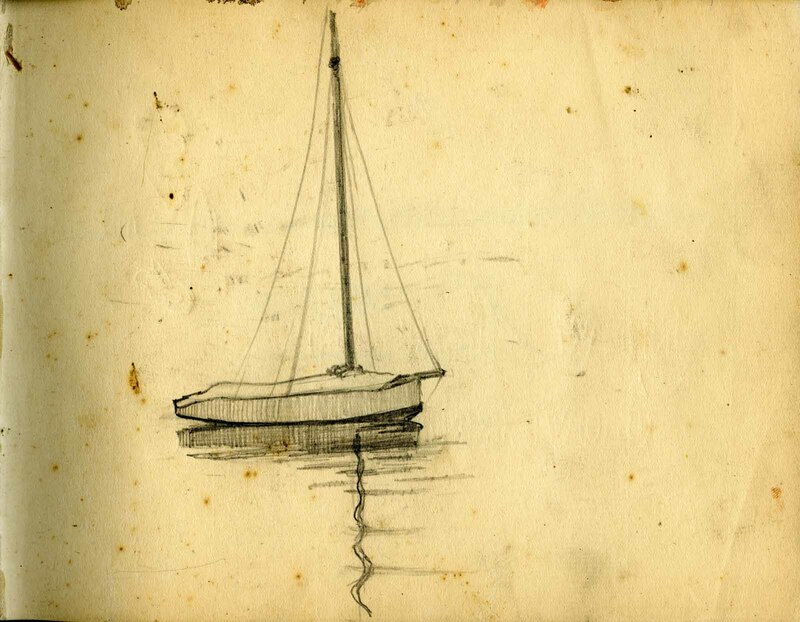 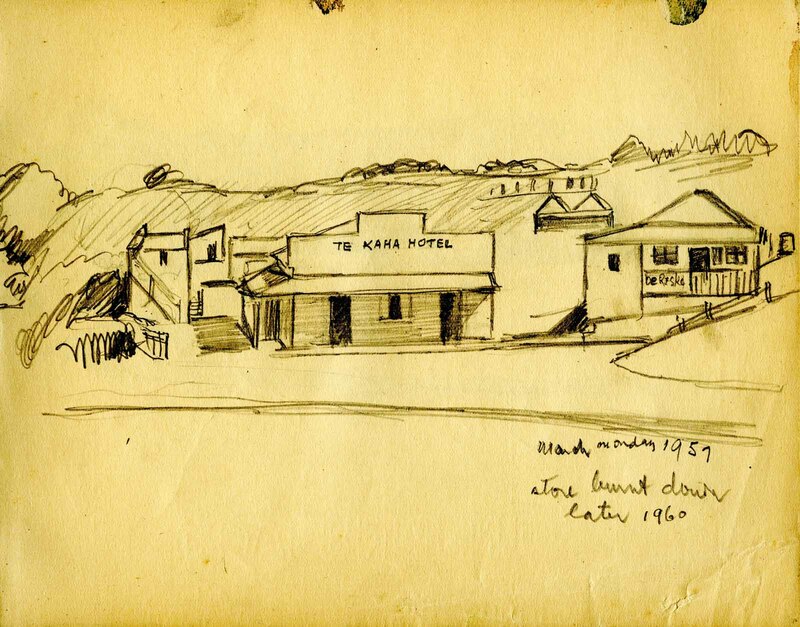 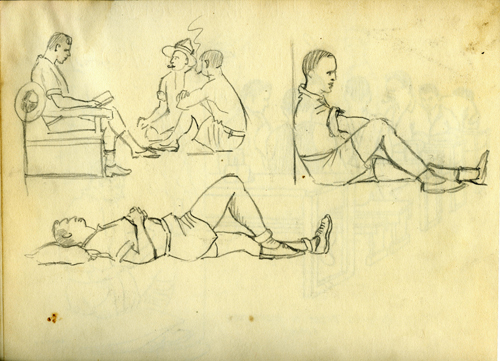 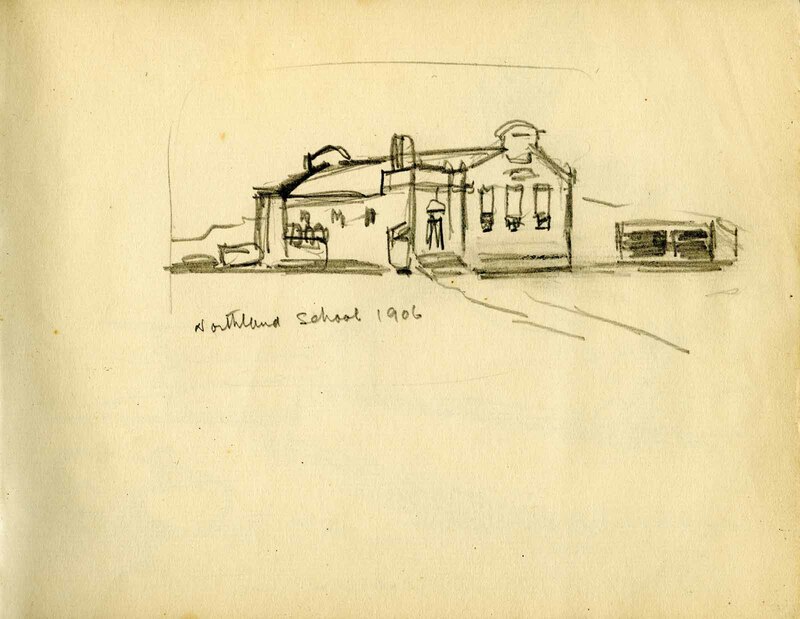 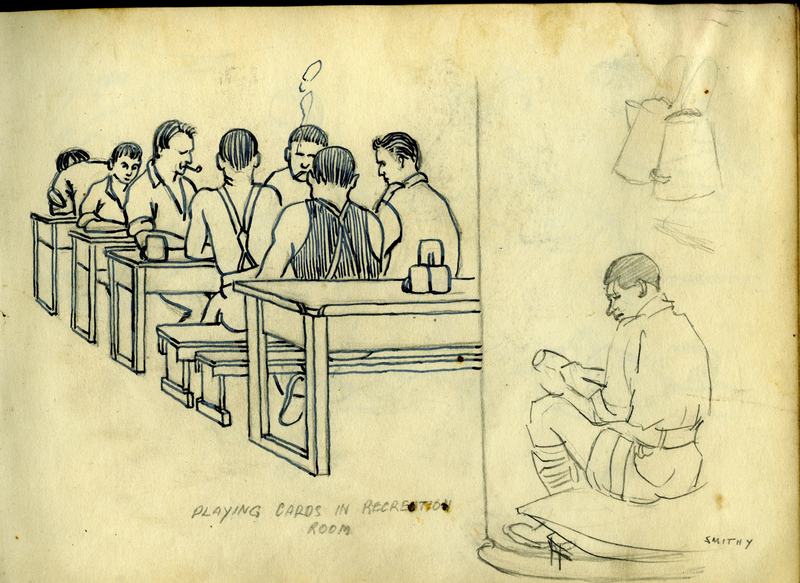 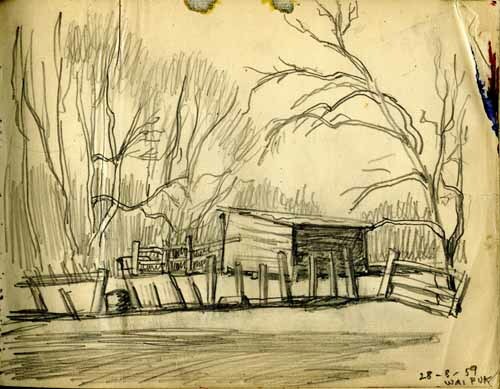 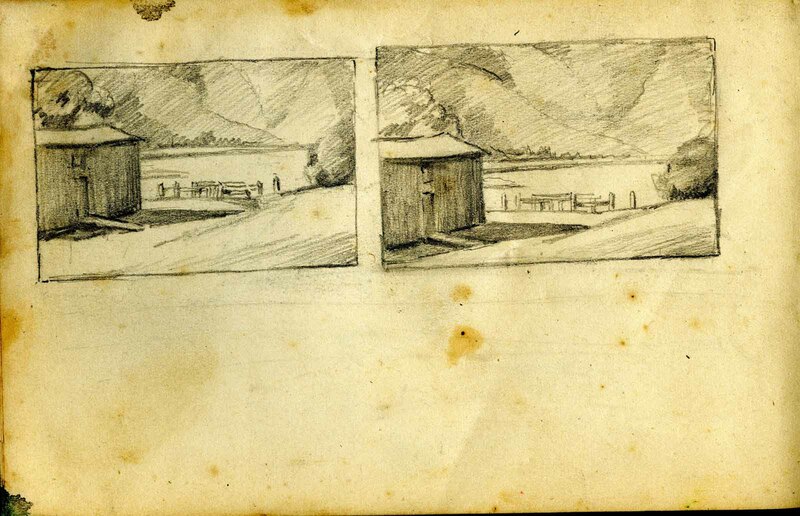 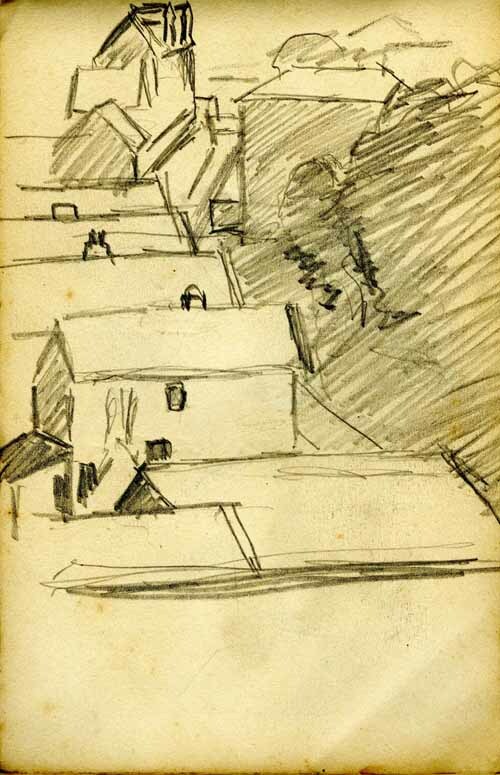 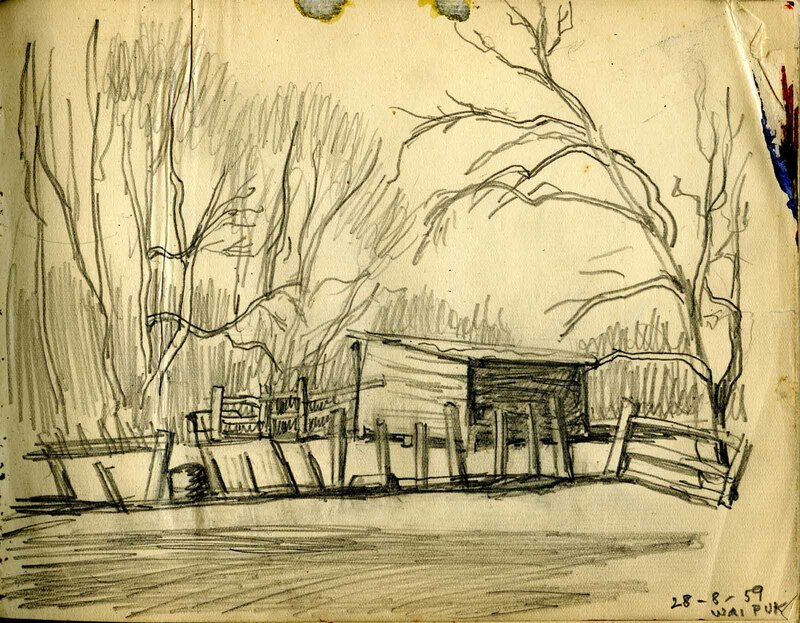 Charles started a new sketch book the day he embarked on the troop ship in Wellington Harbour. He started to keep a daily diary of events, but this soon became a brief record and stops when he arrived at Maadi Camp. 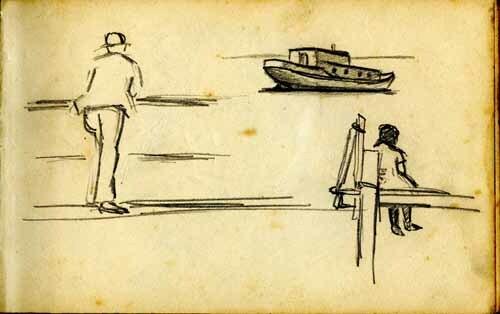 But along the way he took many opportunities to sketch what he saw. 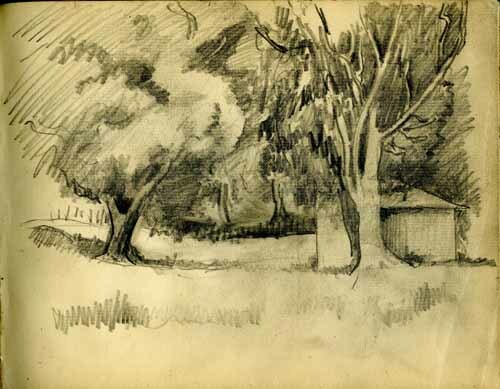 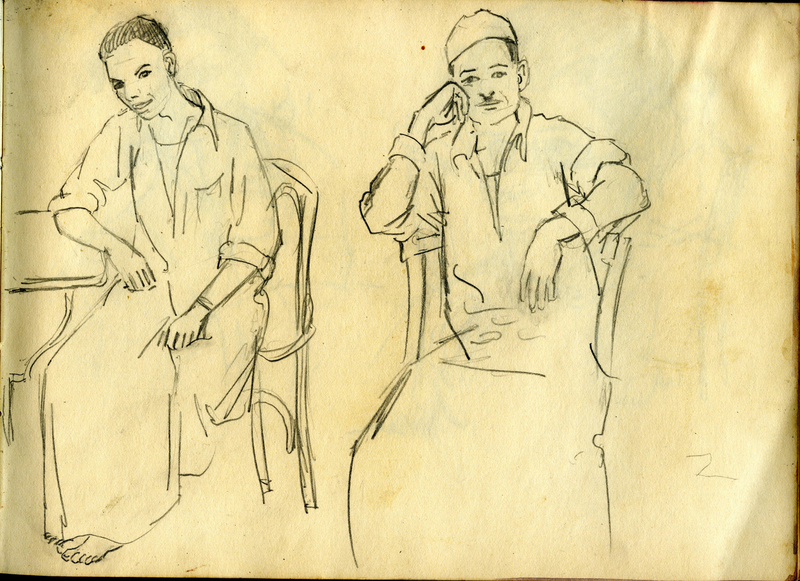 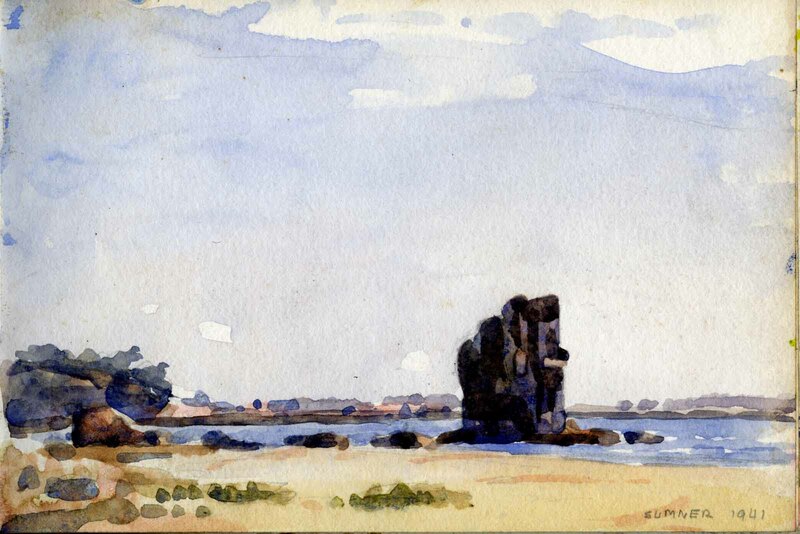 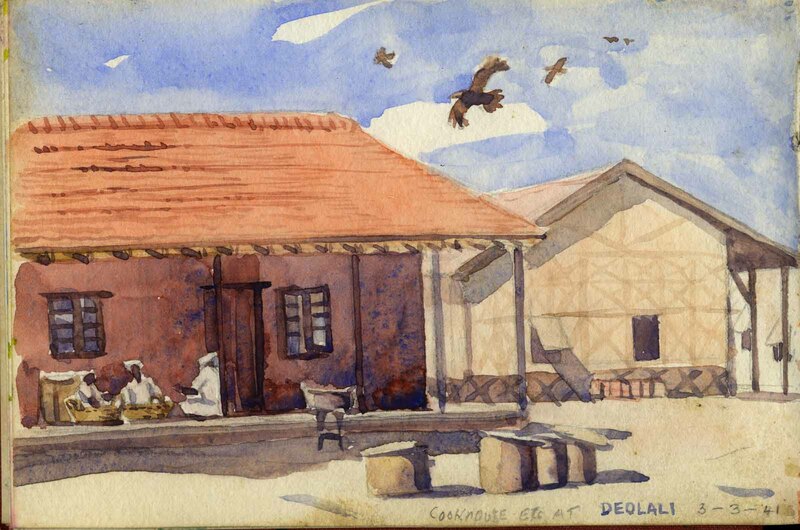 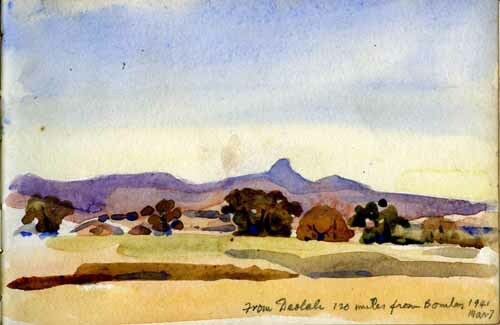 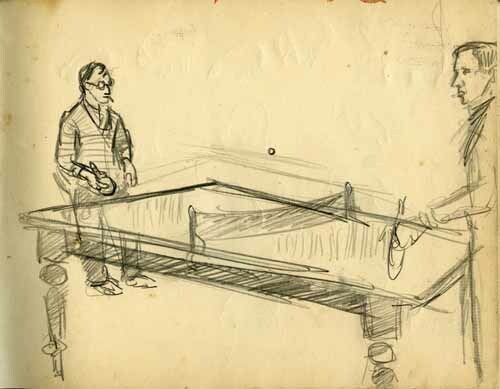 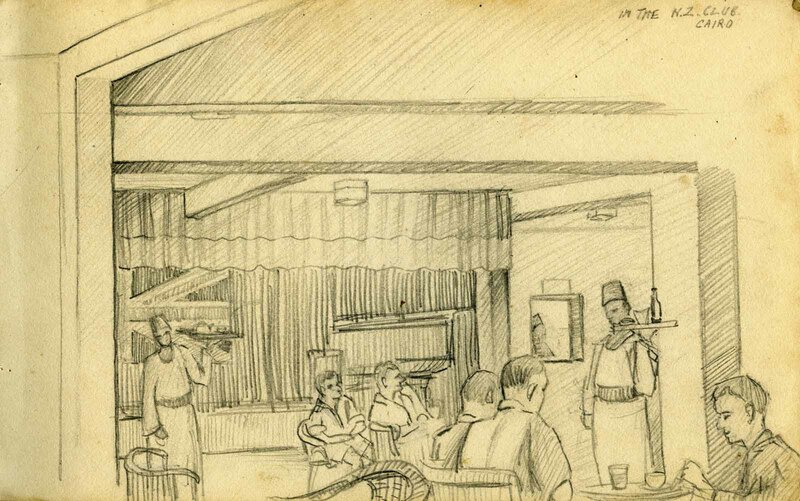 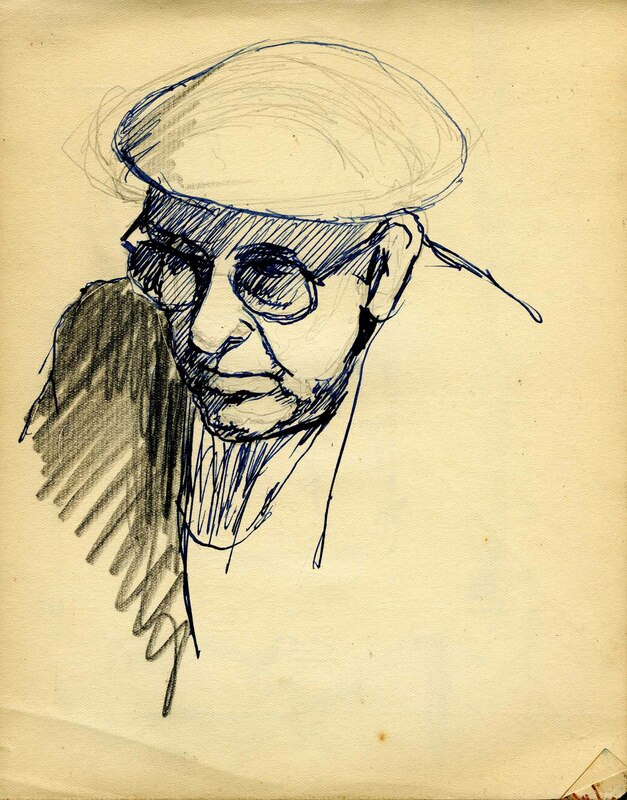 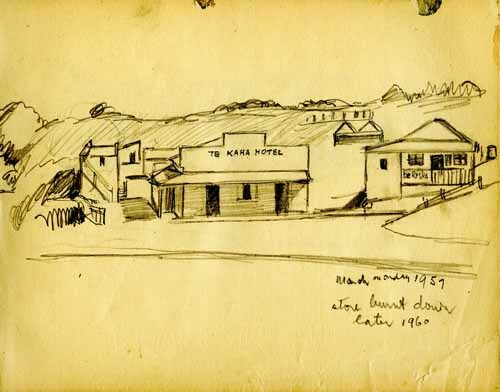 He did not sketch during the brief stopover in Perth, but did many in Bombay. 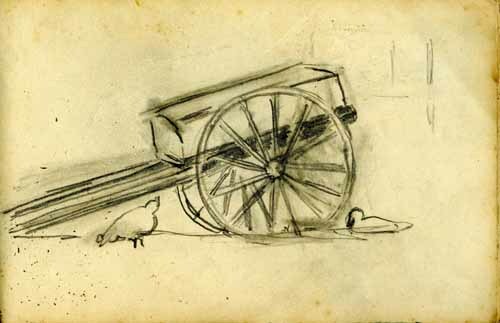 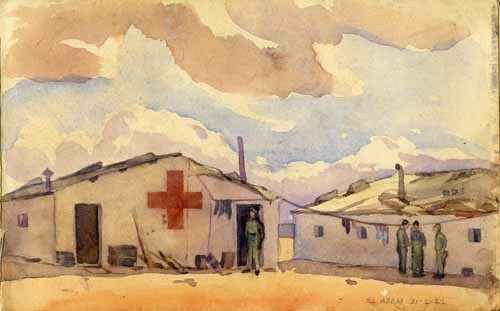 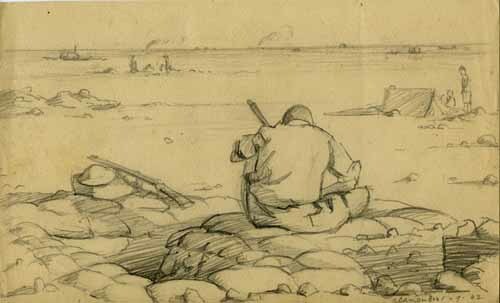 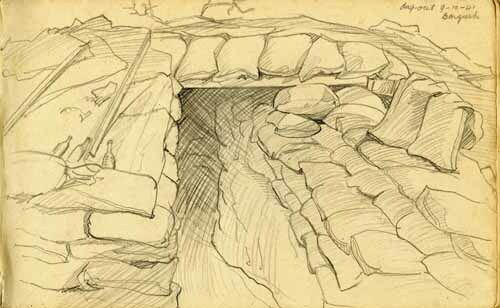 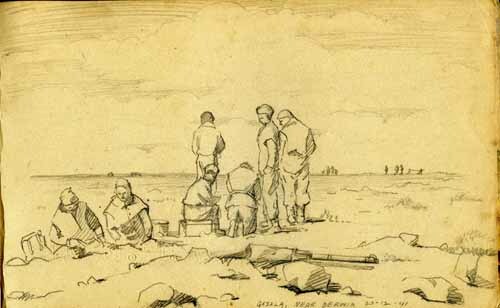 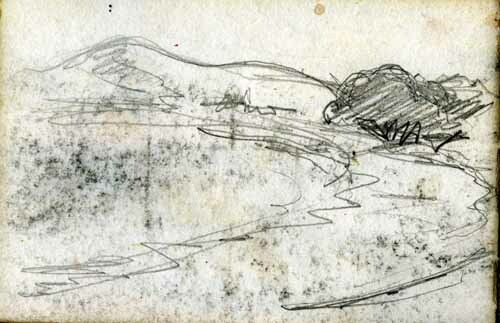 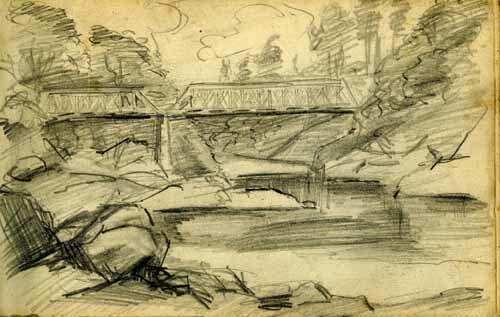 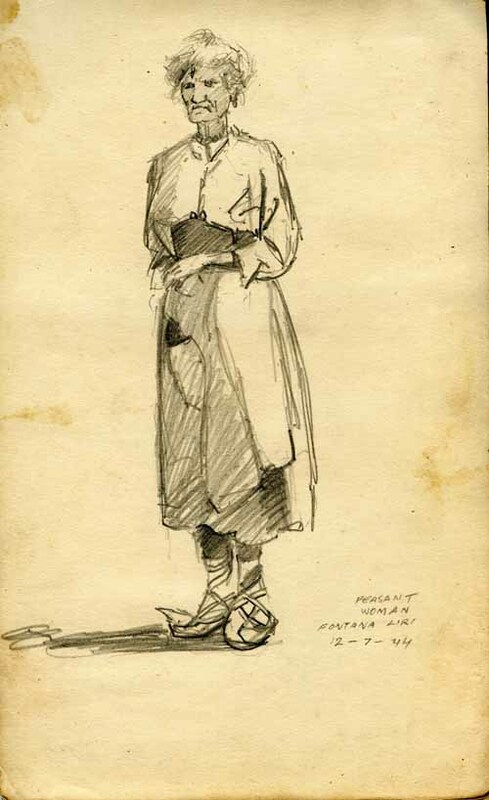 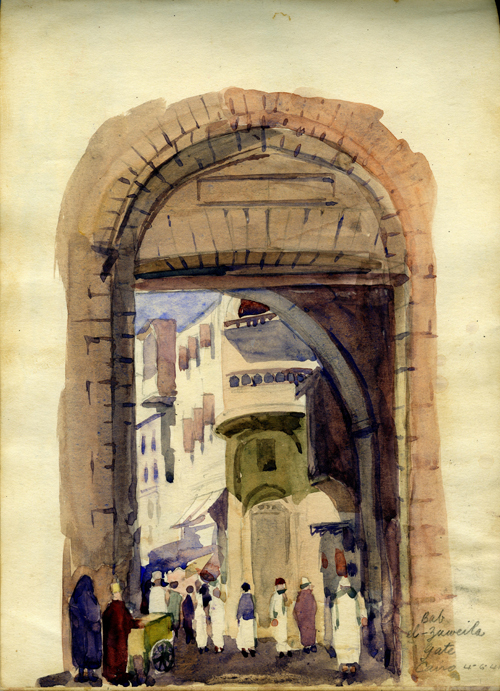 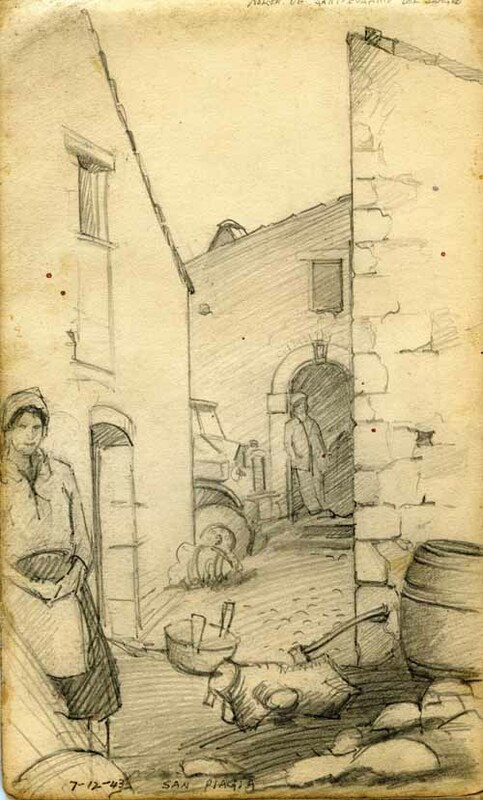 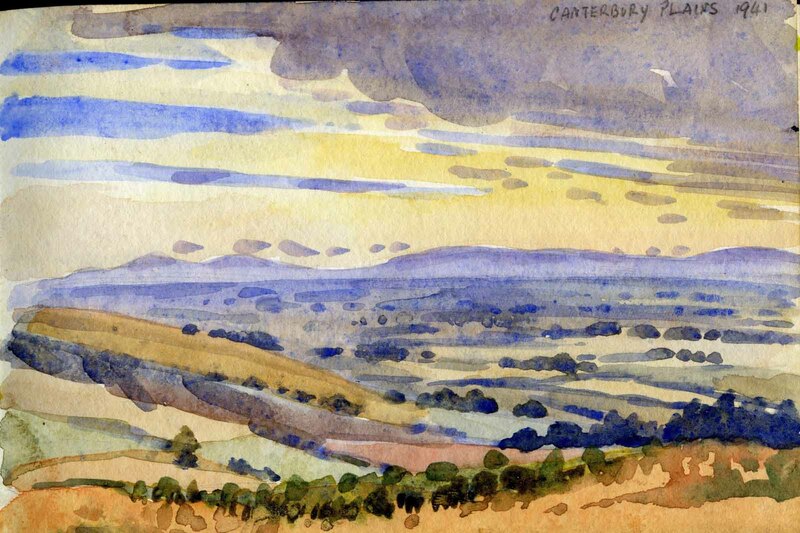 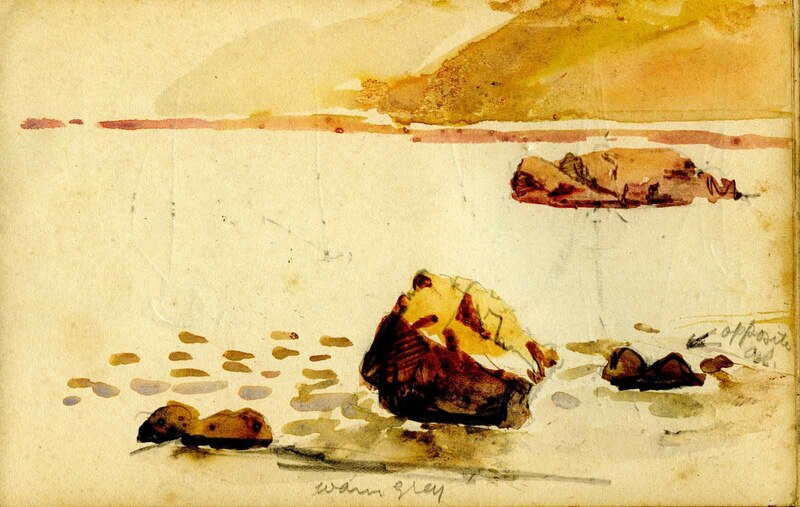 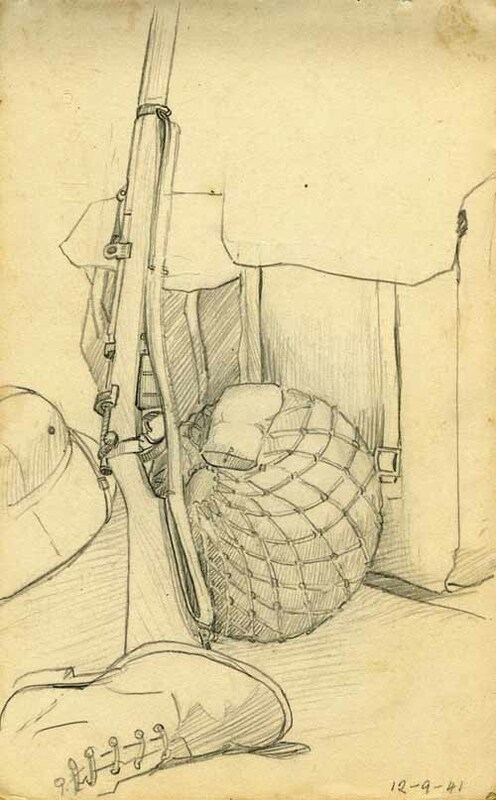 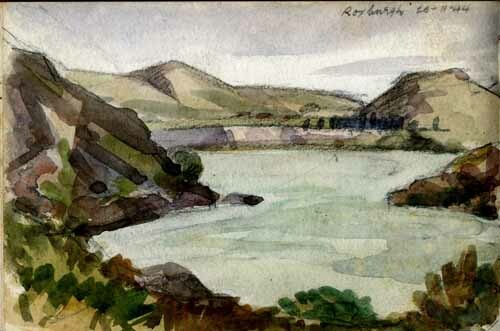 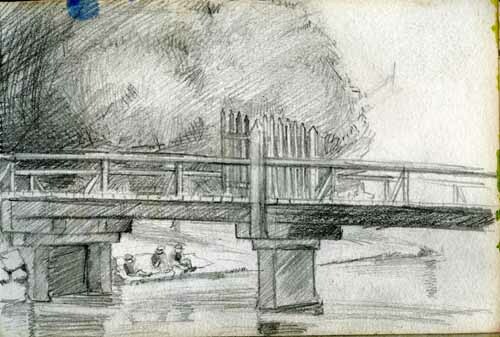 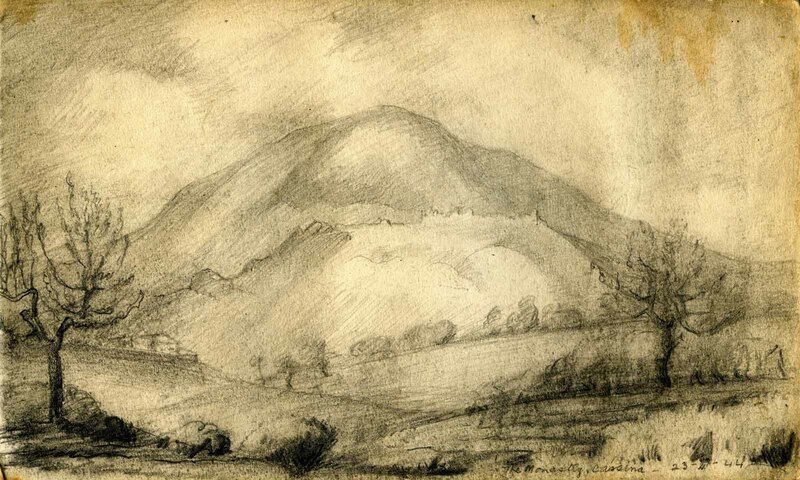 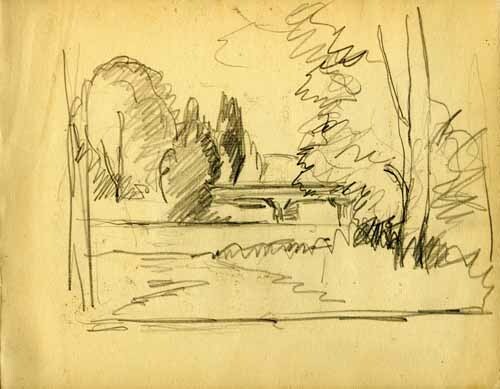 His war-time sketches and watercolours are arranged in he best chronological order possible. 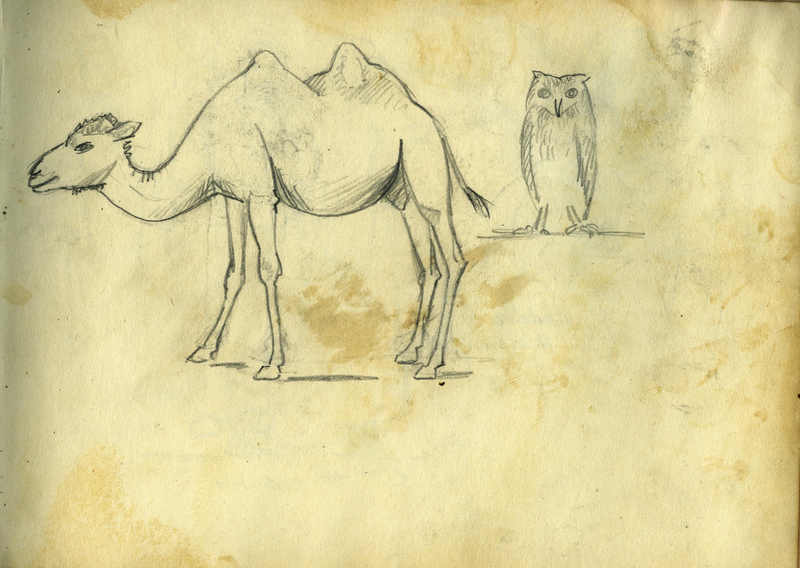 Some have dates, but many do not. Some of the handwriting may be hard to read. 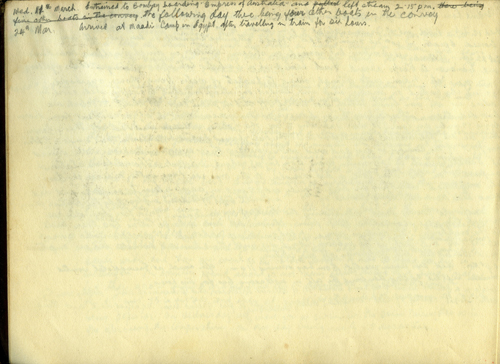 Click here to read a transcript. 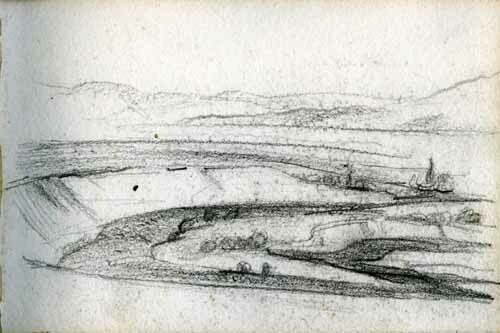 Charles recorded lanscapes. 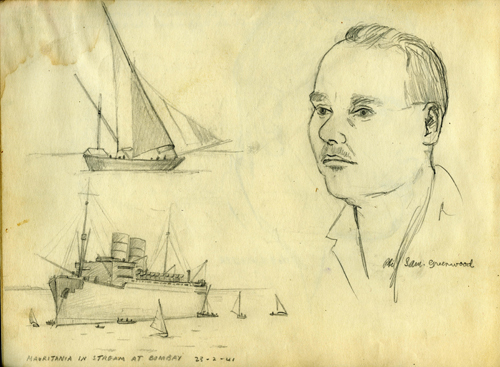 The earliest is in 1941 just before he embarked for Egypt. 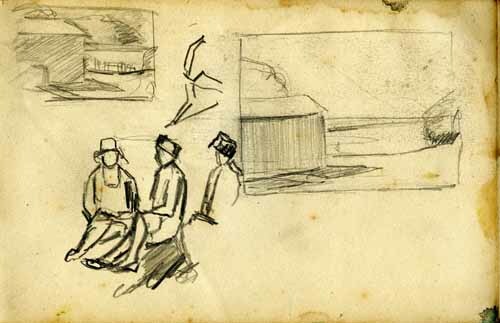 The sketches are not in chronologial order, suggesting he redrew them later, either from memory or from initial sketches recorded elsewhere. 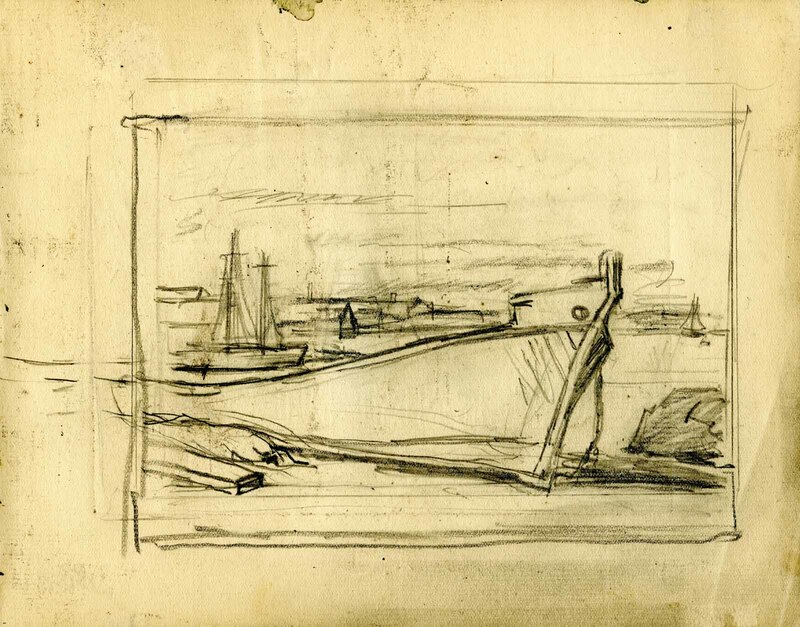 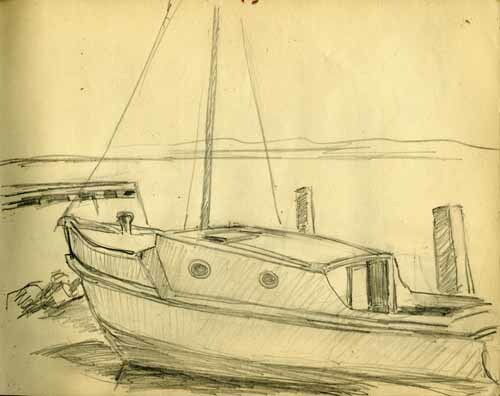 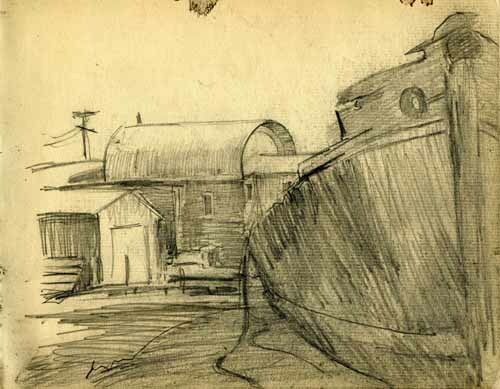 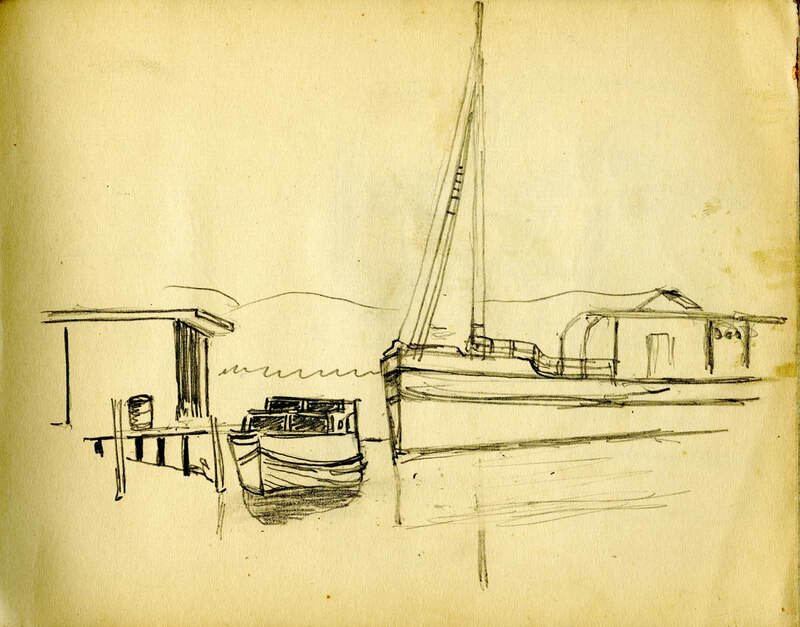 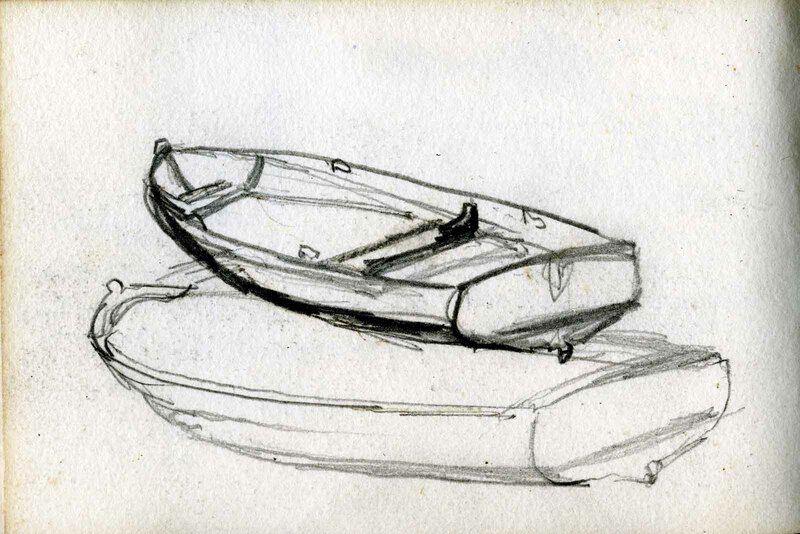 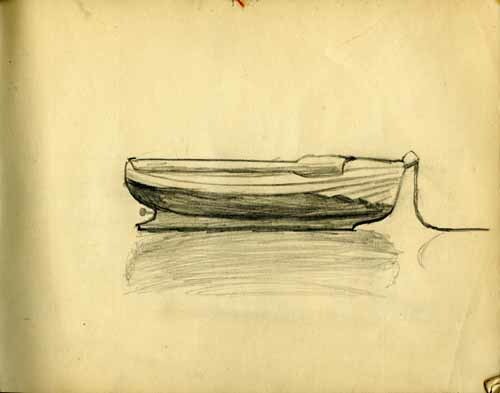 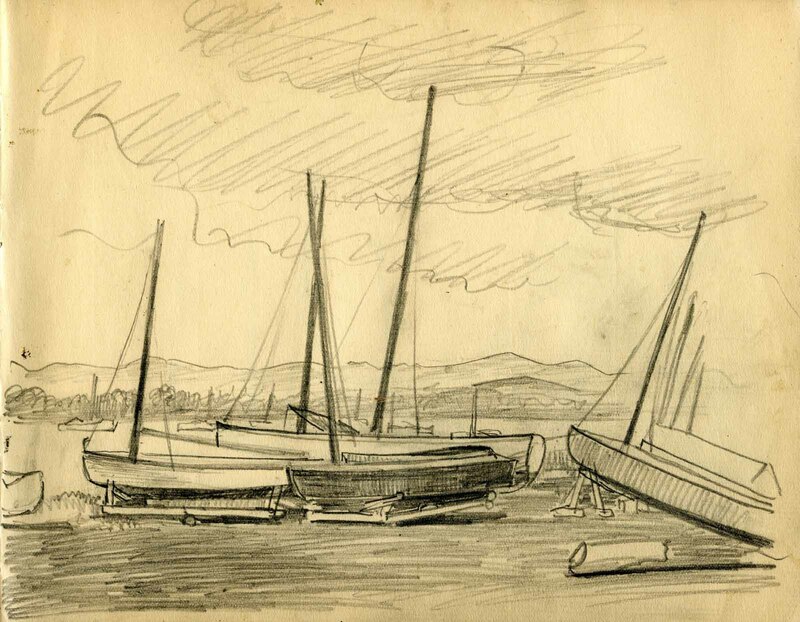 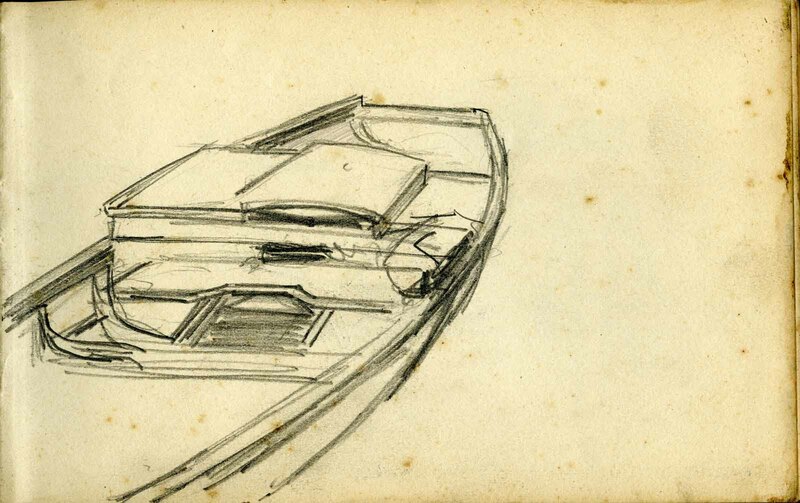 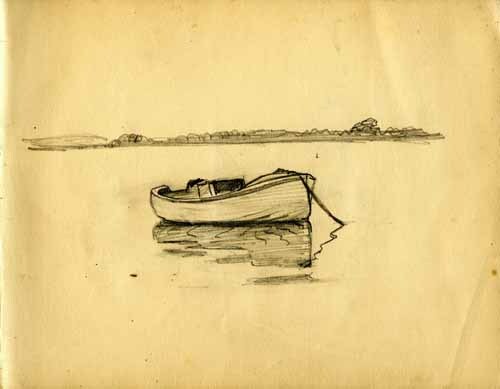 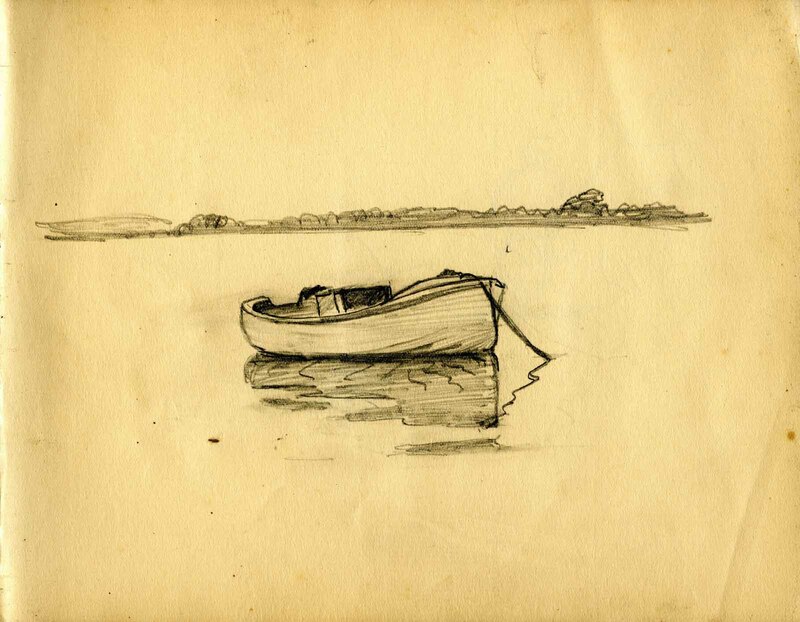 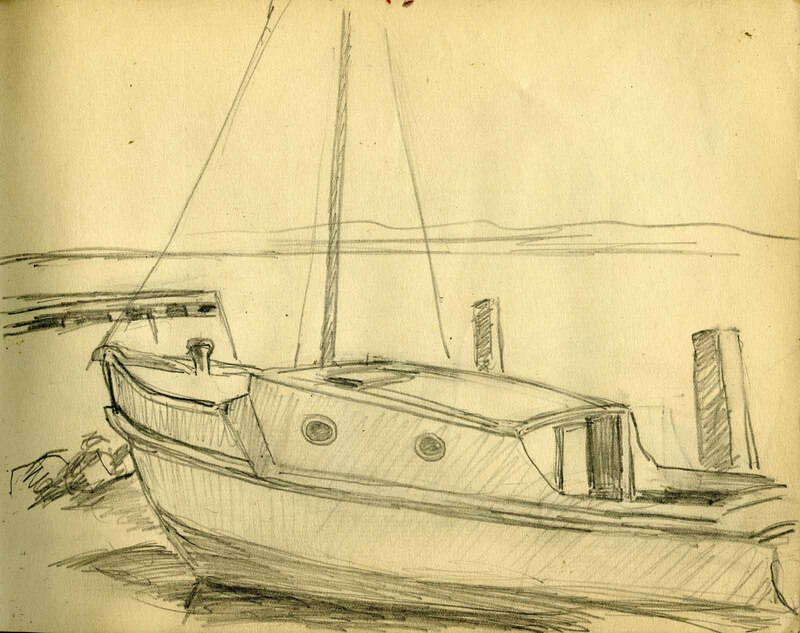 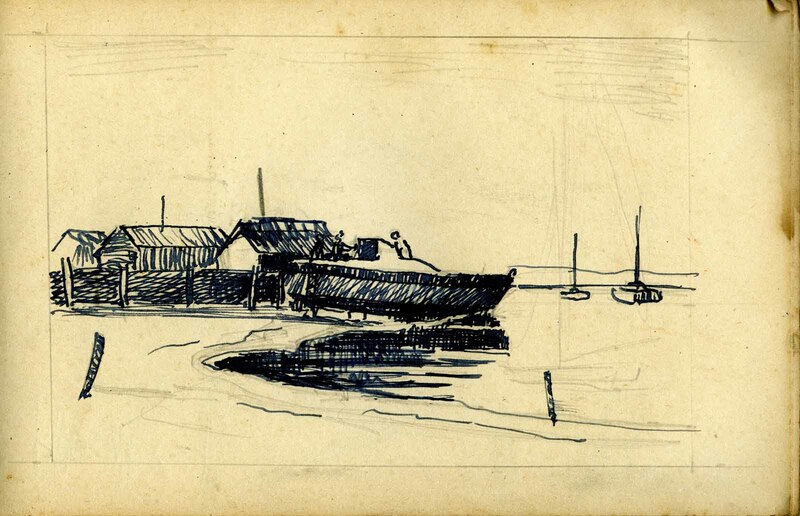 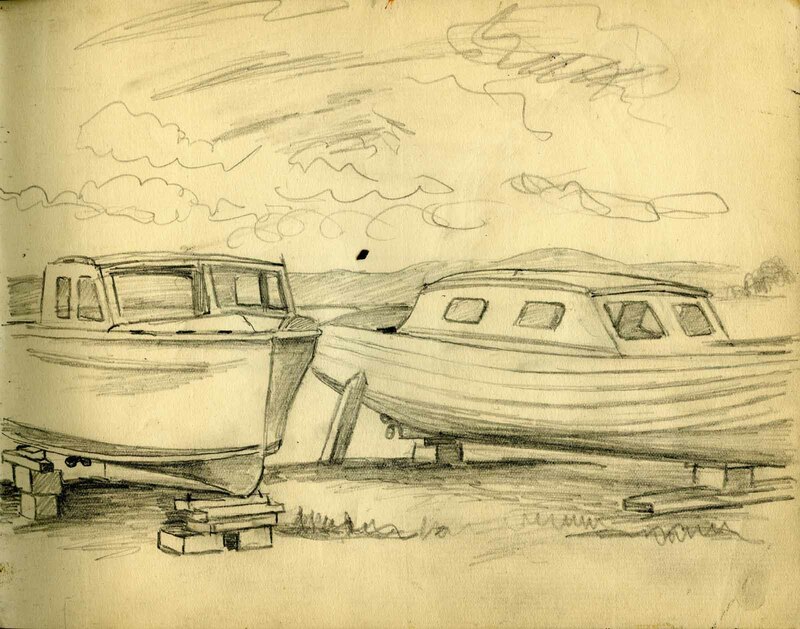 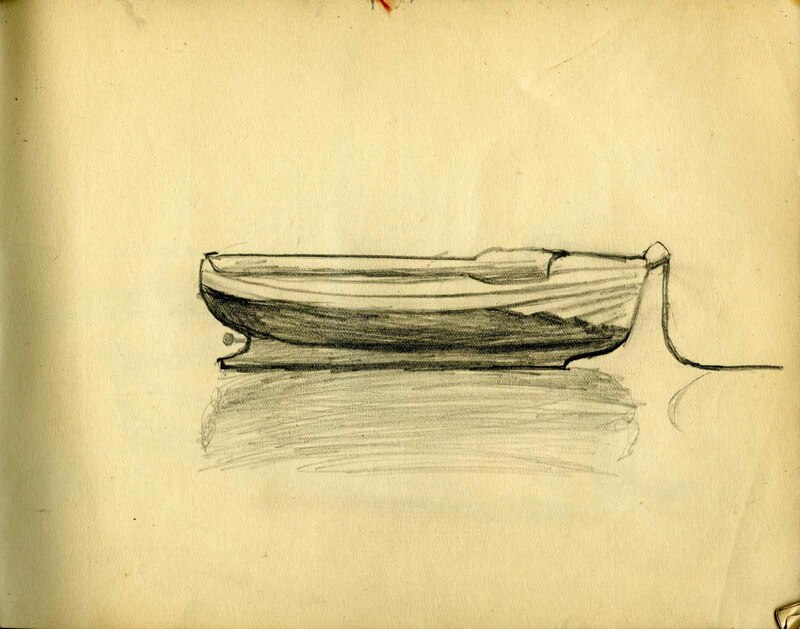 Throughout the sketchbooks are records of small boats, mostly yachts, boatsheds and other nautical themes.